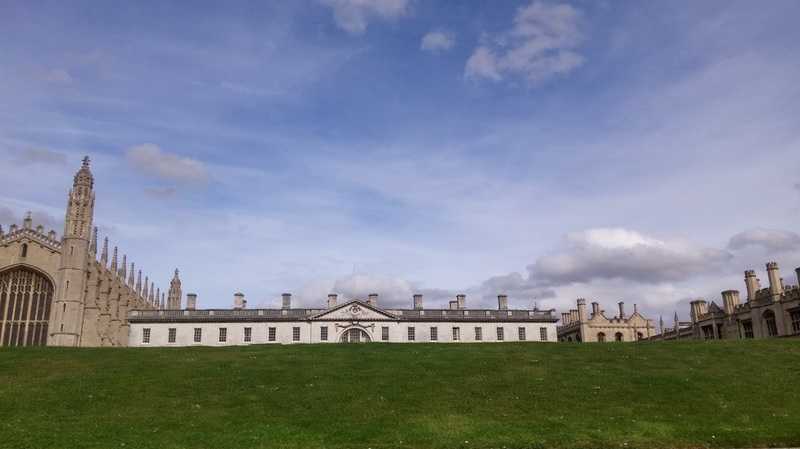 Organized by Cambridge Programmes, YWPS's Cambridge Study Tour 2015 is a perfect graduation experience for the 13 graduates of ours. 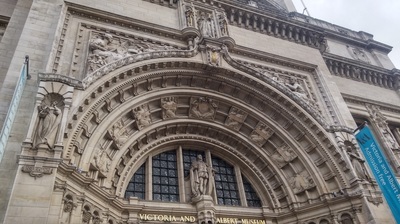 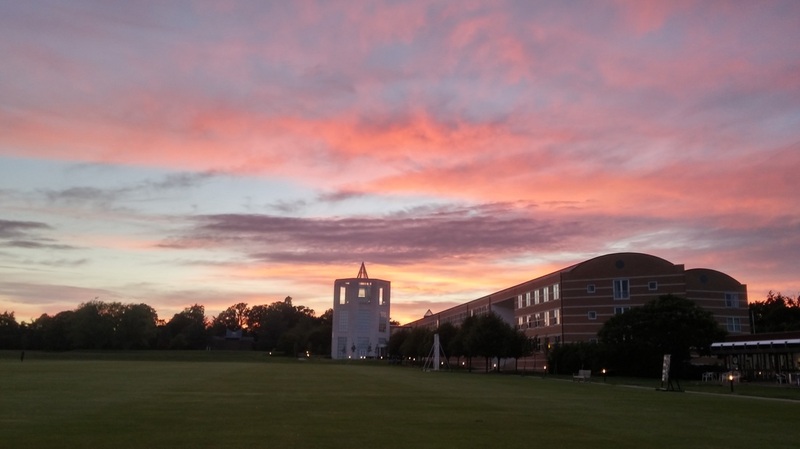 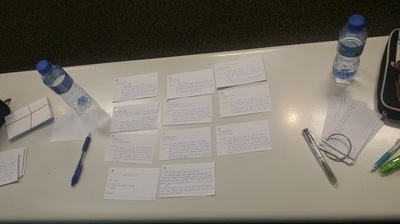 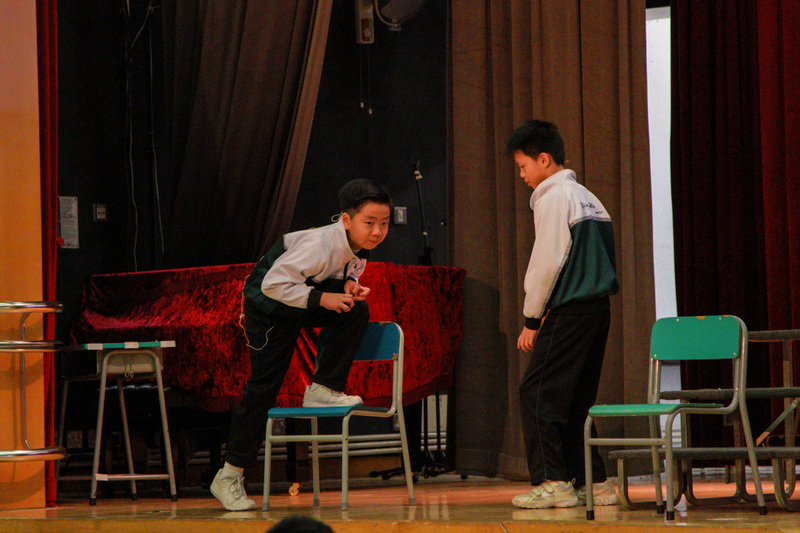 From the over 500 photos taken in the 2 weeks, below are the selected highlights. And you can always click here to experience their exciting journey through their words. 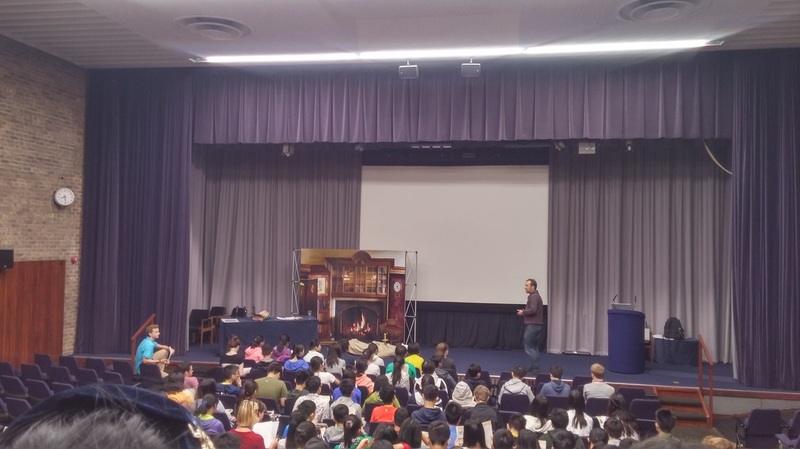 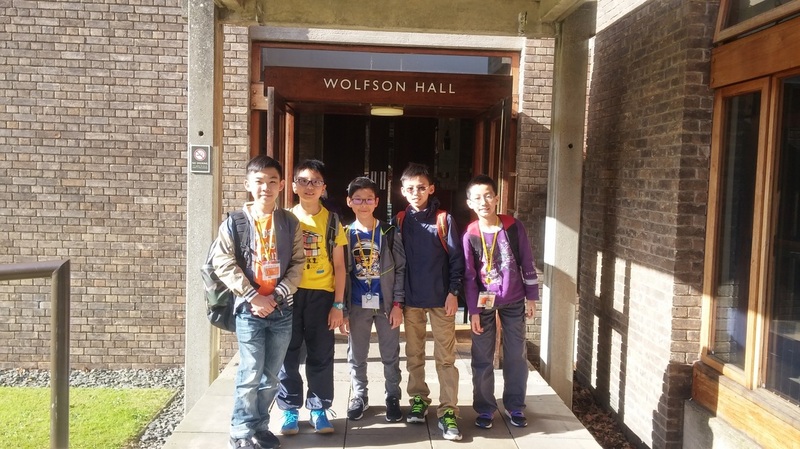 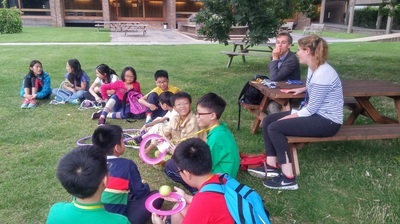 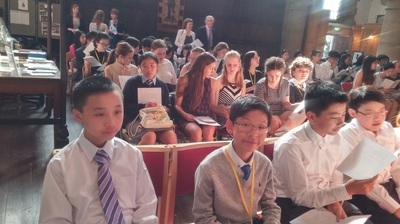 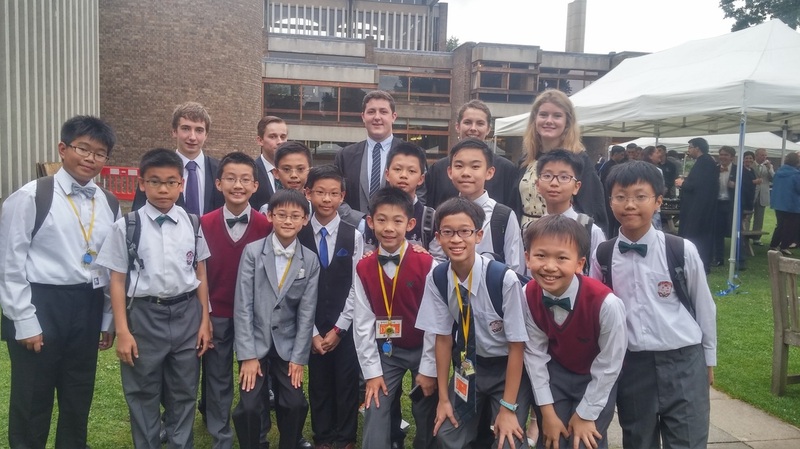 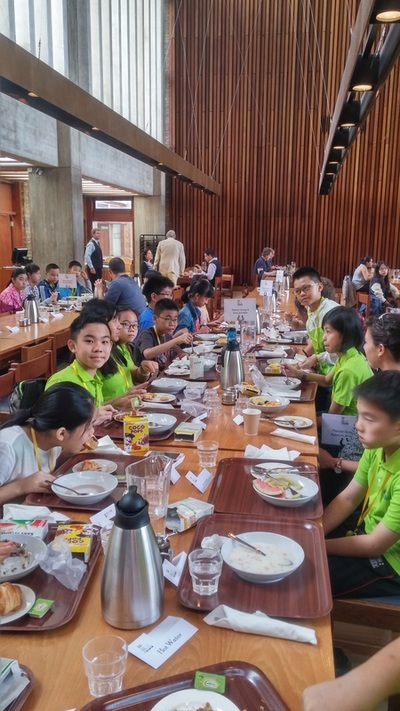 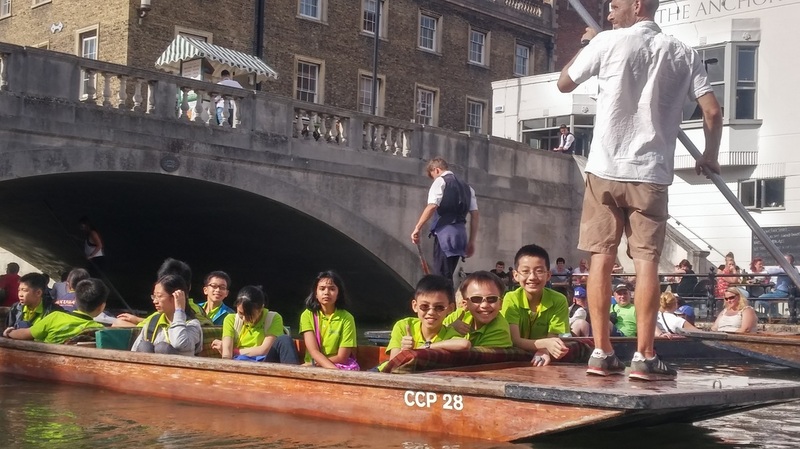 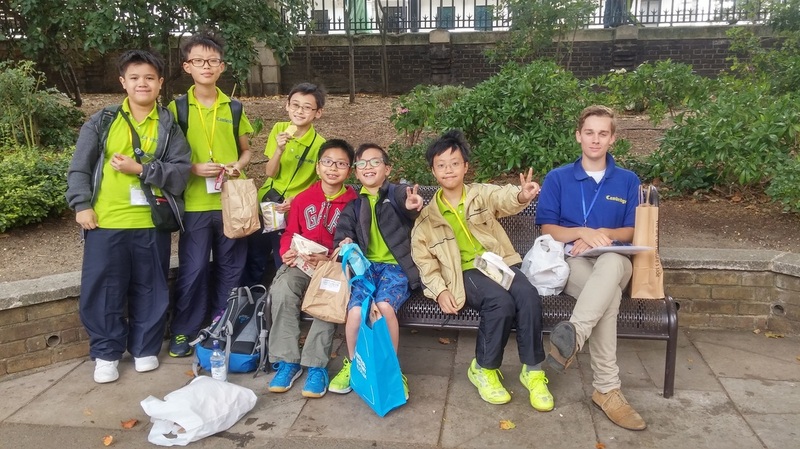 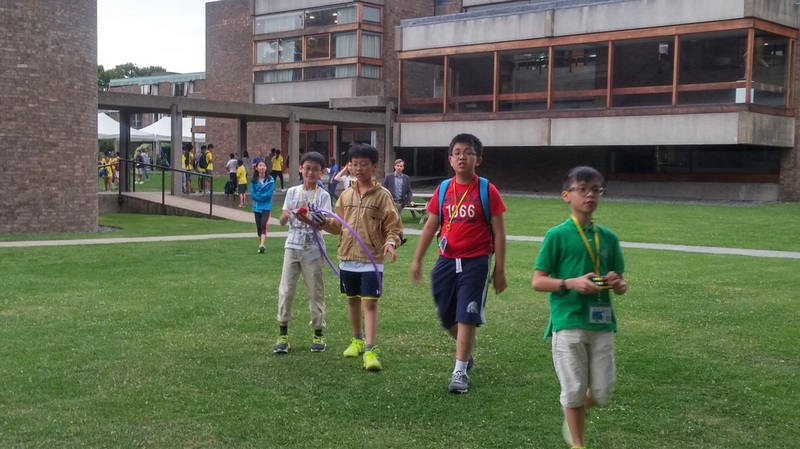 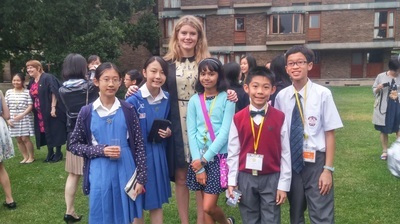 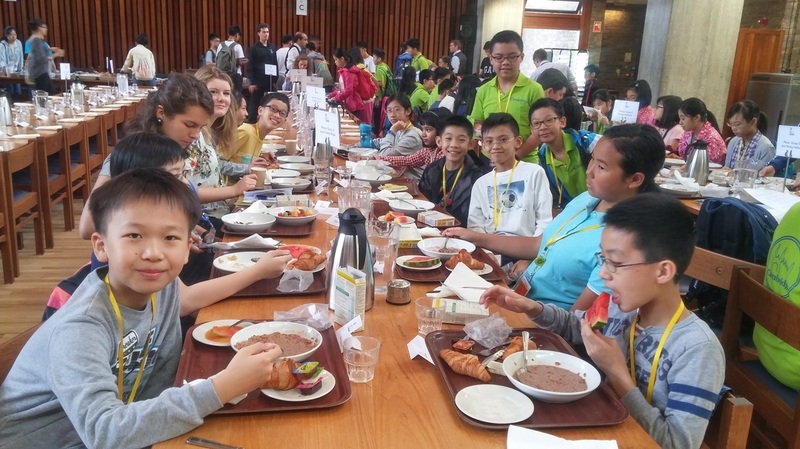 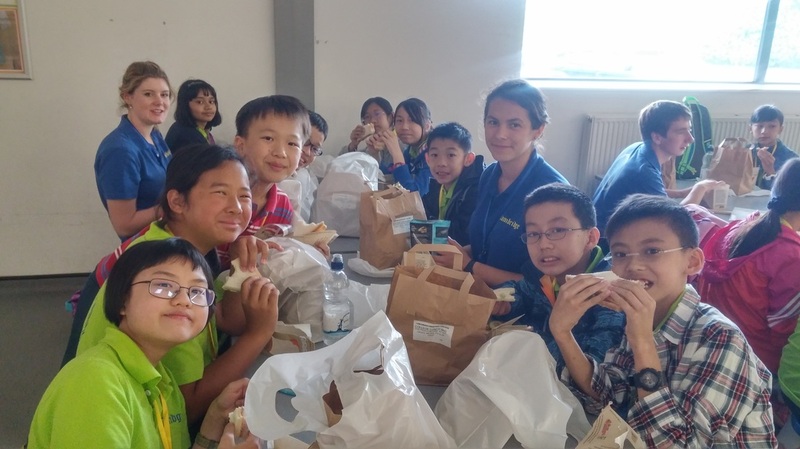 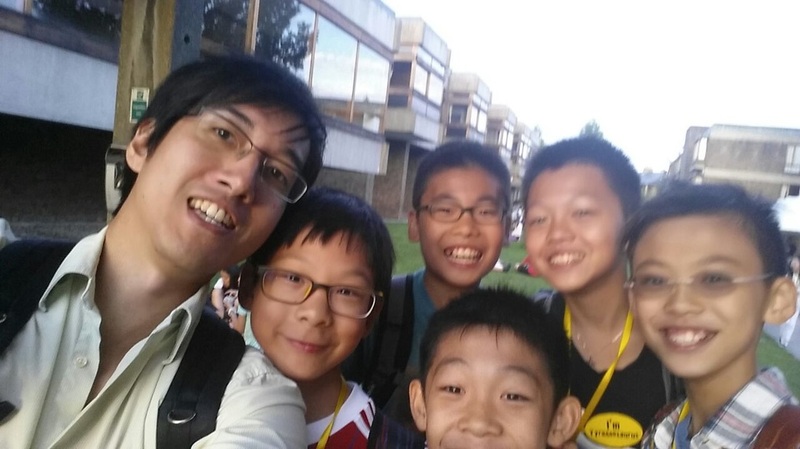 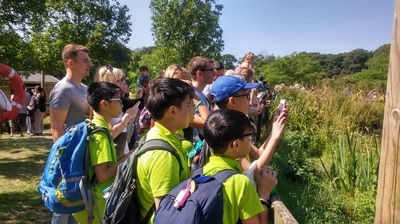 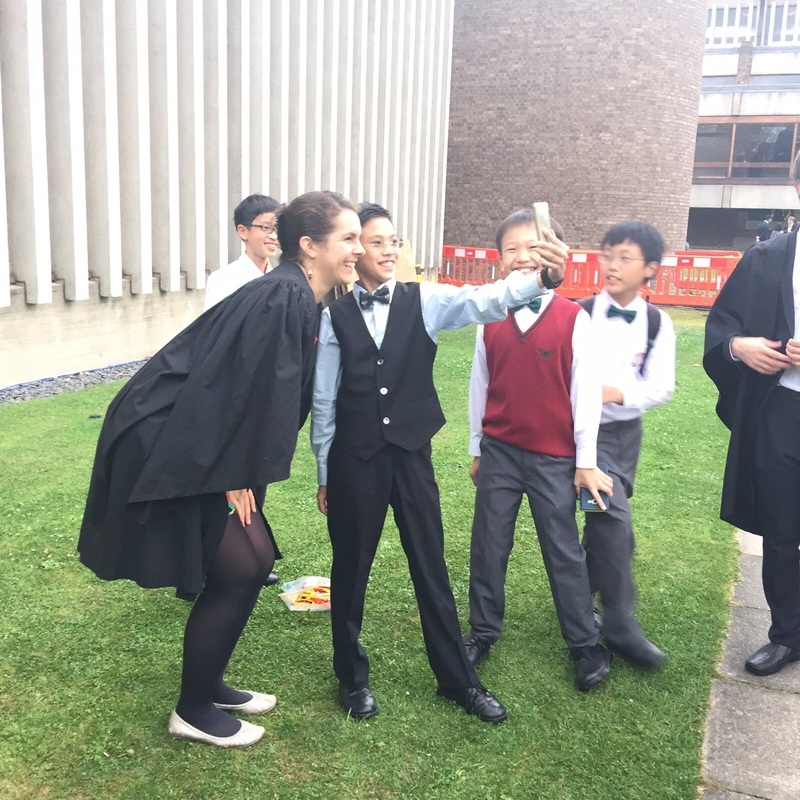 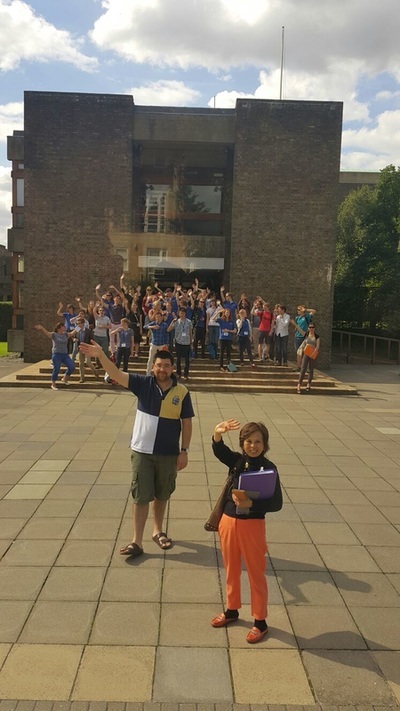 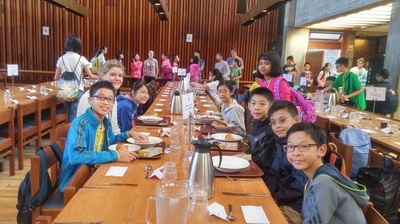 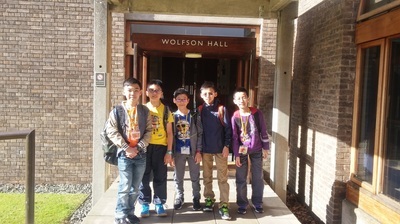 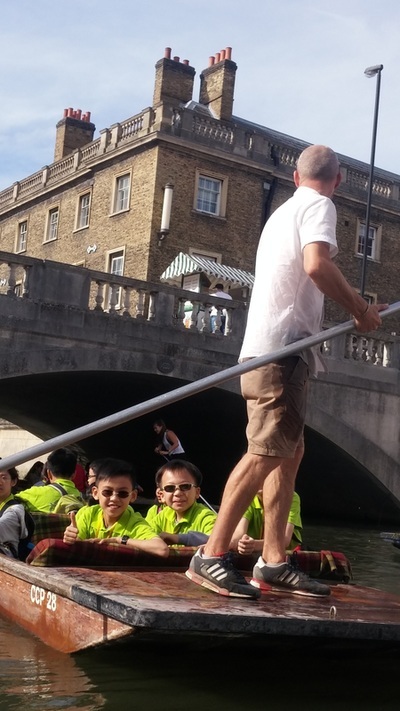 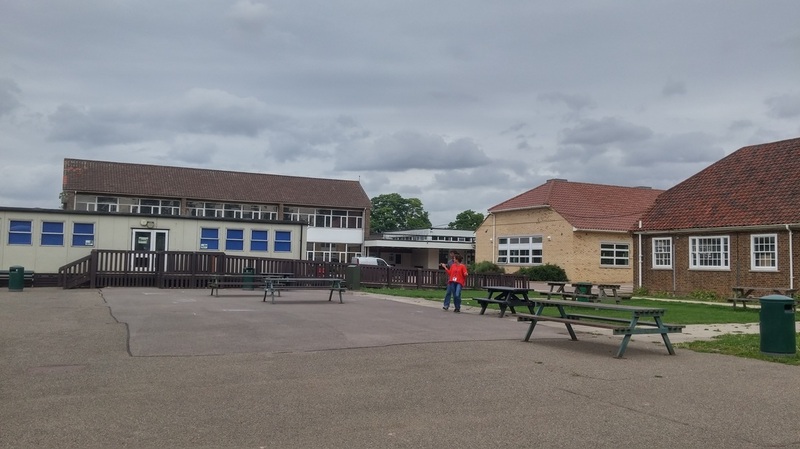 YWPS and YWC at Cambridge! 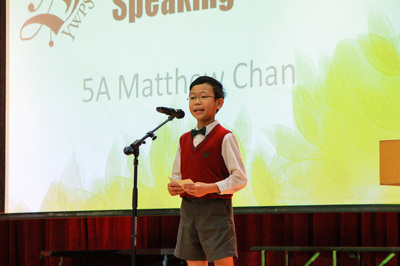 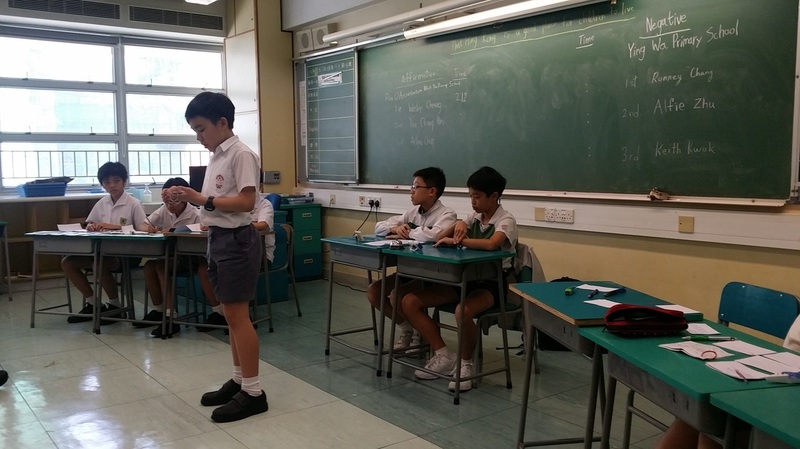 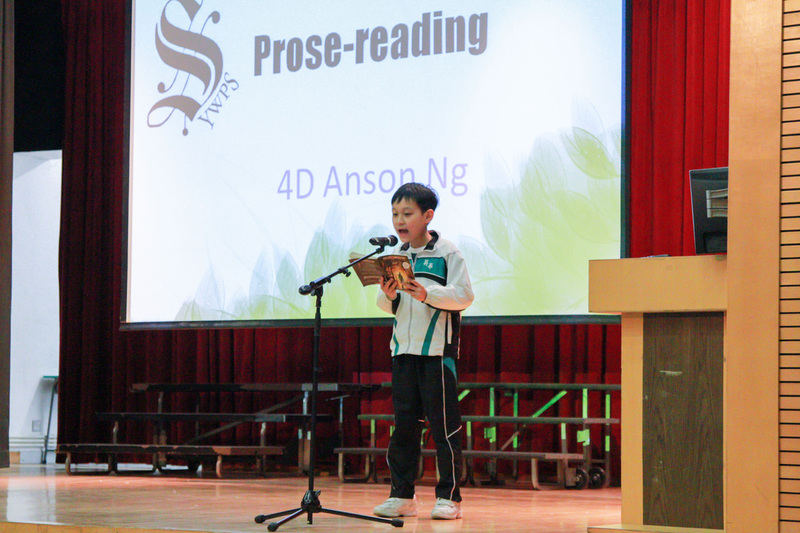 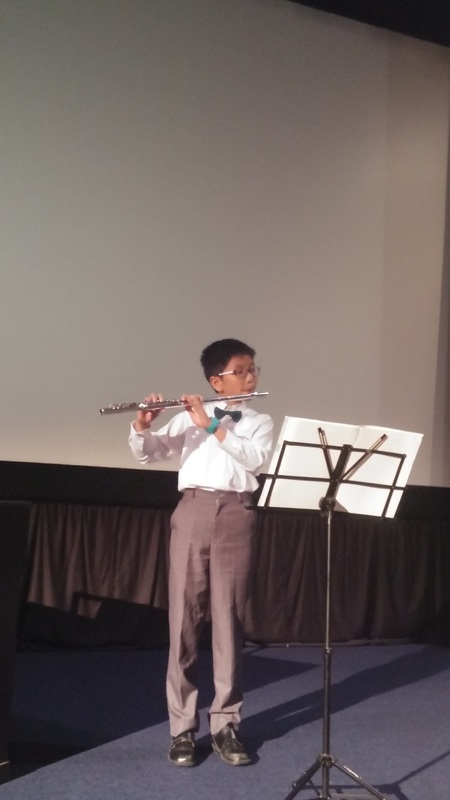 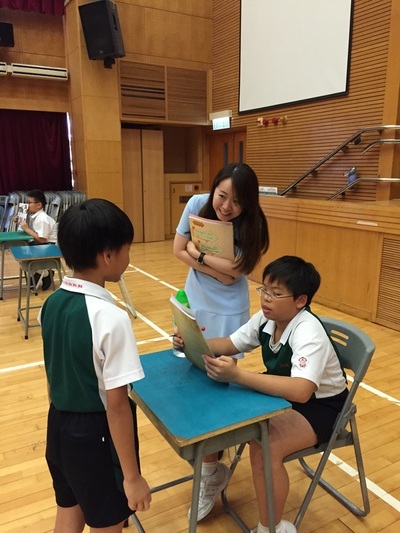 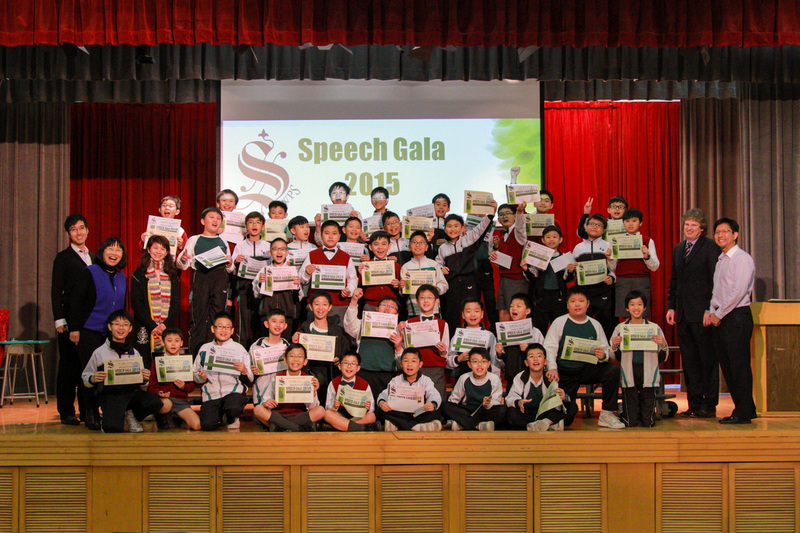 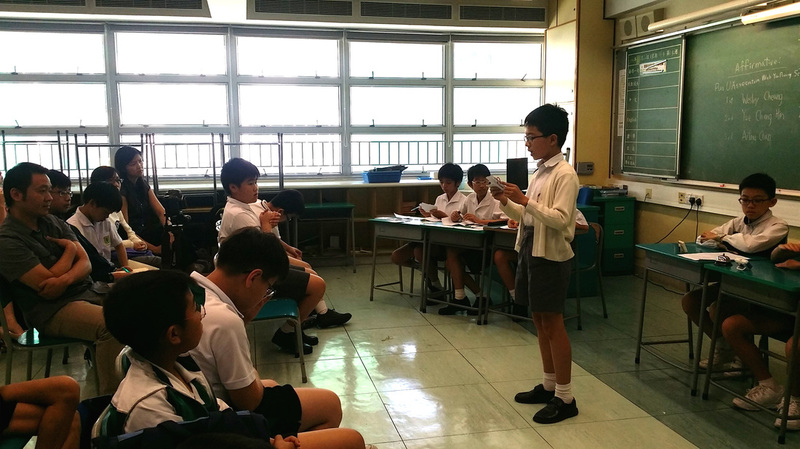 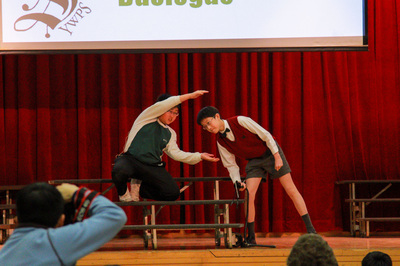 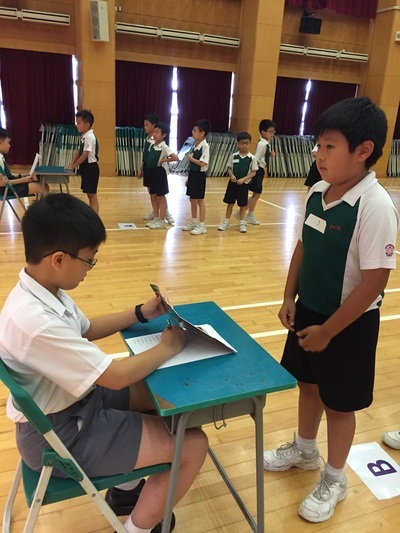 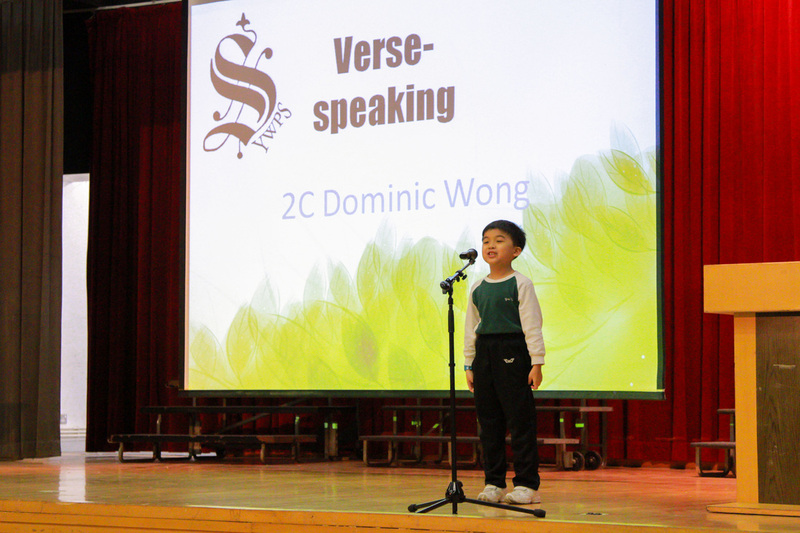 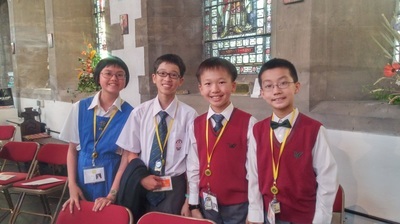 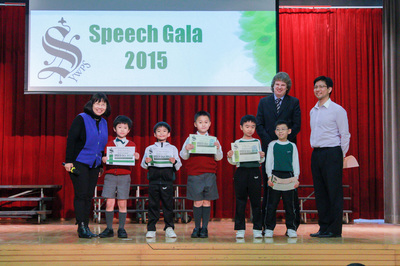 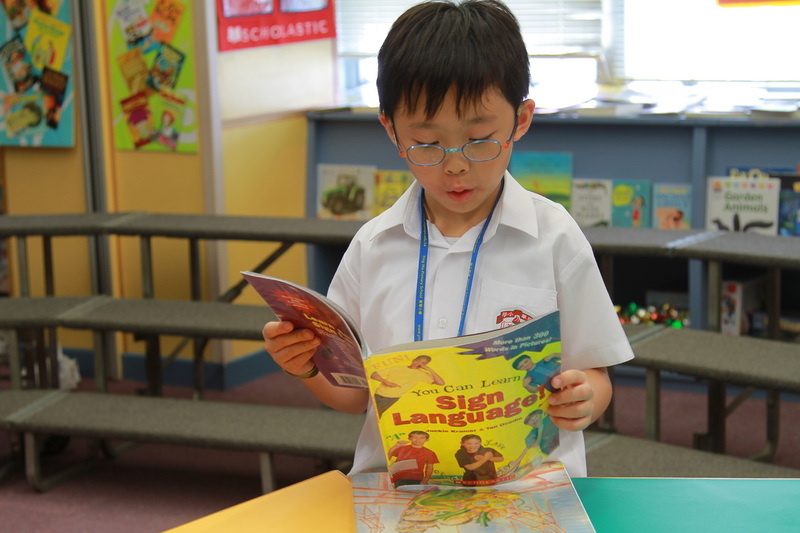 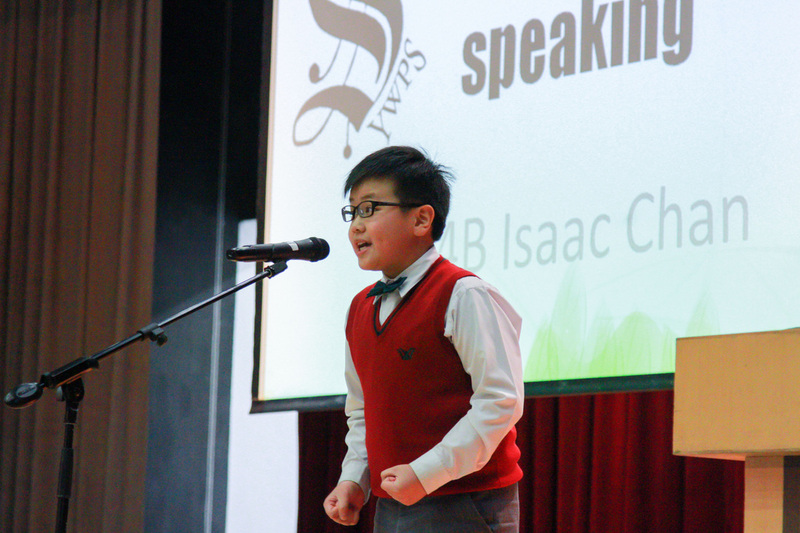 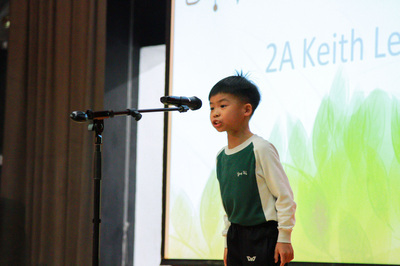 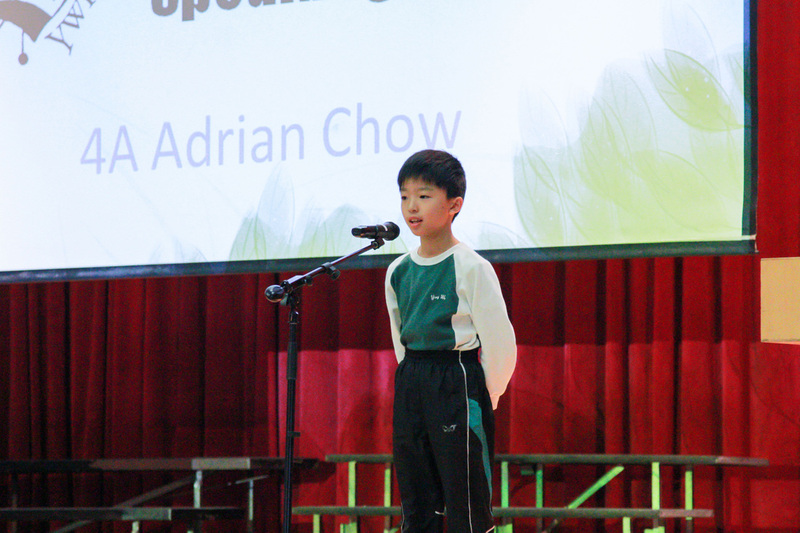 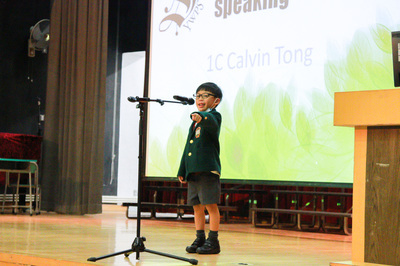 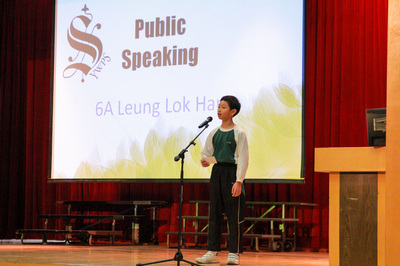 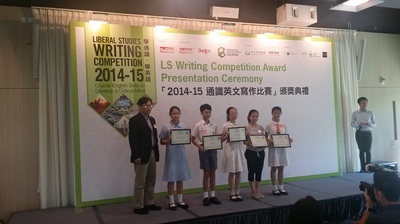 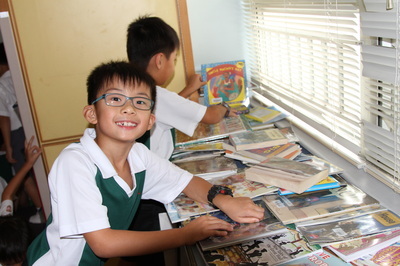 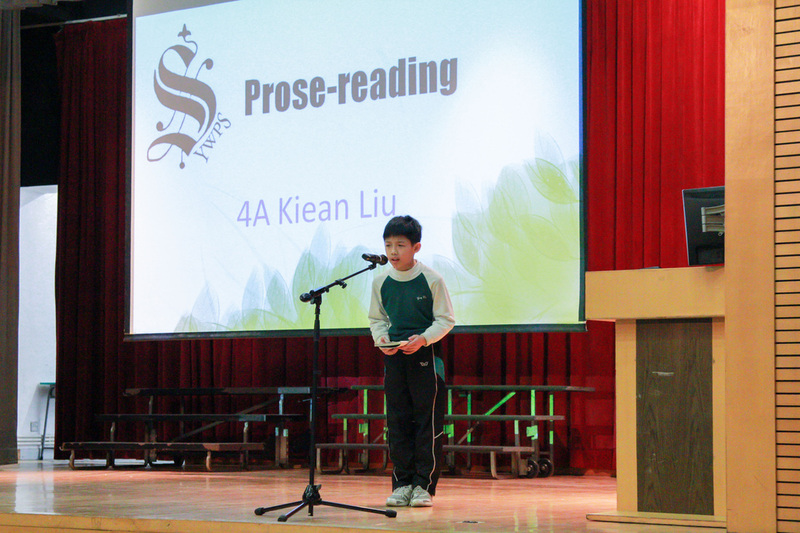 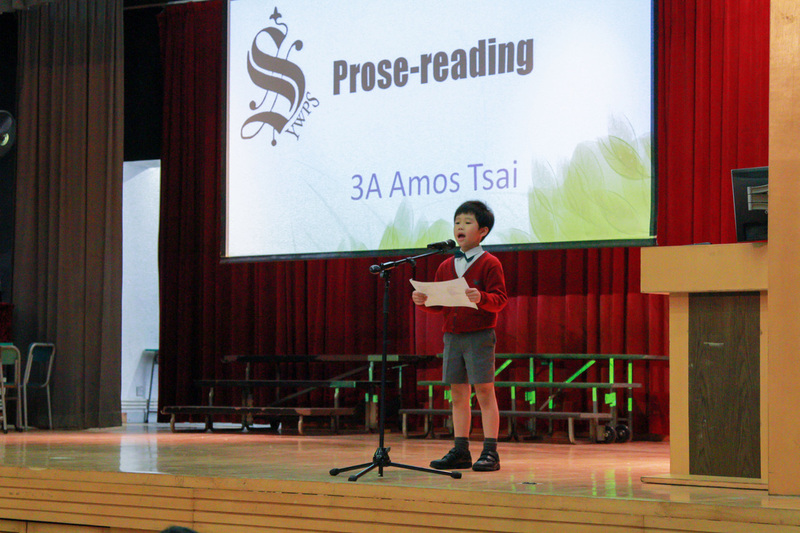 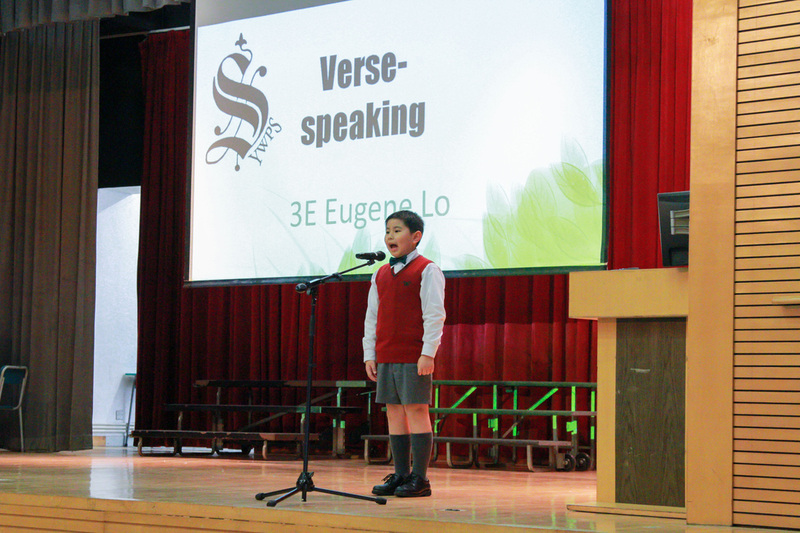 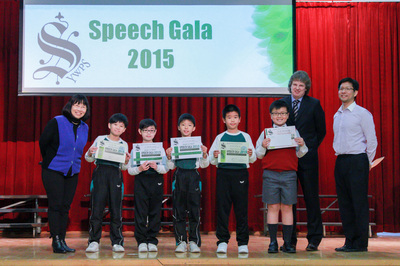 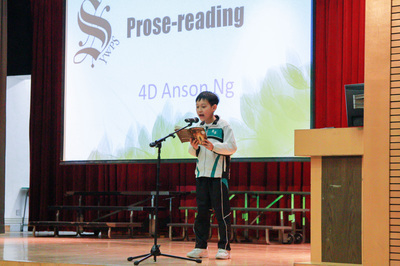 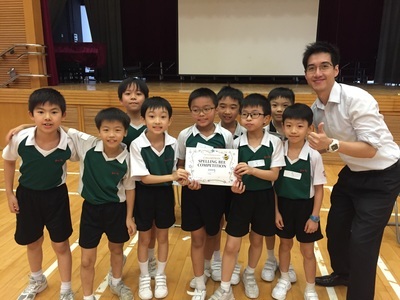 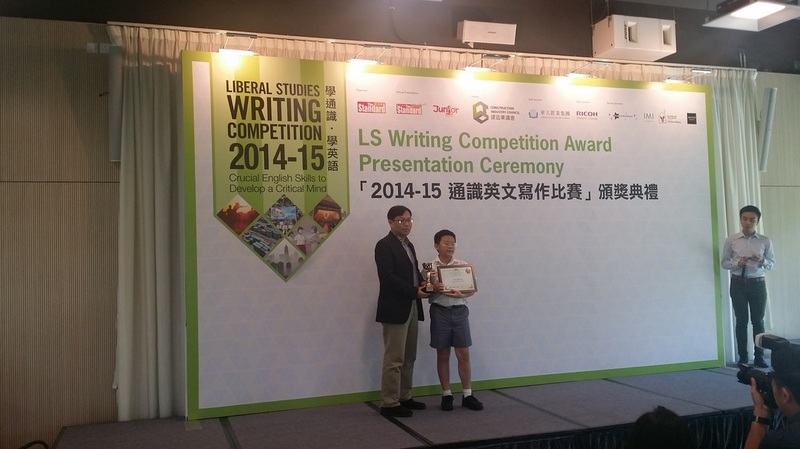 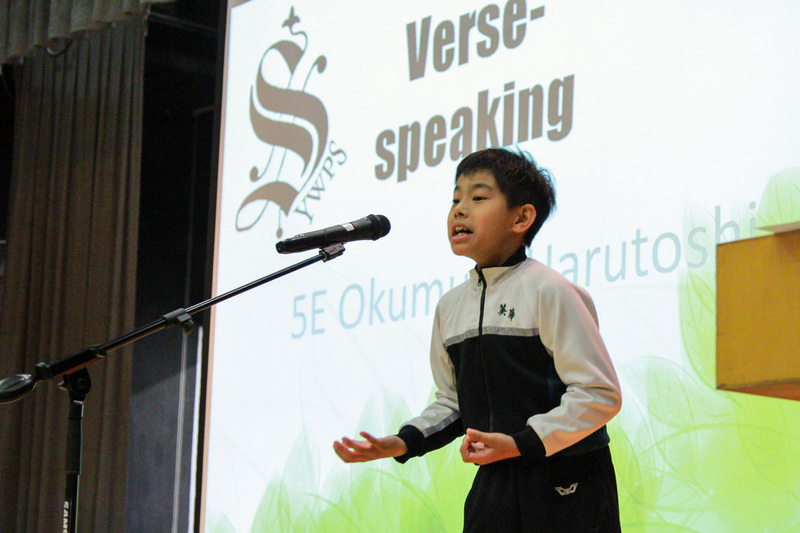 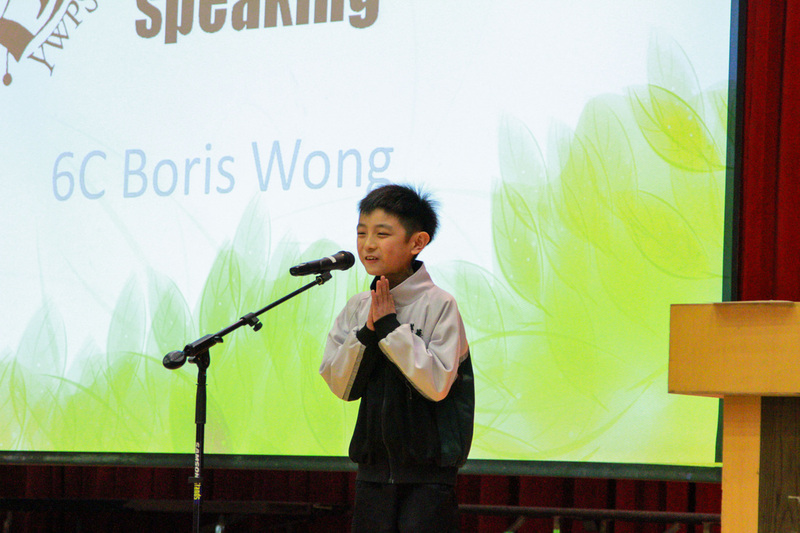 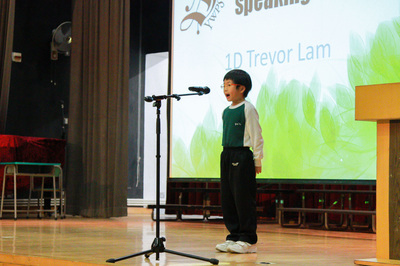 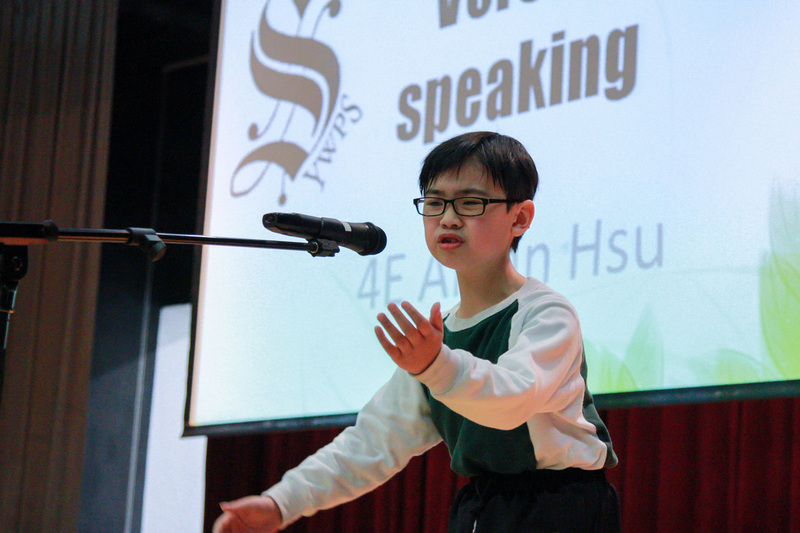 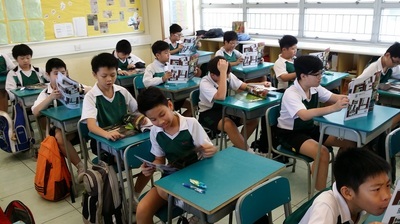 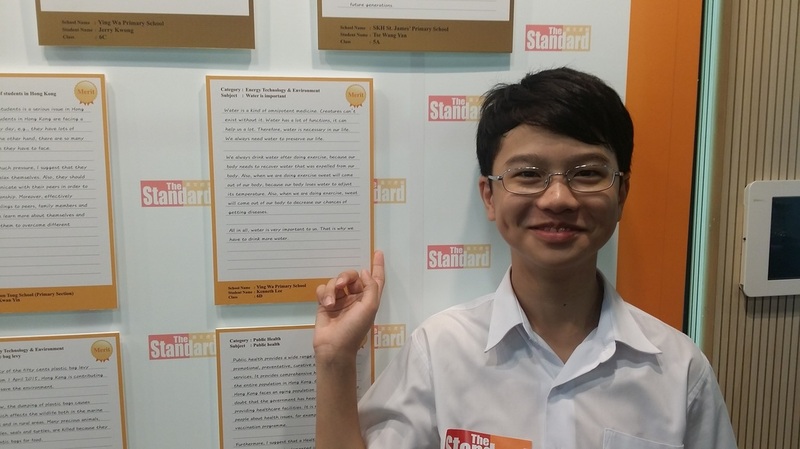 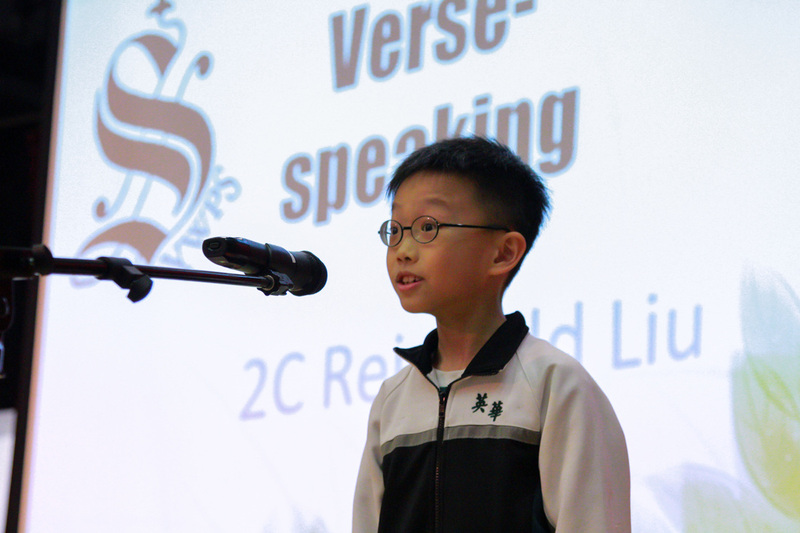 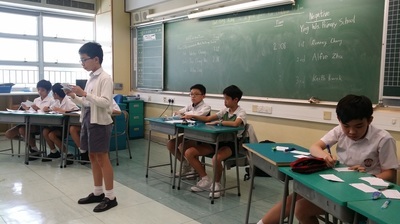 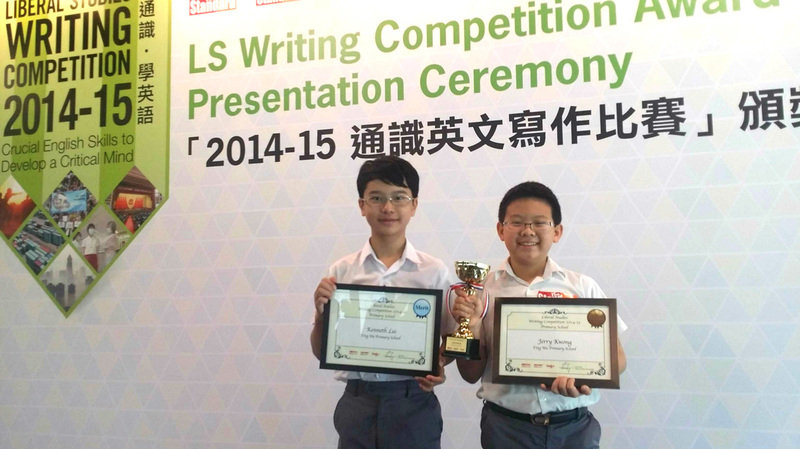 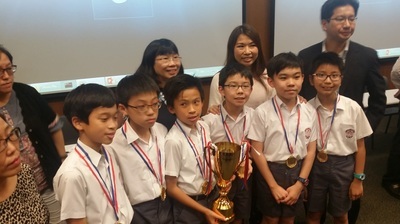 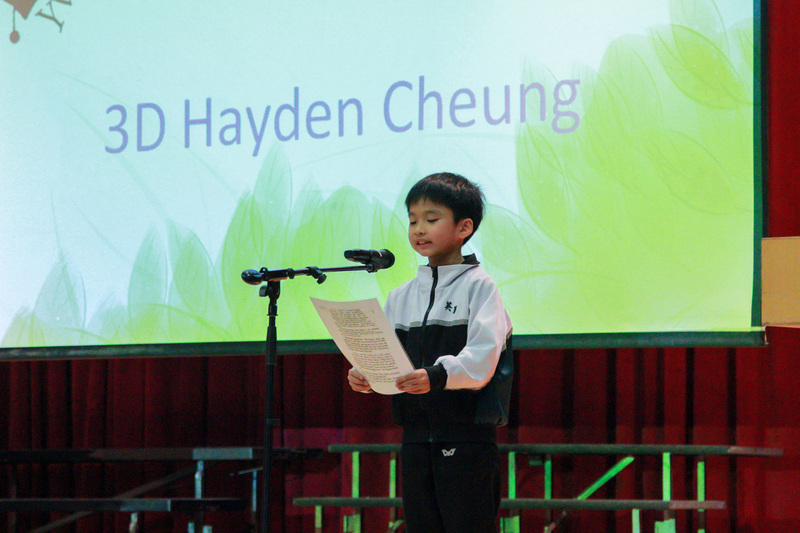 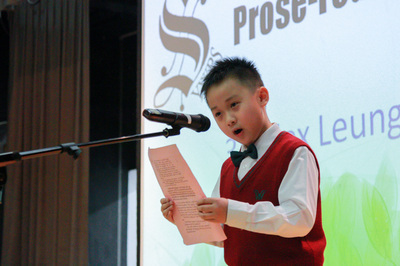 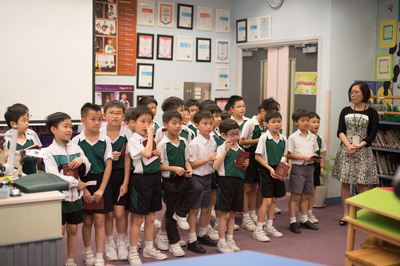 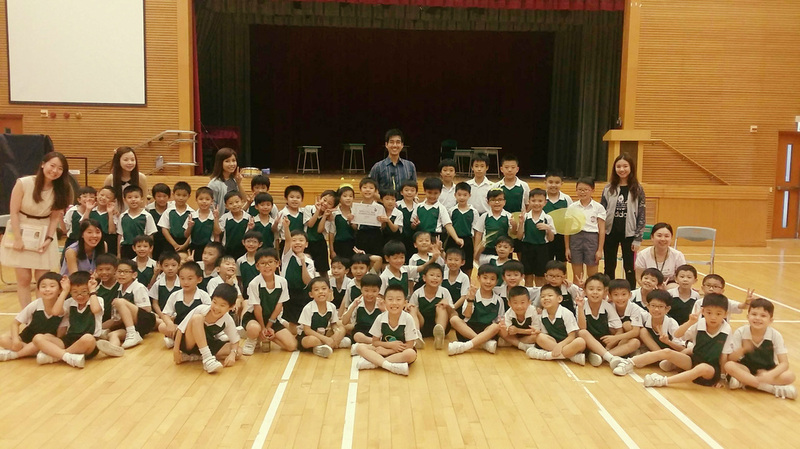 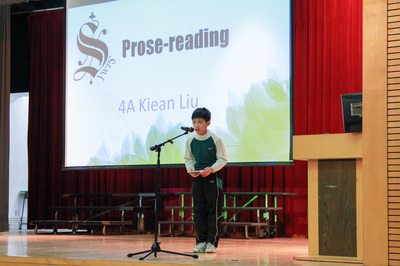 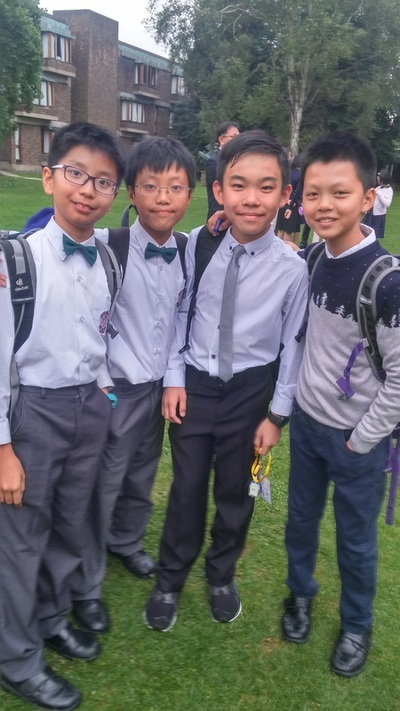 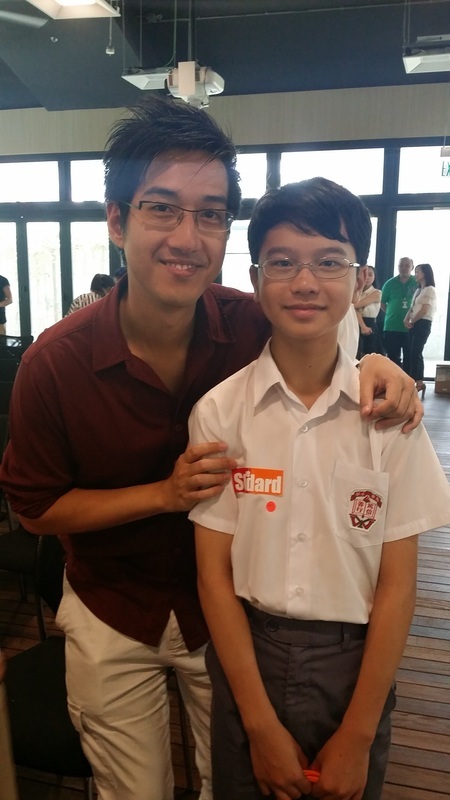 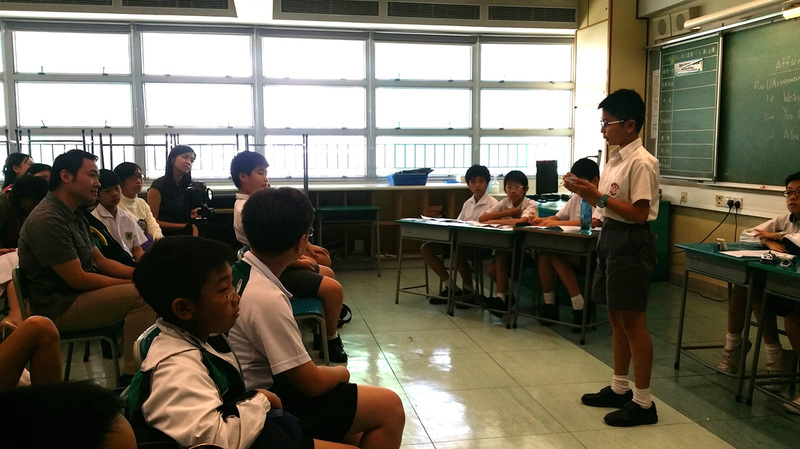 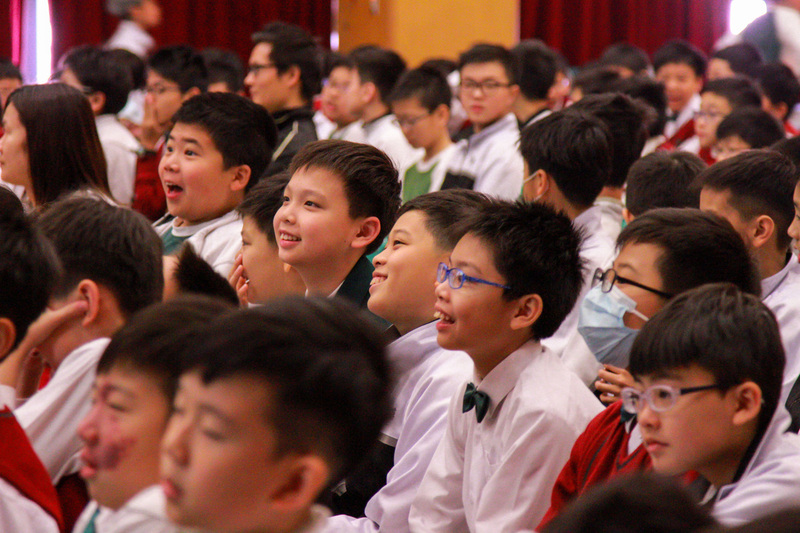 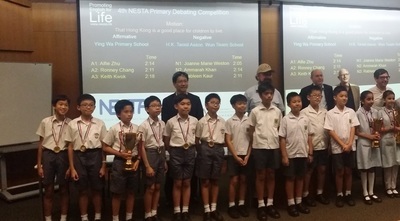 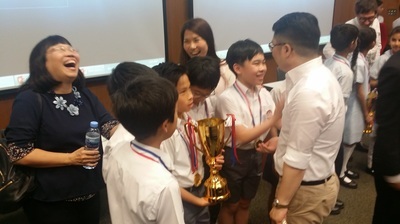 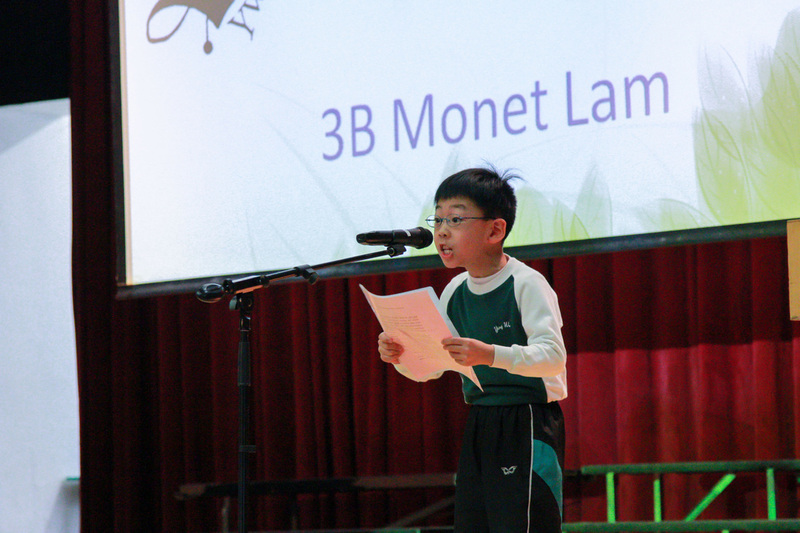 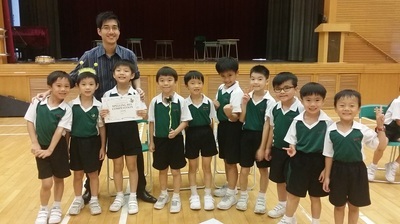 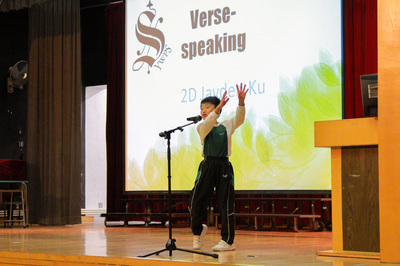 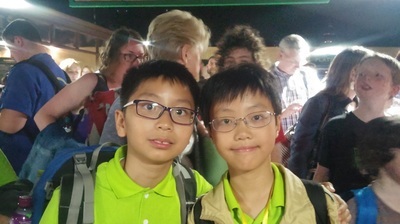 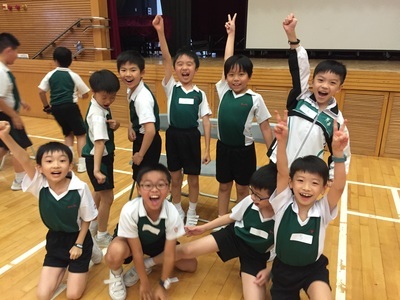 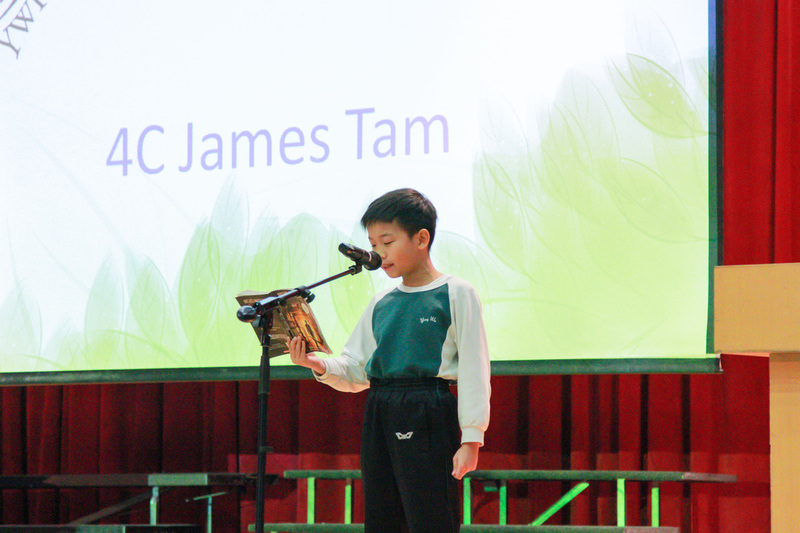 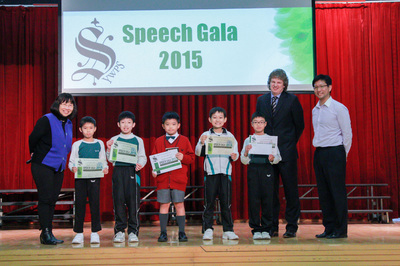 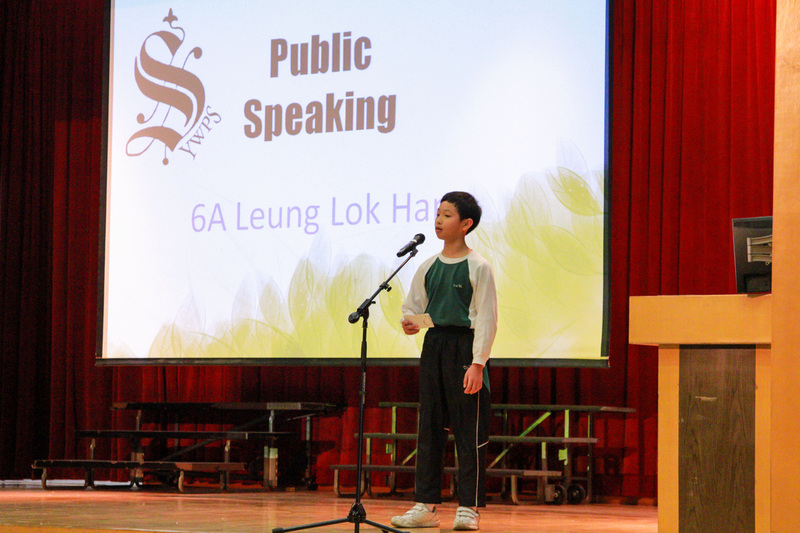 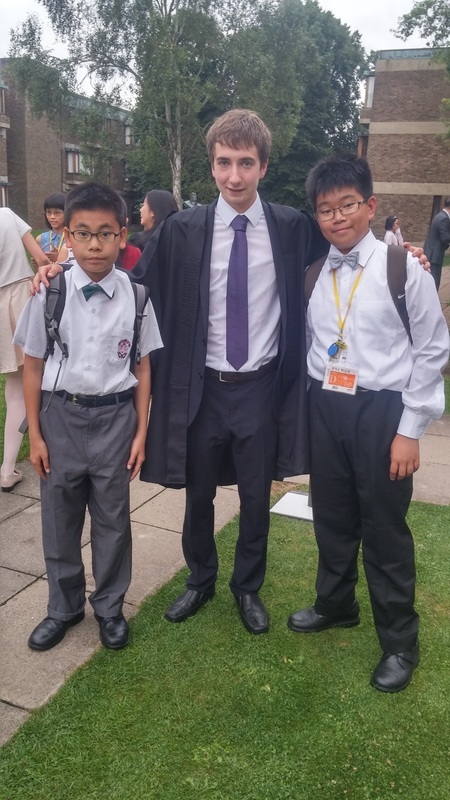 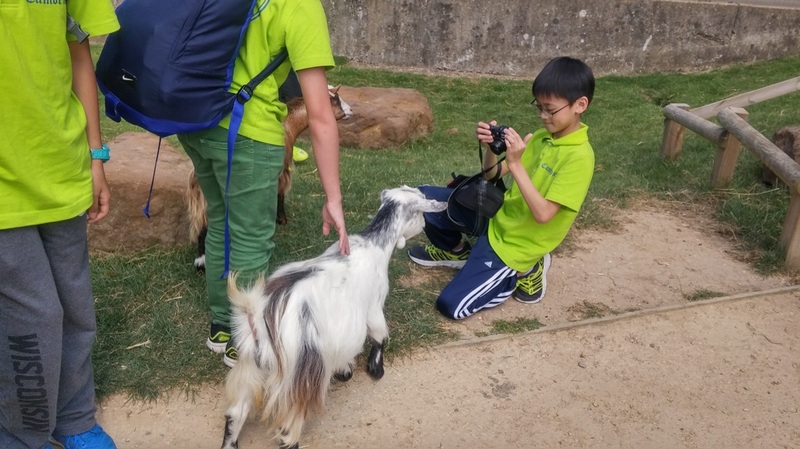 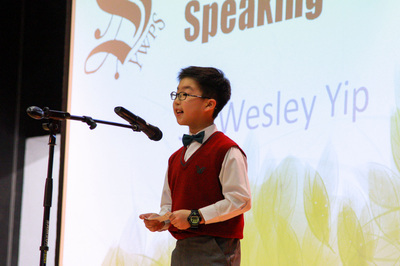 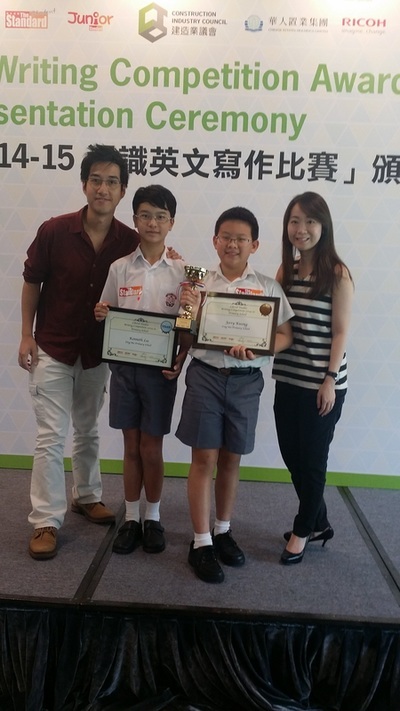 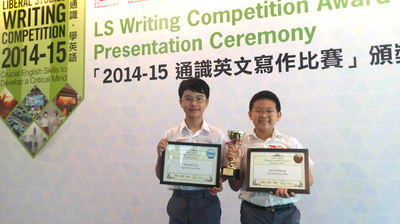 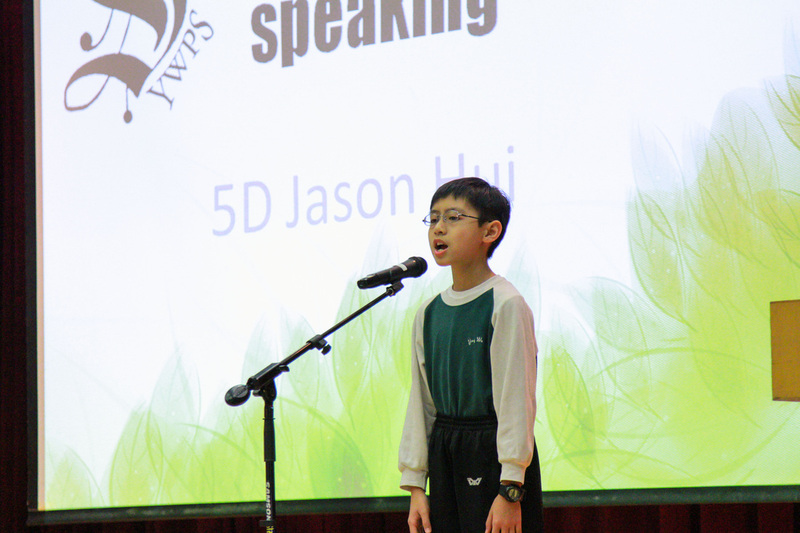 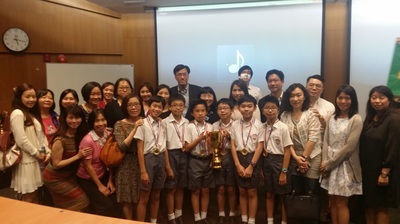 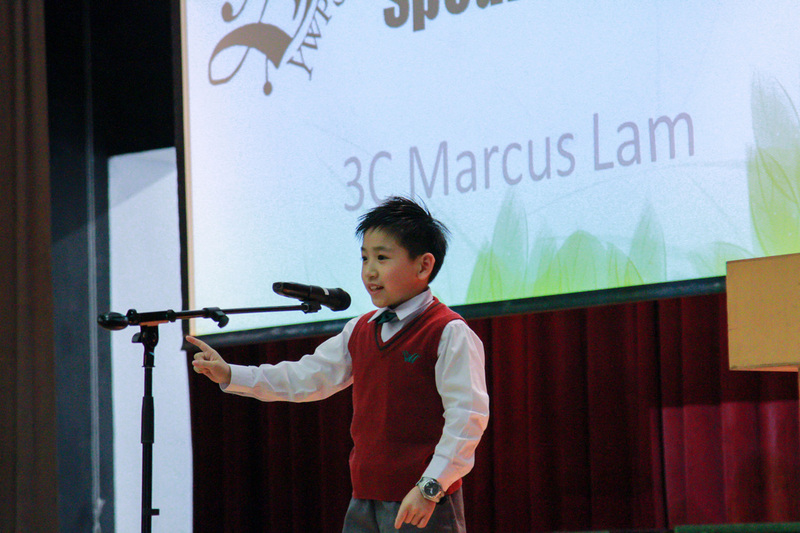 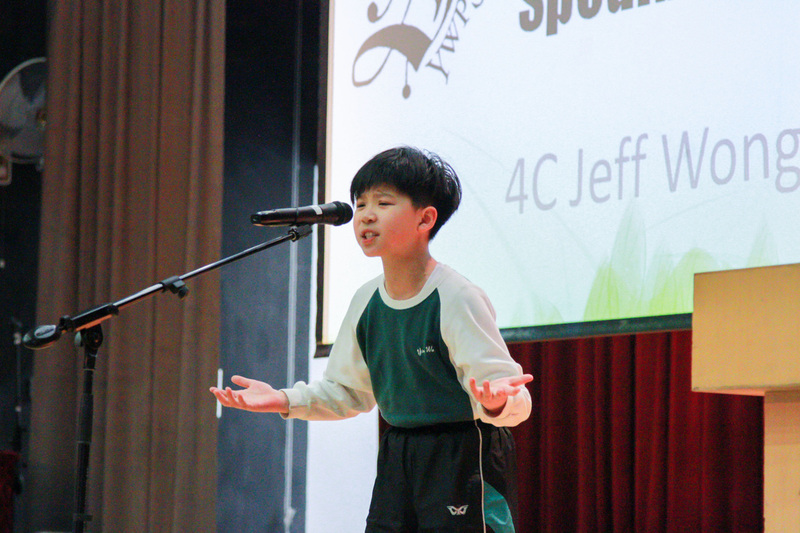 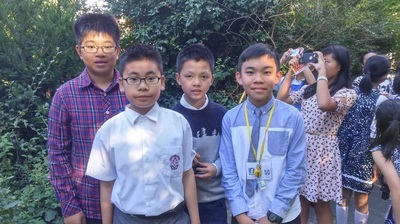 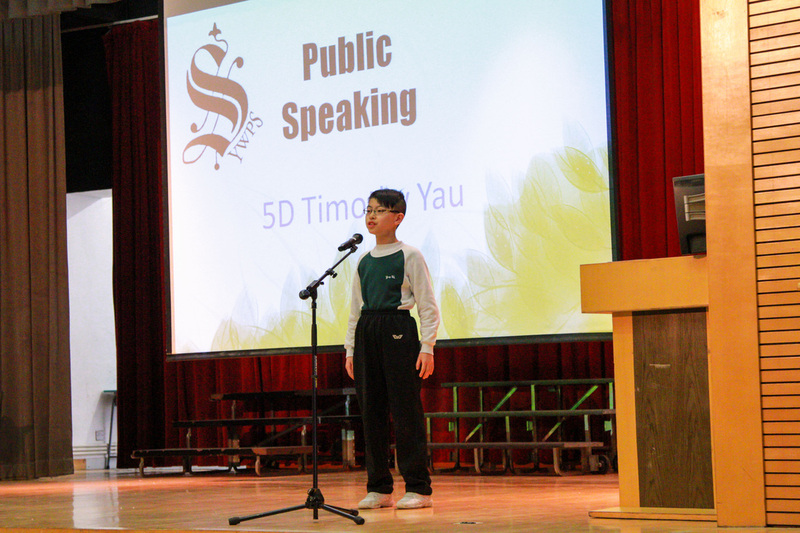 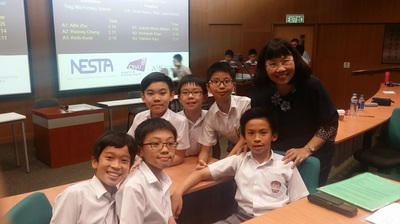 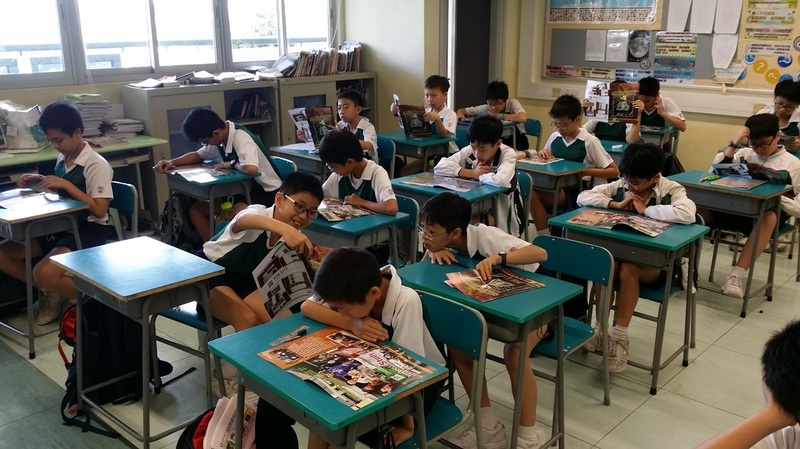 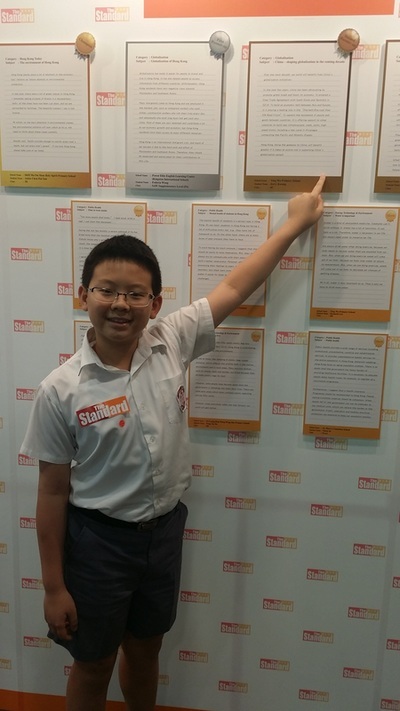 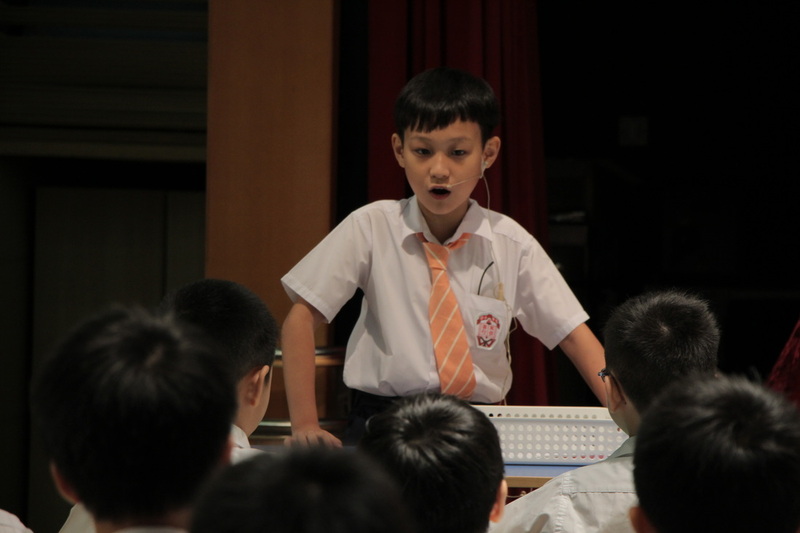 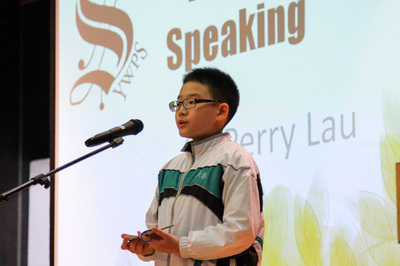 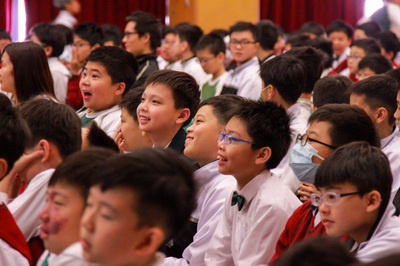 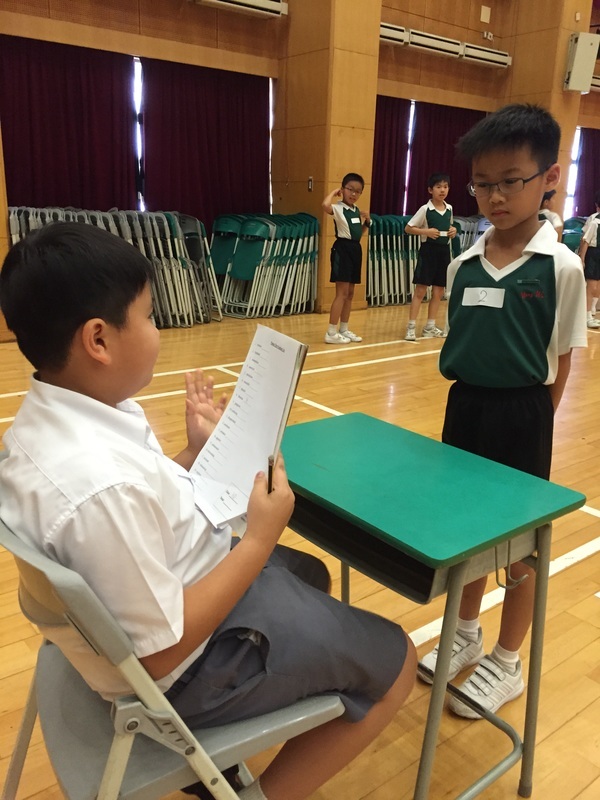 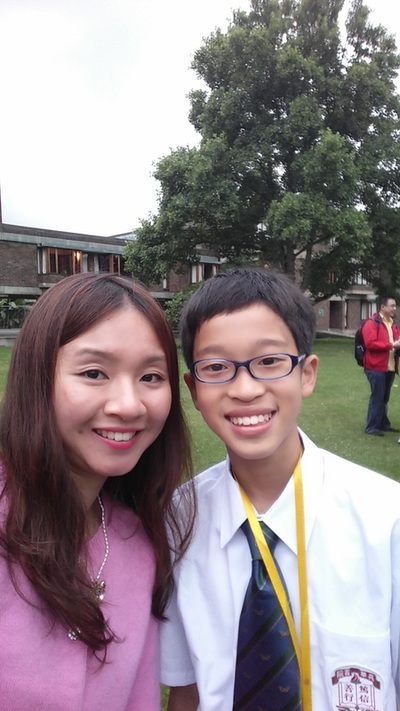 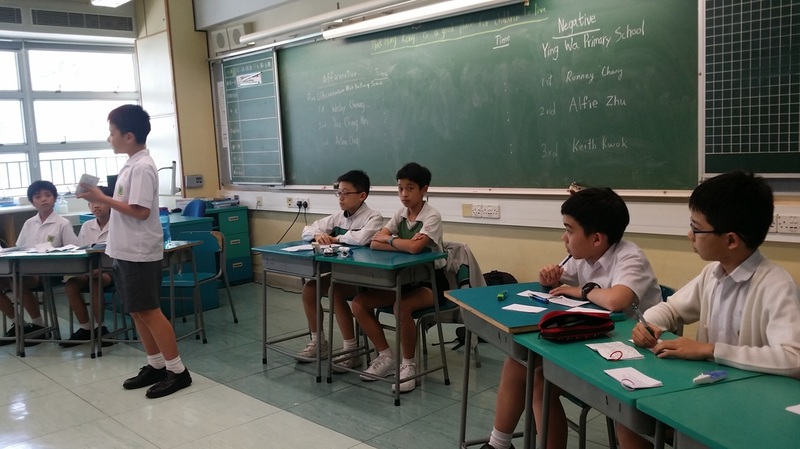 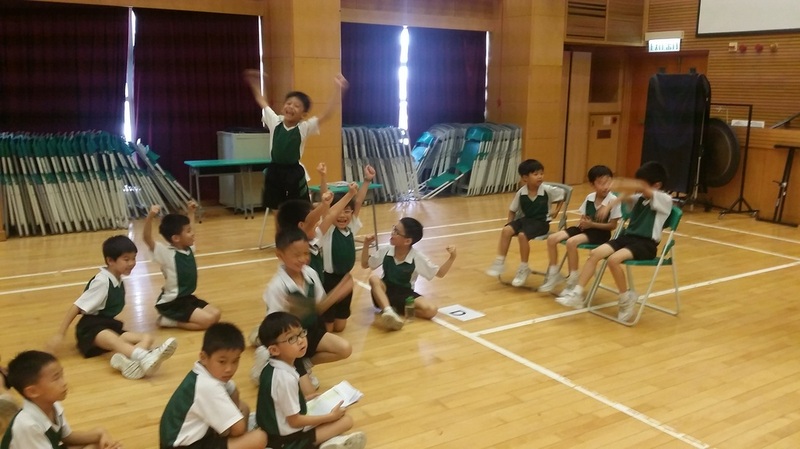 Jerry Kwong (6C) came Third while Kenneth Lee (6D) received a Merit at the LS Writing Competition 2014-15 Award Presentation Ceremony held on 11 July 2015. 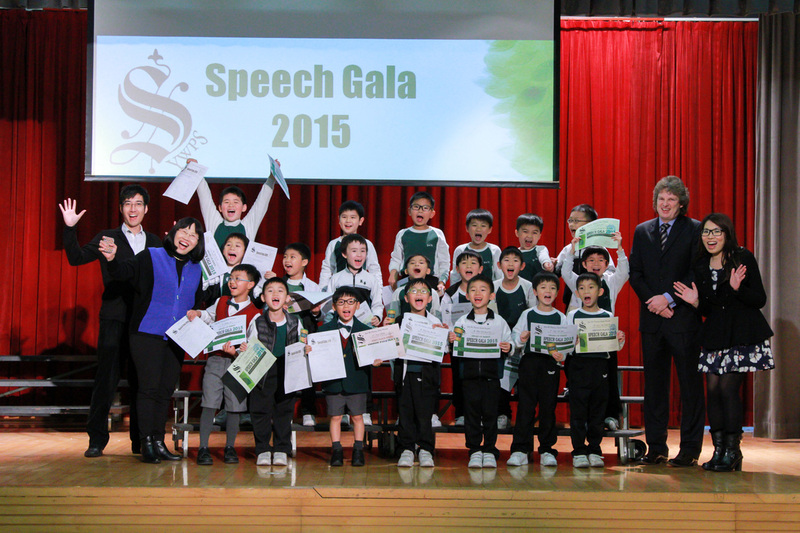 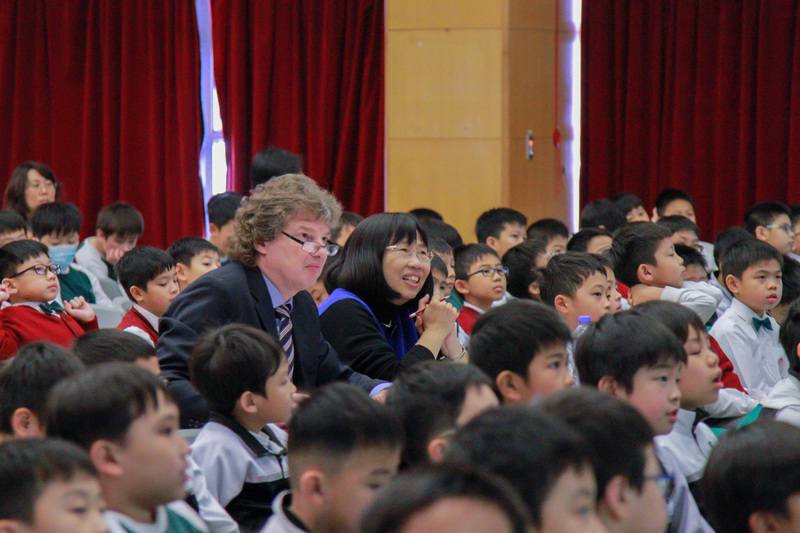 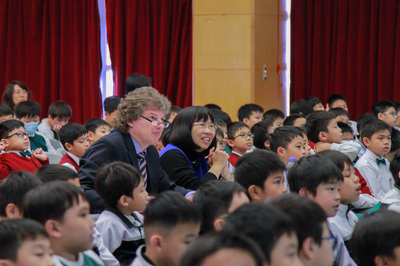 Our English teachers Dr Lee (left) and Ms Ho (right) attended the ceremony and witnessed the joyful moment! 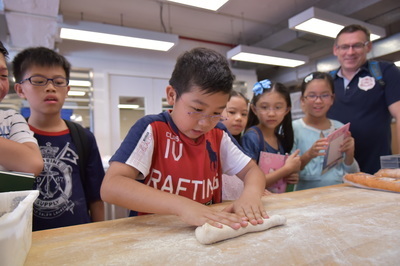 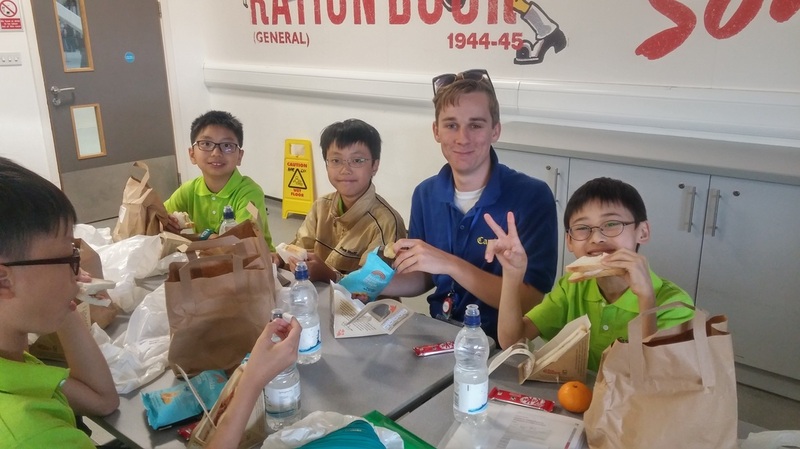 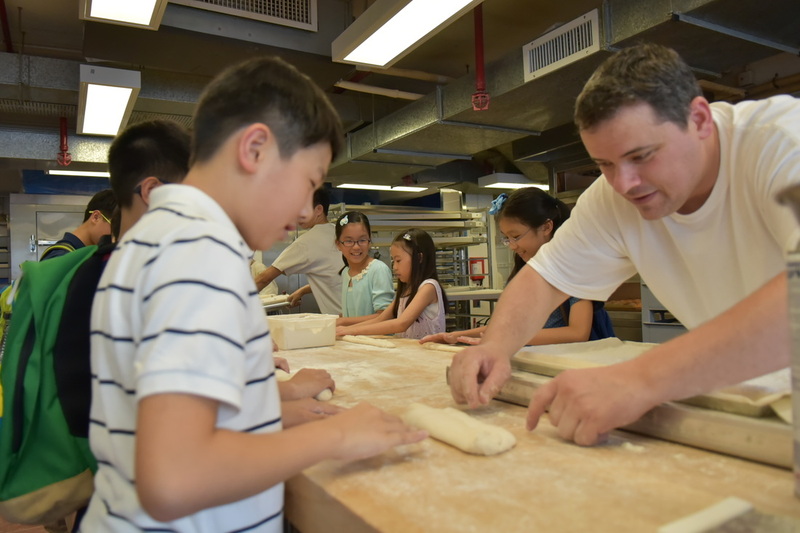 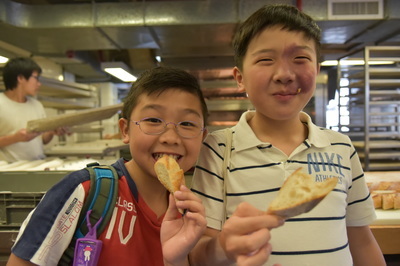 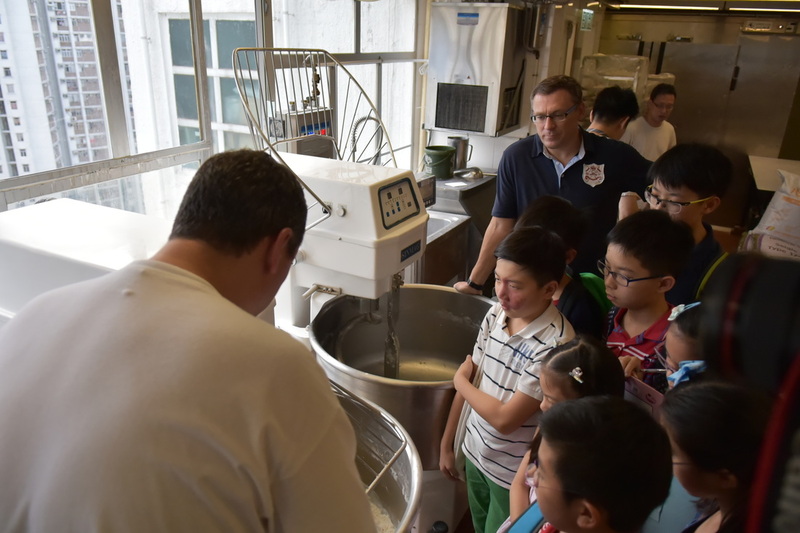 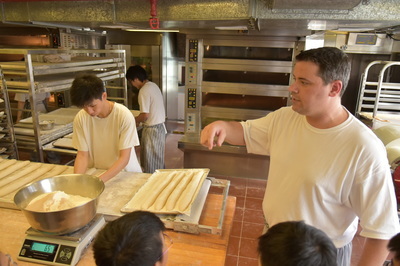 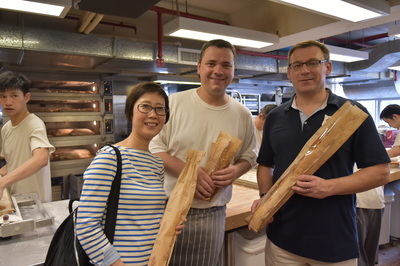 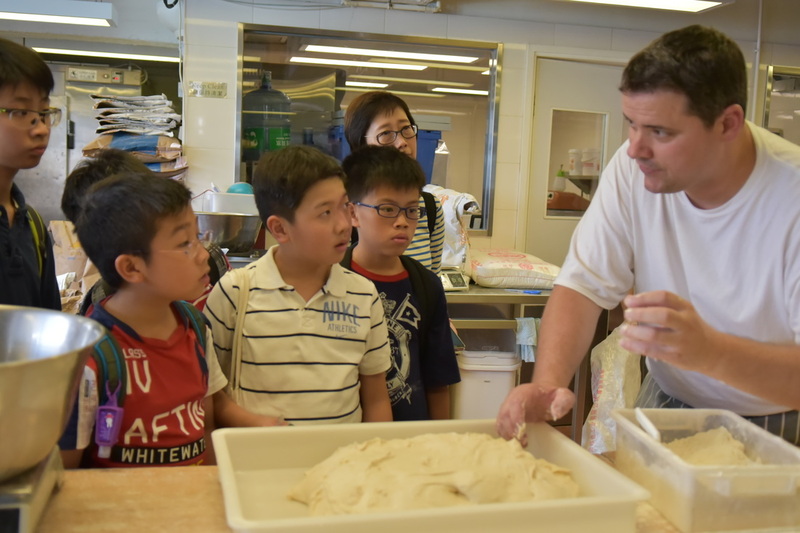 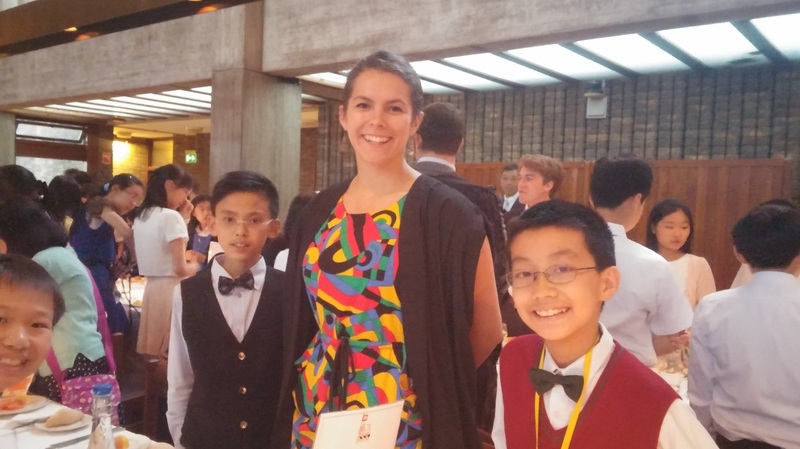 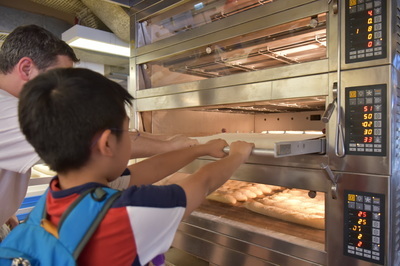 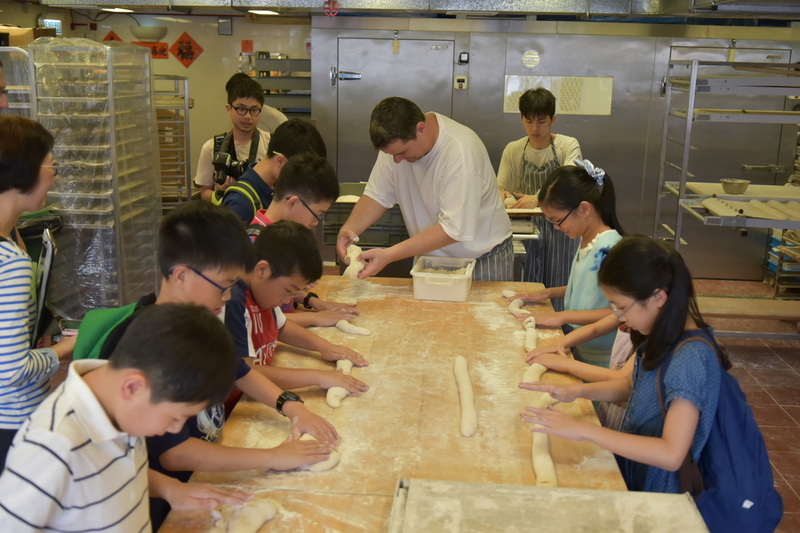 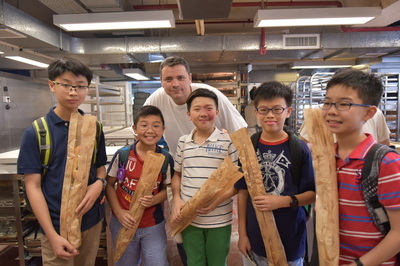 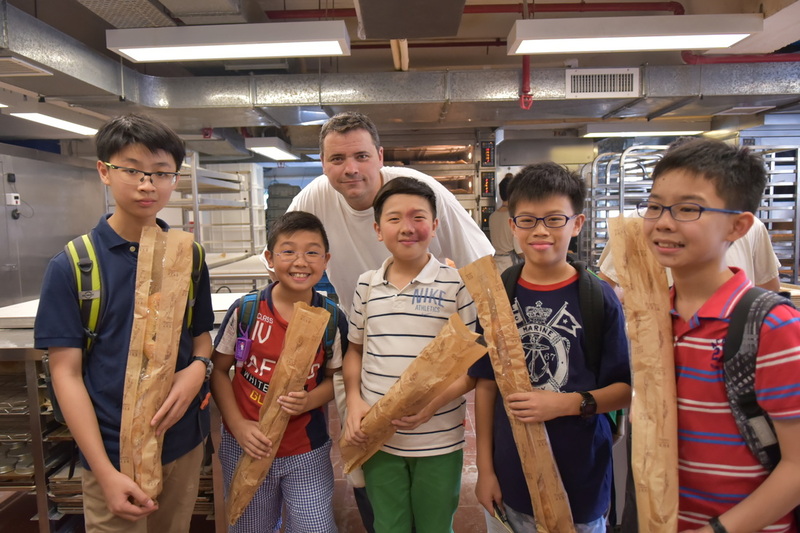 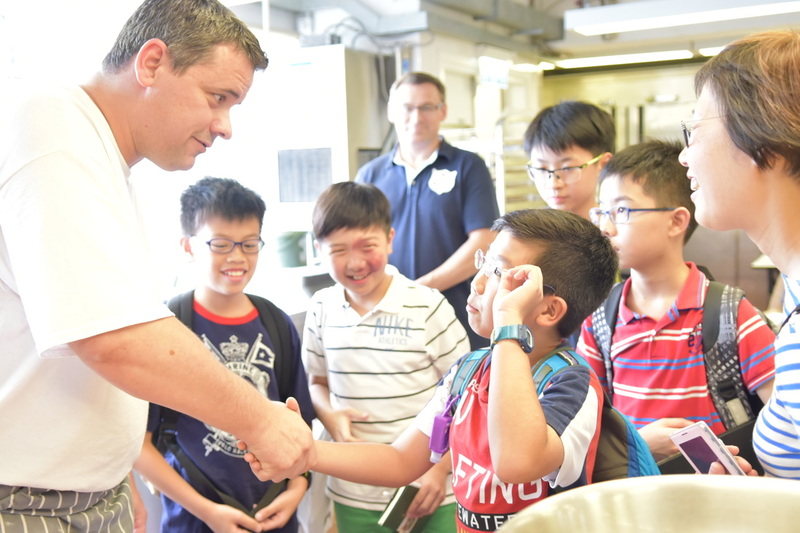 On 26 June, five students from our school had a chance interviewing and learning from an excellent pastry chef, Mr Gregoire Michaud, who is now running his business in Hong Kong. 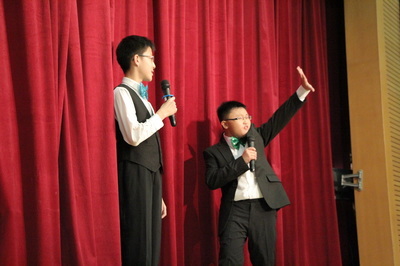 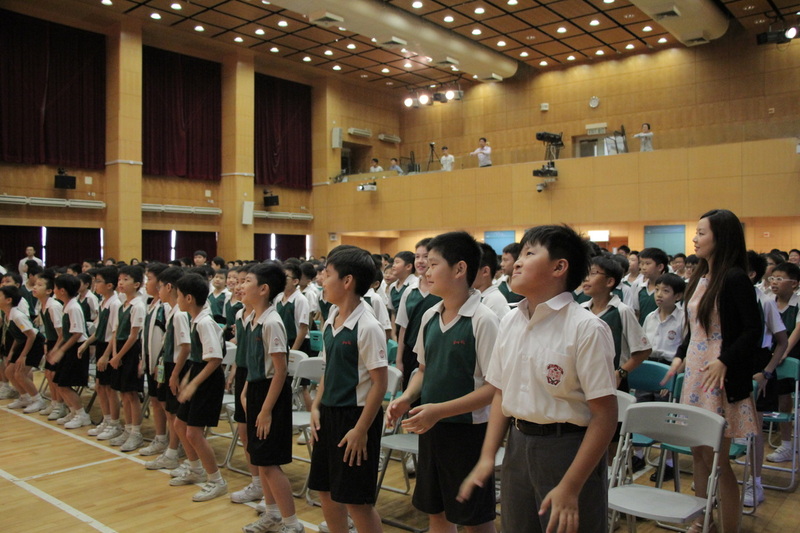 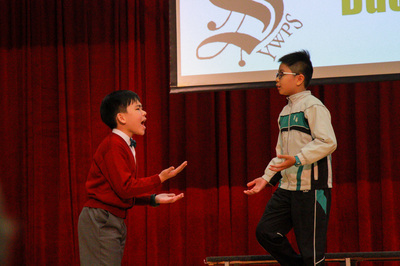 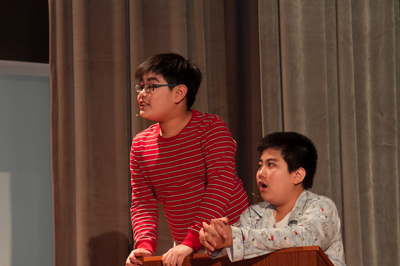 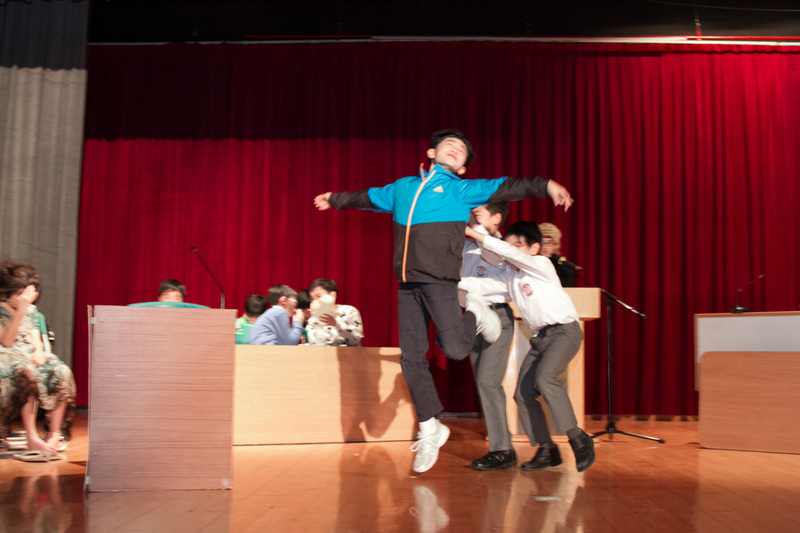 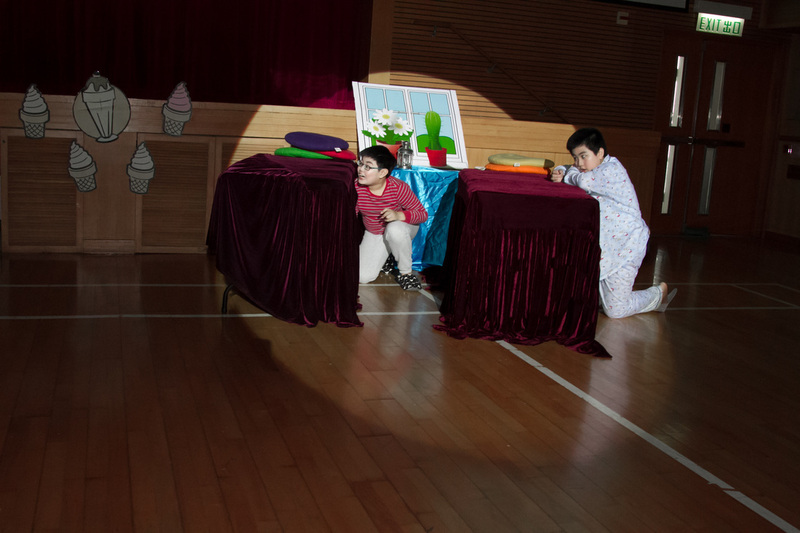 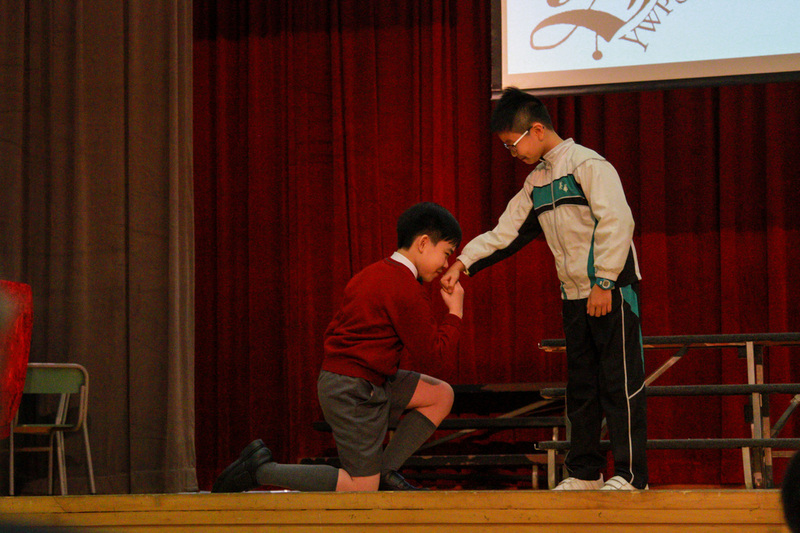 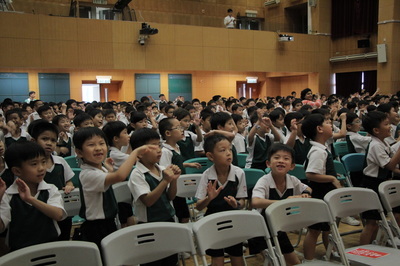 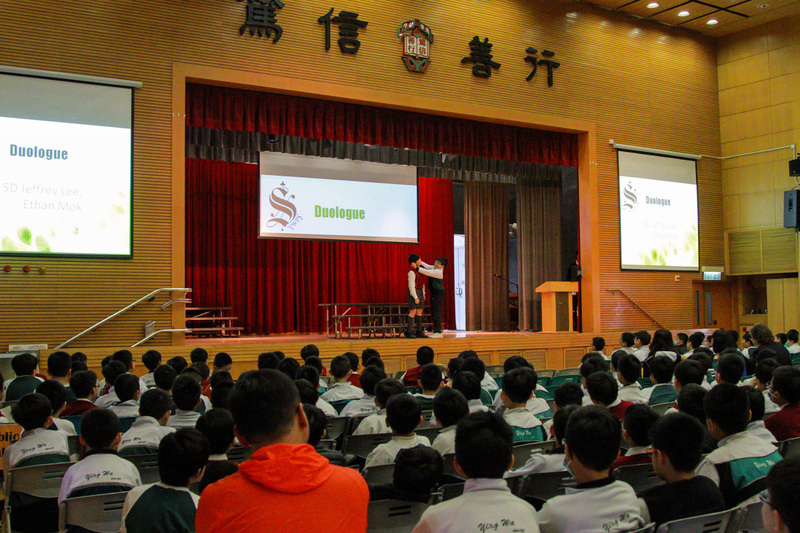 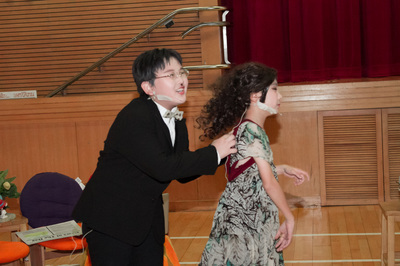 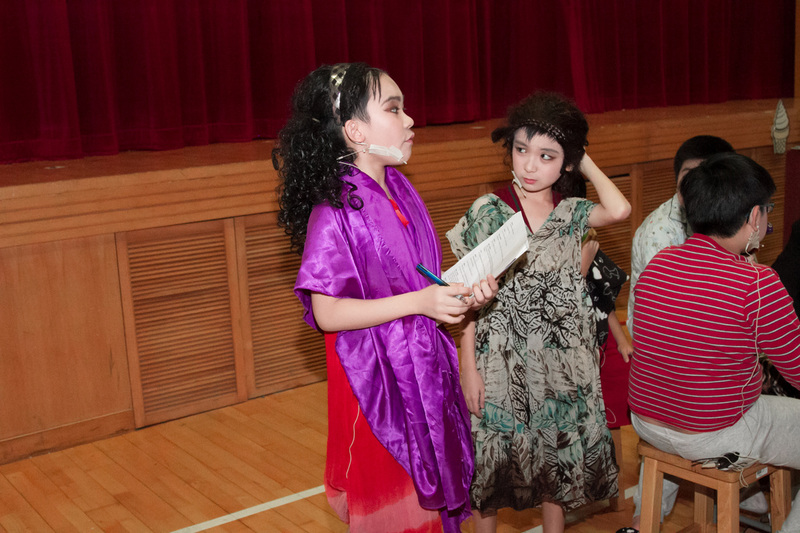 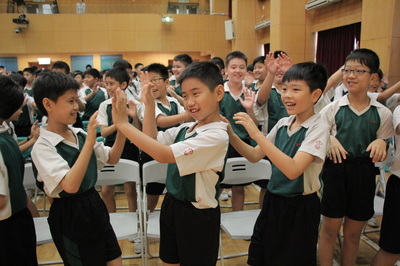 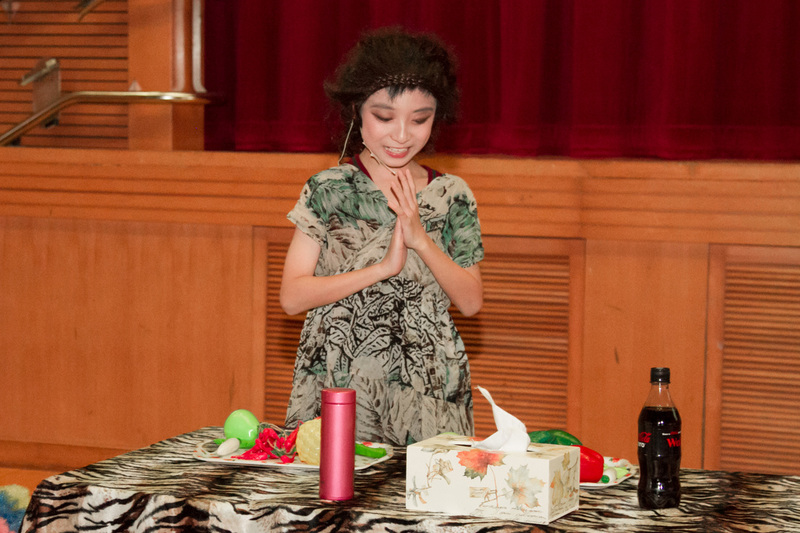 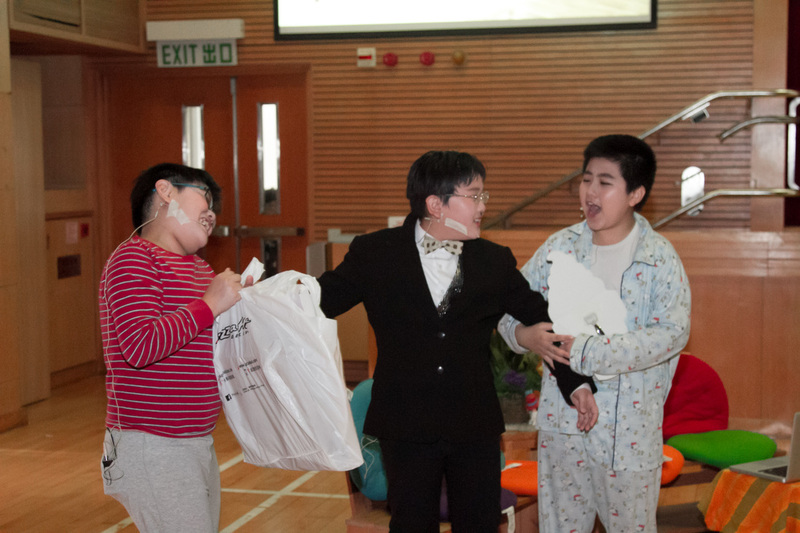 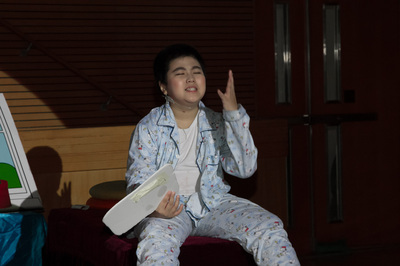 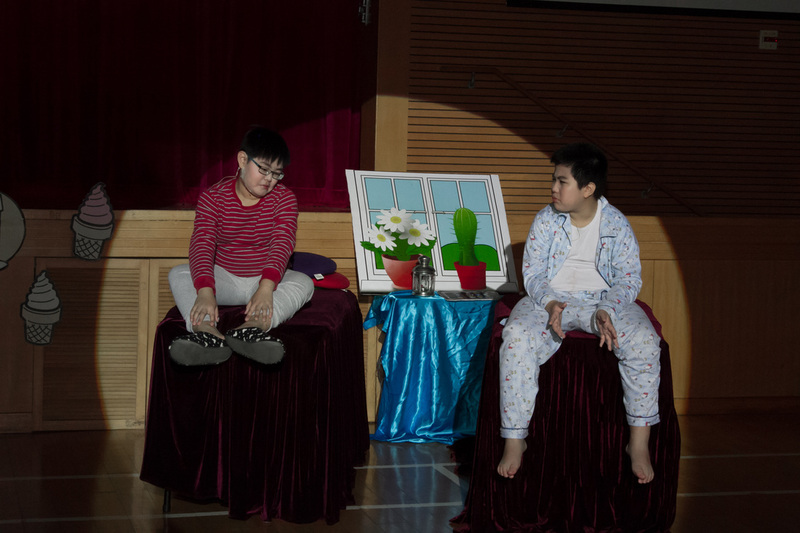 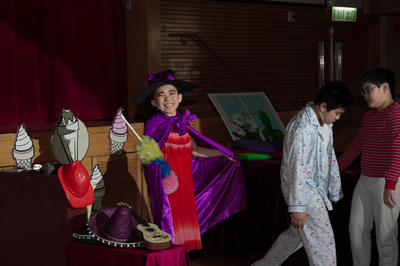 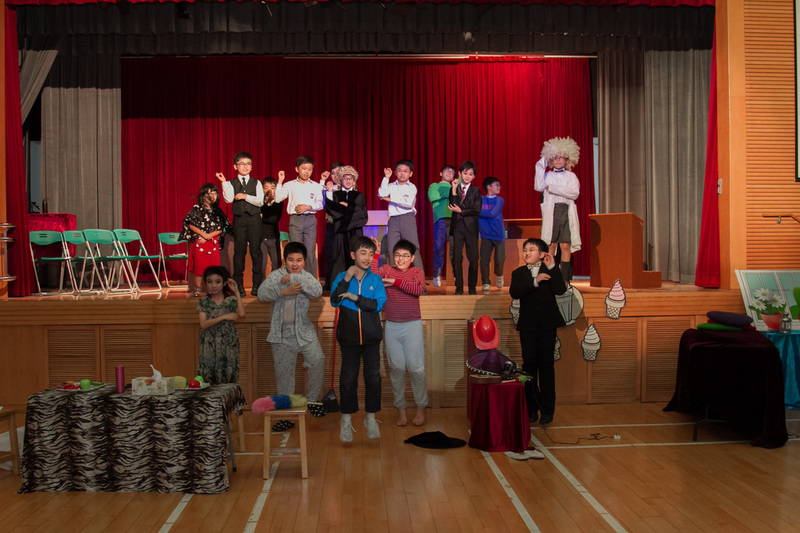 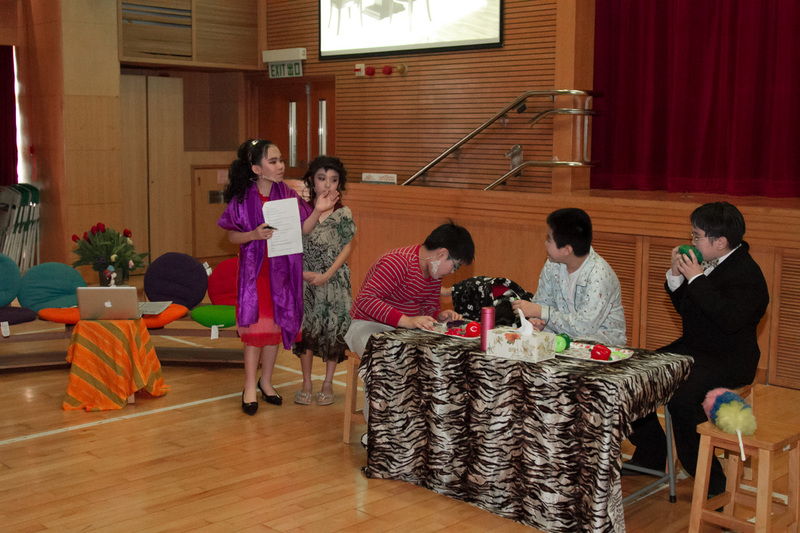 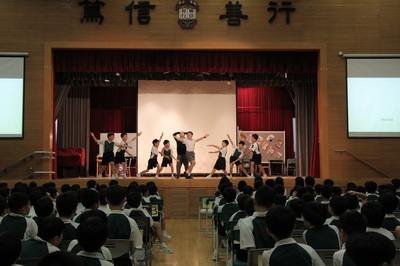 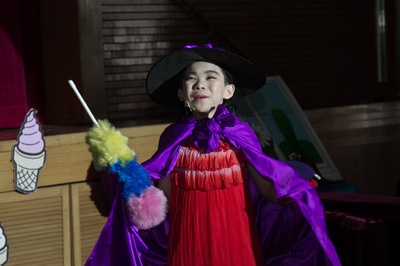 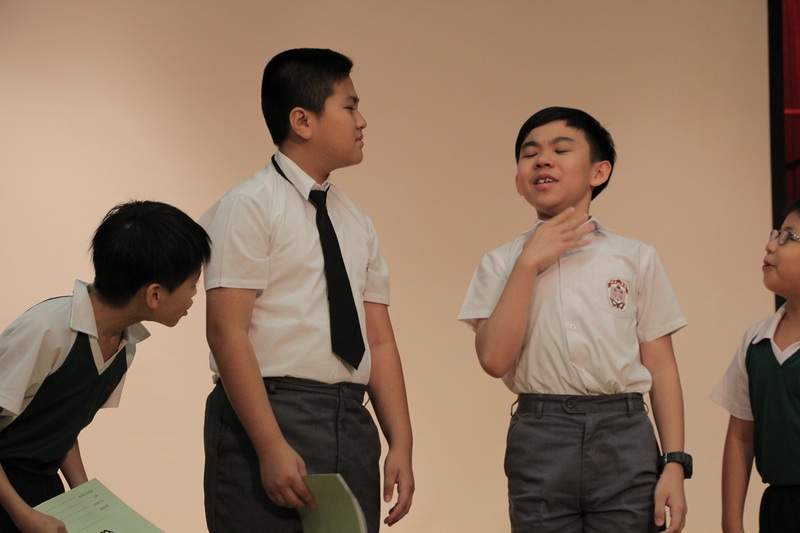 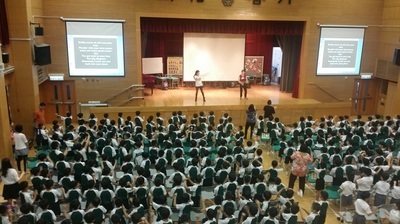 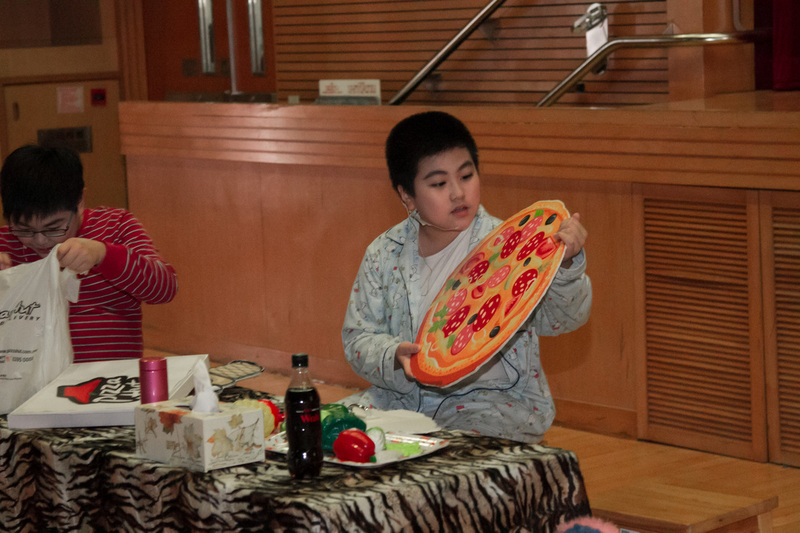 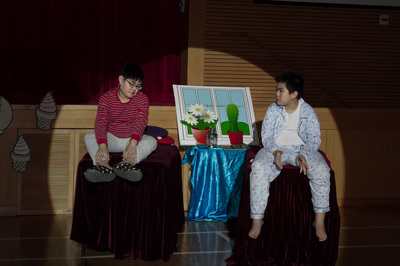 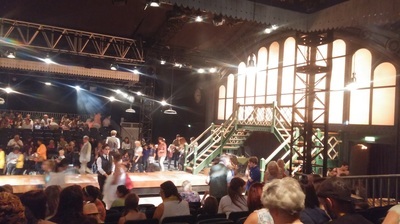 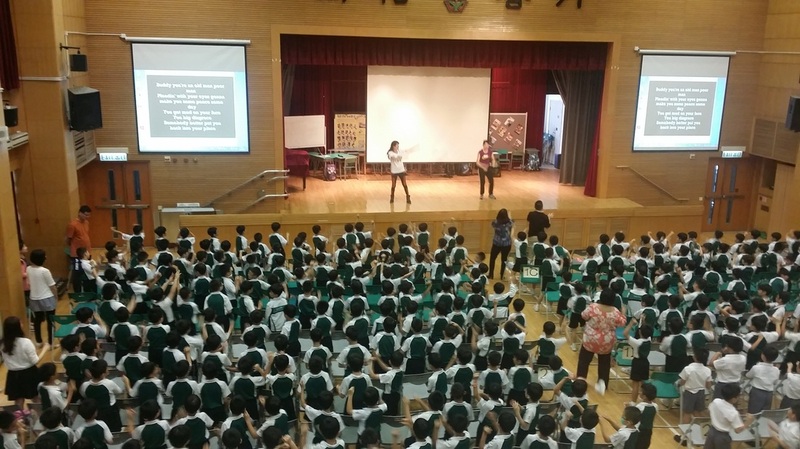 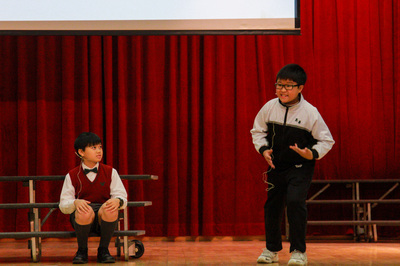 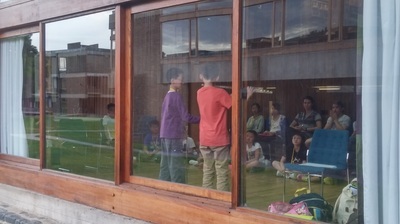 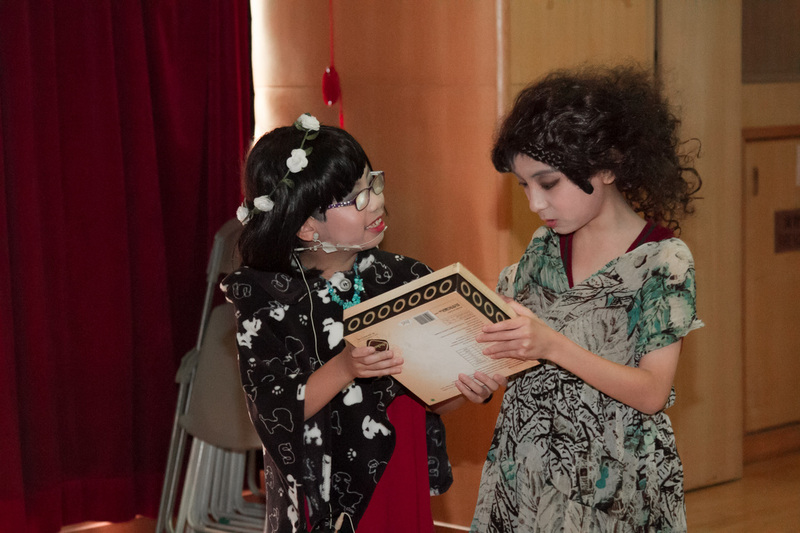 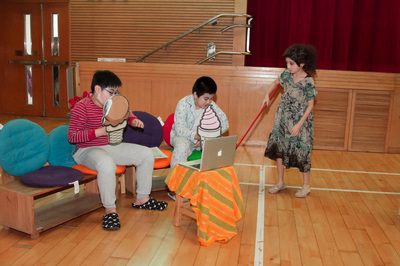 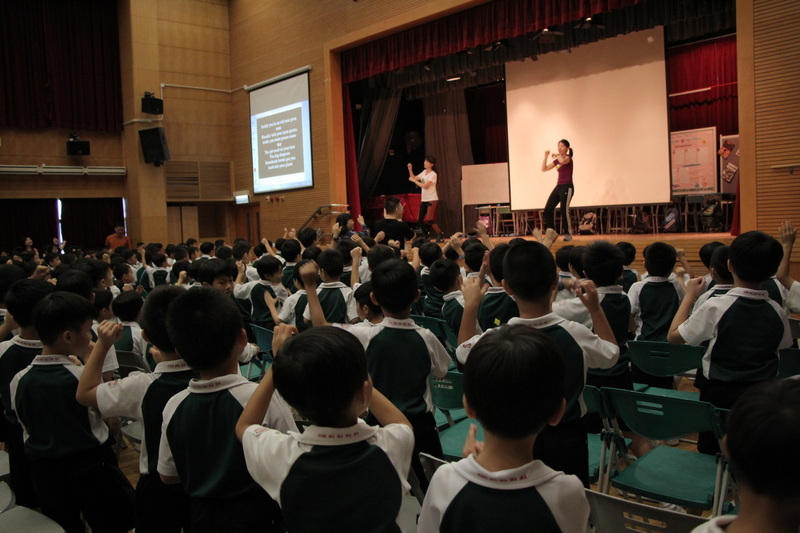 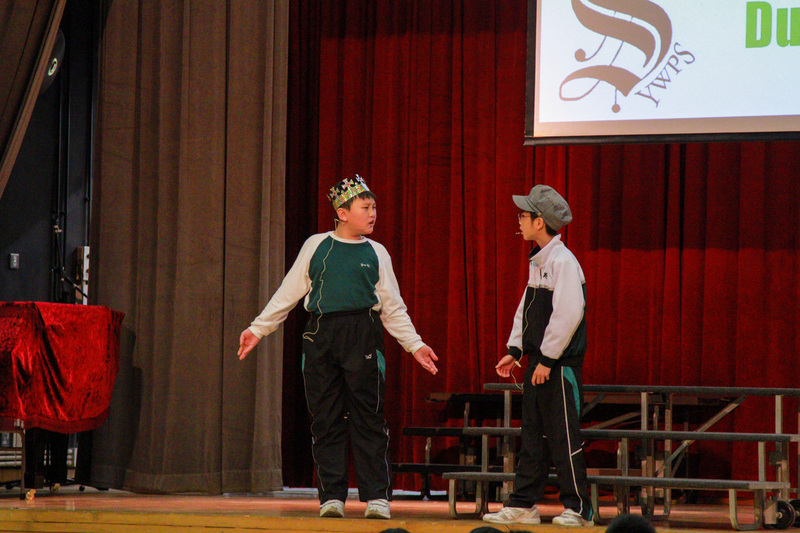 The third Drama Fiesta of YWPS was successfully held on 18 June 2015. 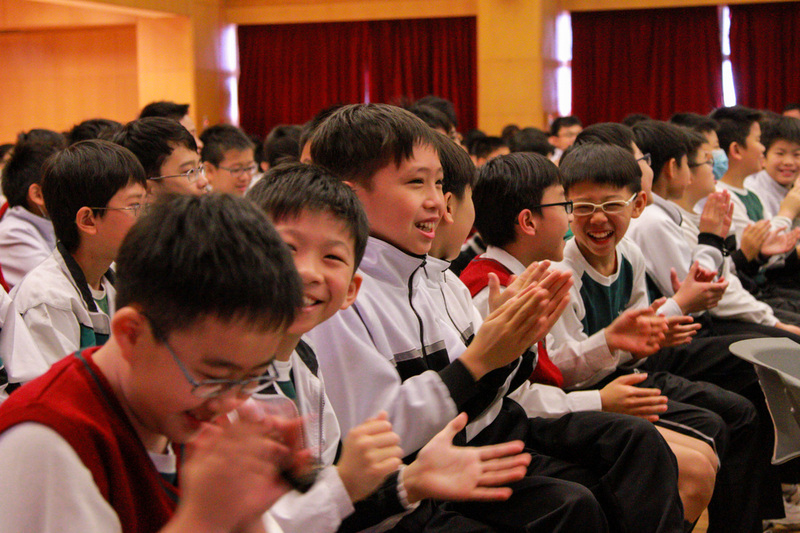 Let's experience the joy and excitement again! 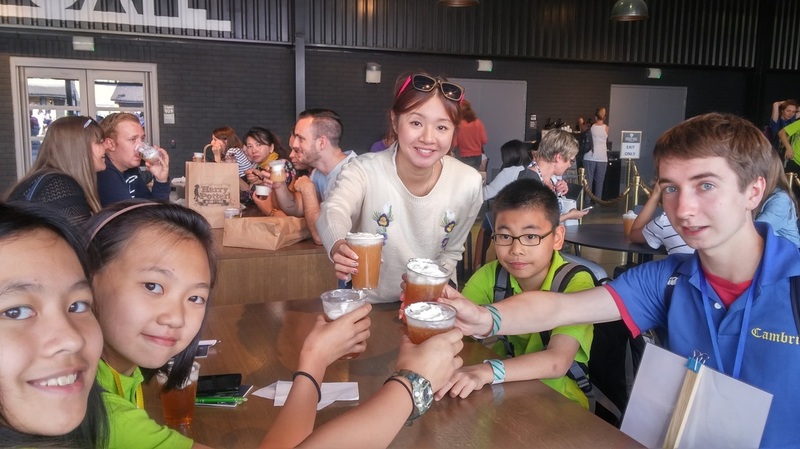 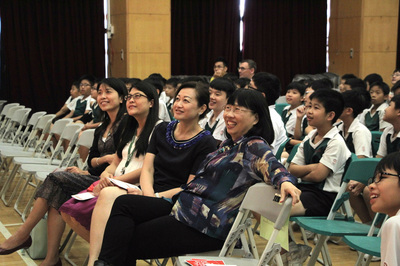 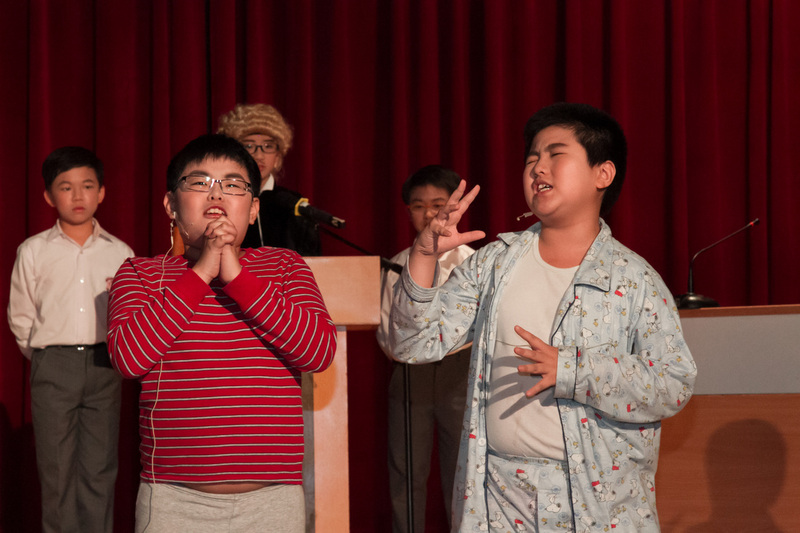 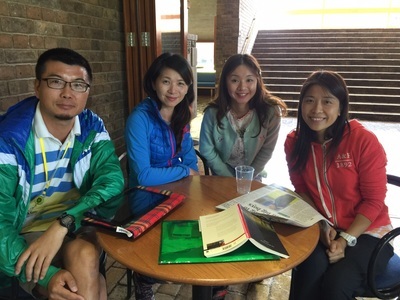 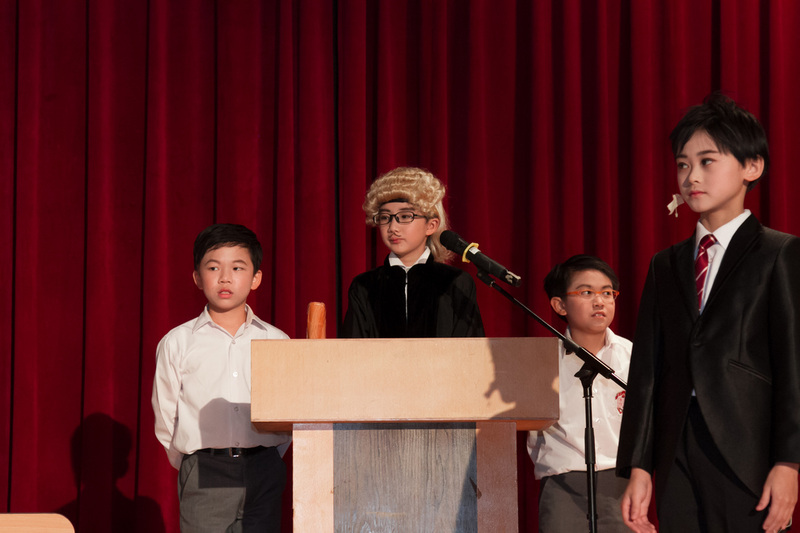 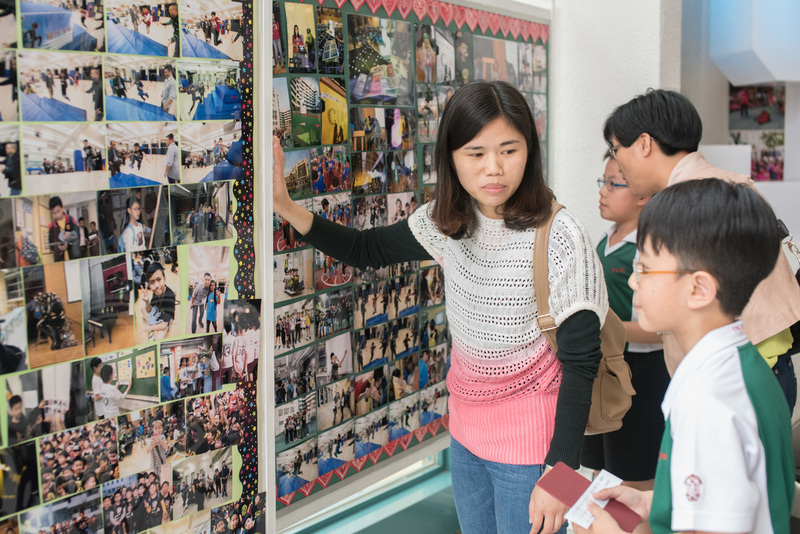 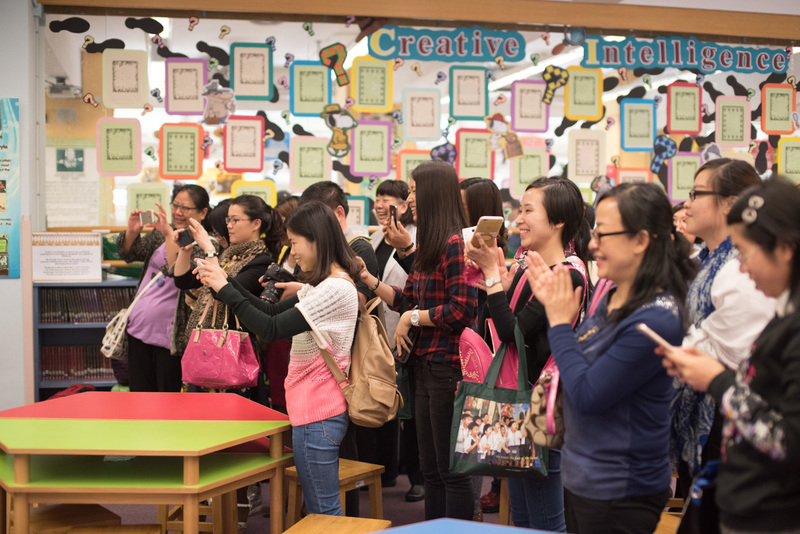 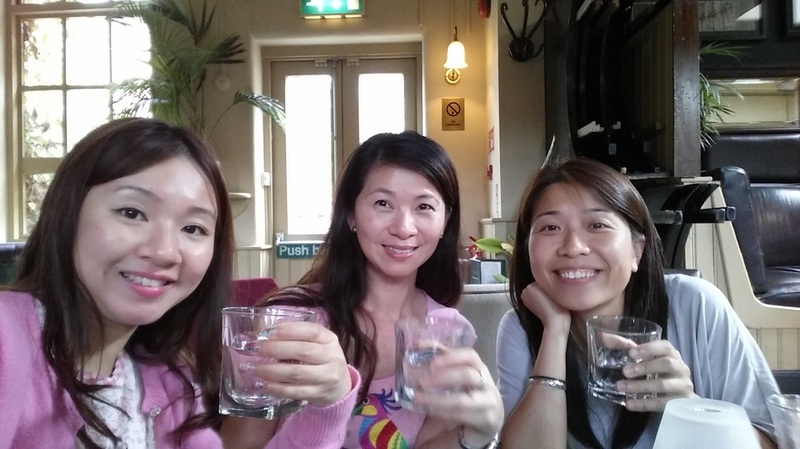 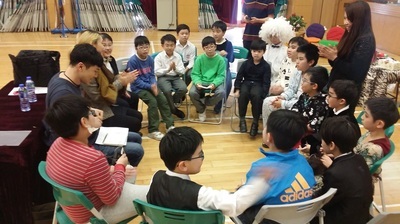 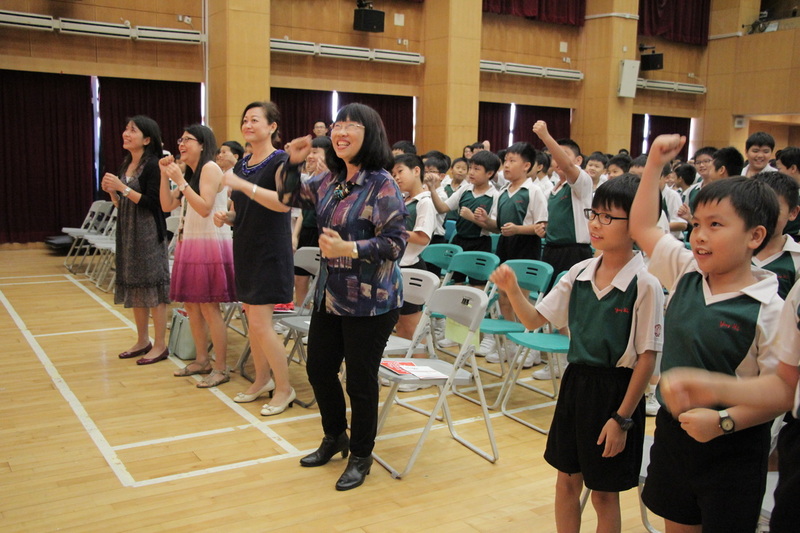 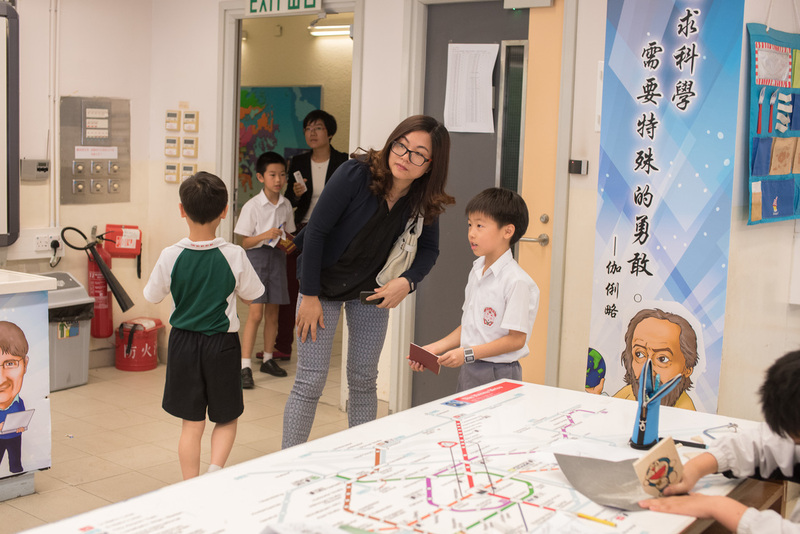 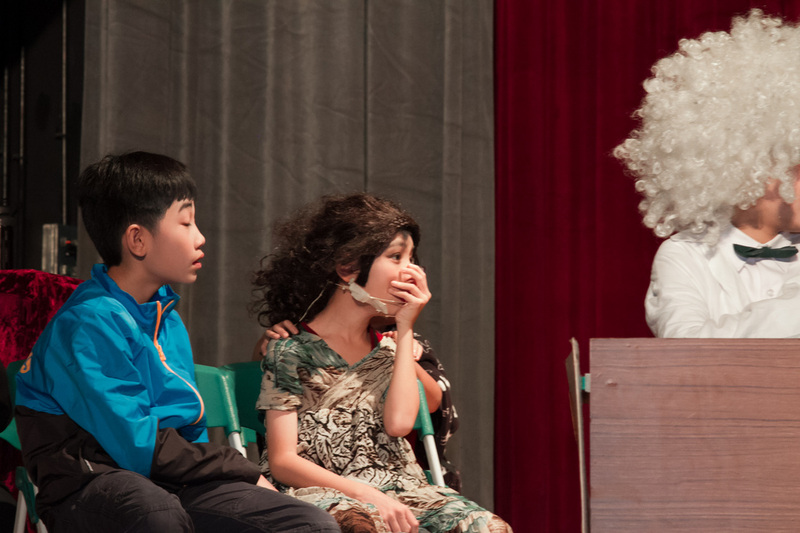 Guests enjoying the Drama Fiesta 2015 - (from left) Ms Norris Lai (YWC English Panel), Ms Alice Lee (YWC English teacher), Ms Lancy Tam (Principal of Law Ting Pong Secondary School, and Mrs Maria Lam, our School Head. 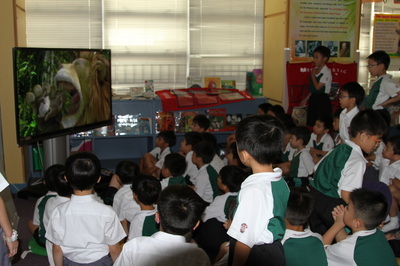 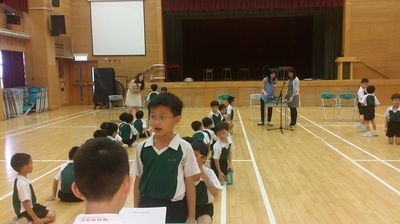 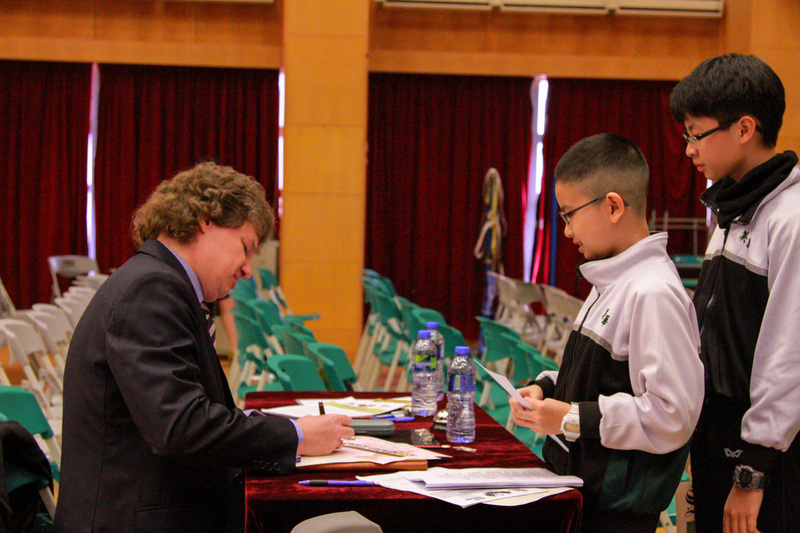 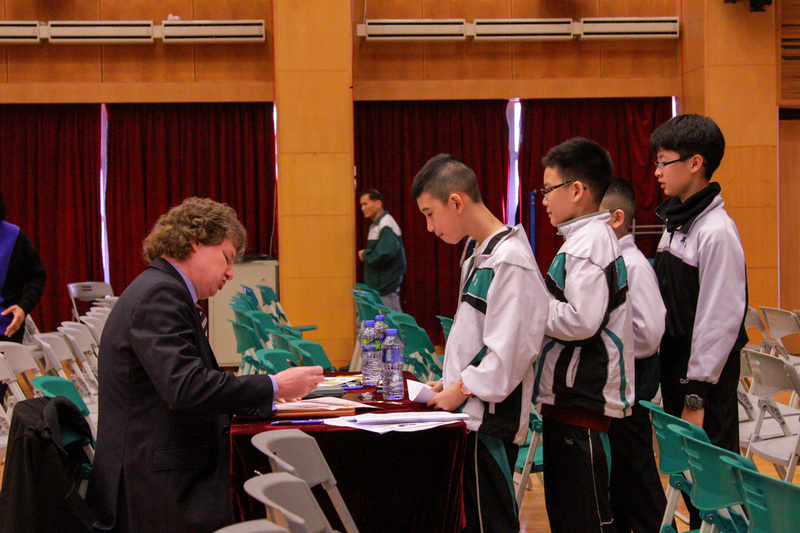 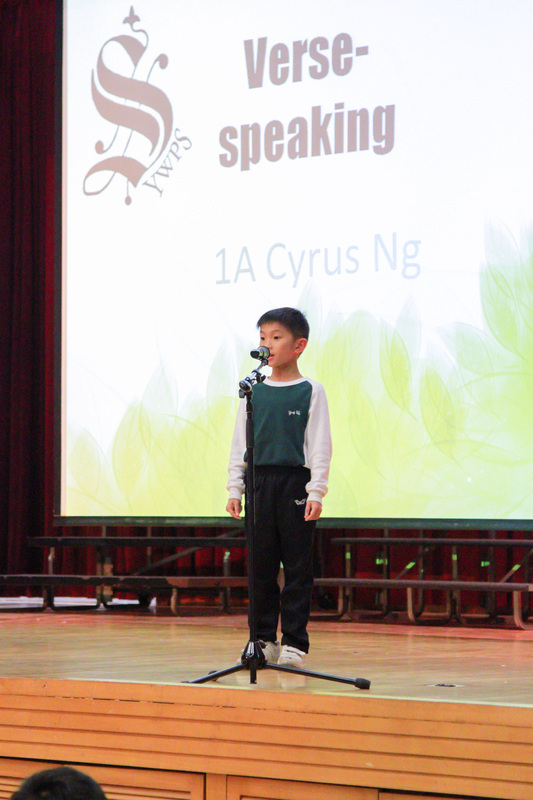 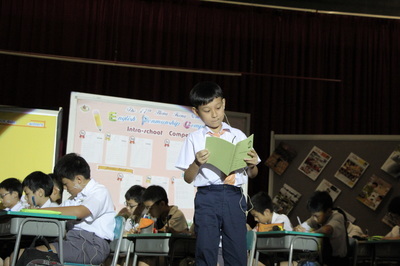 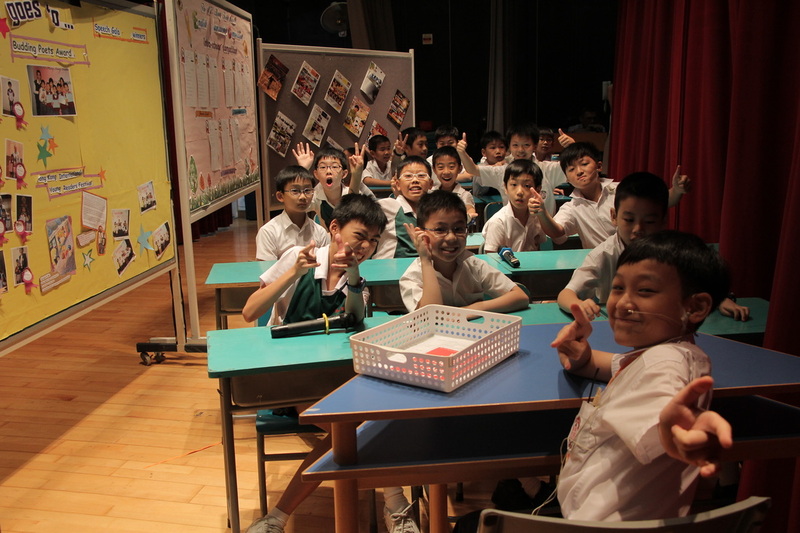 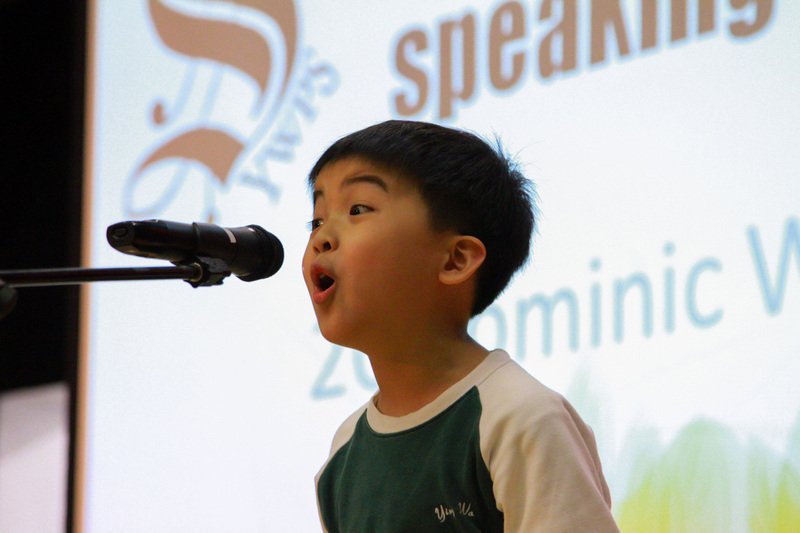 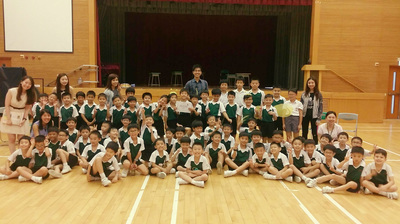 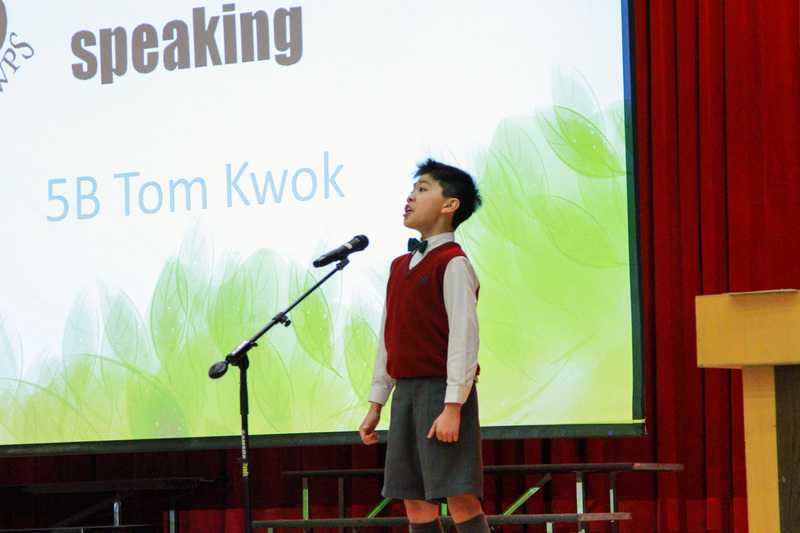 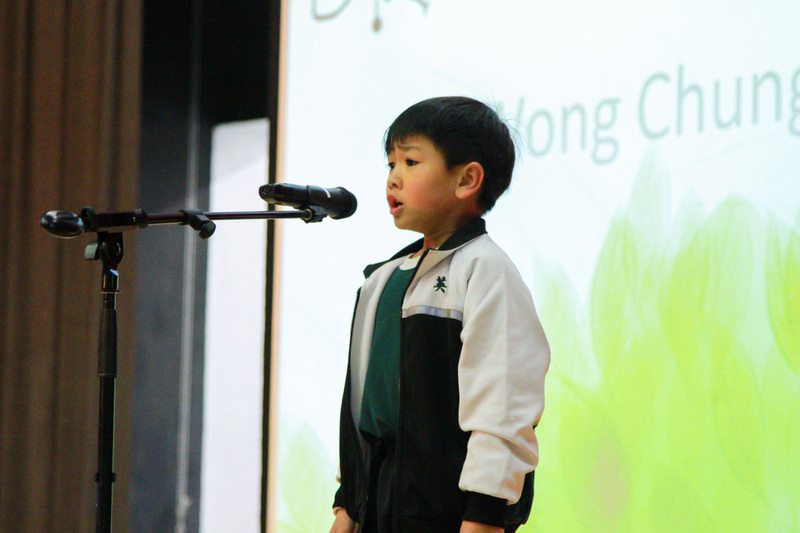 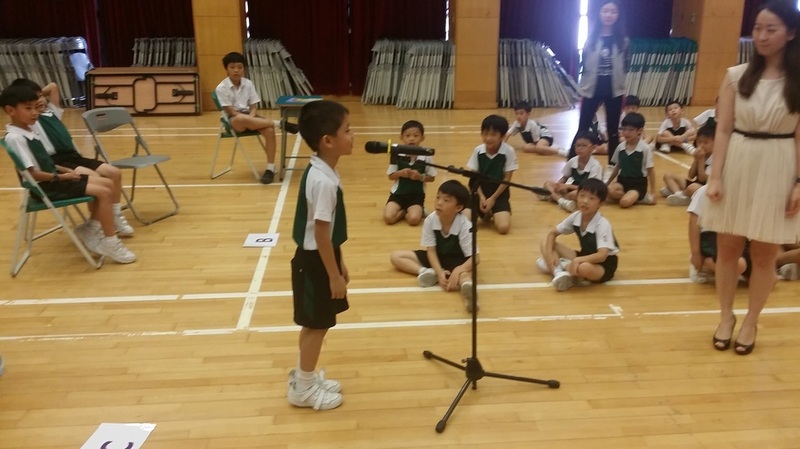 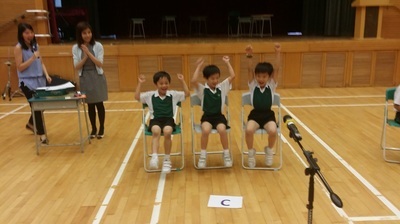 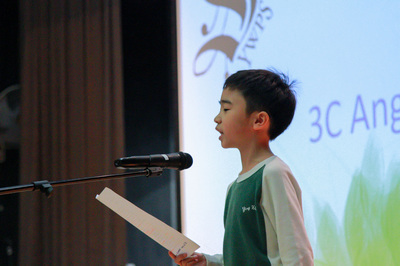 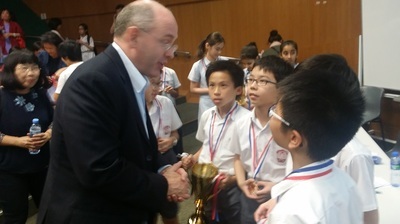 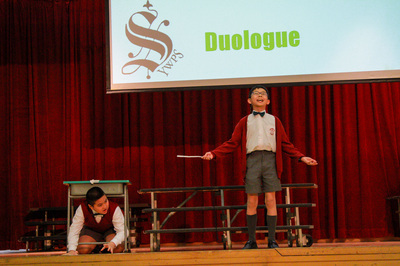 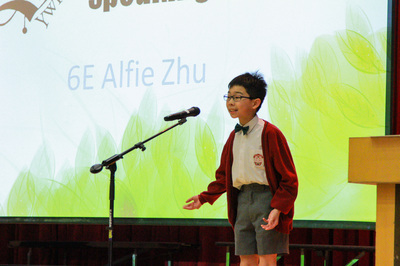 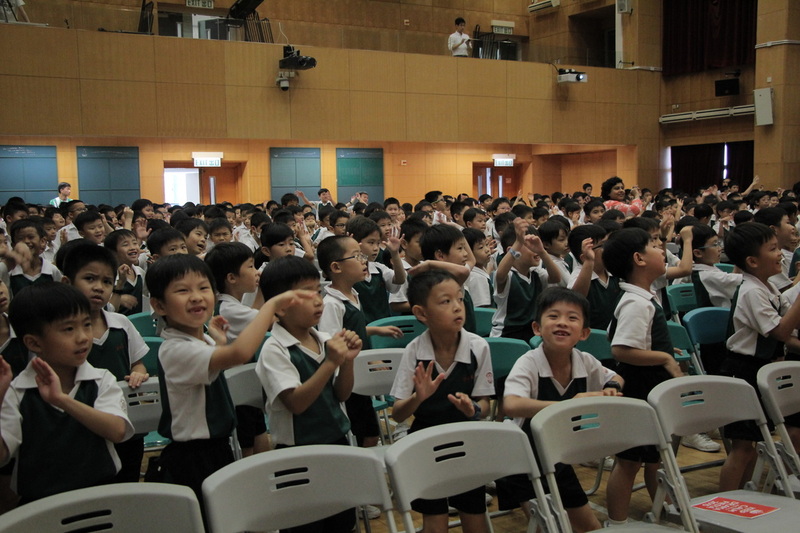 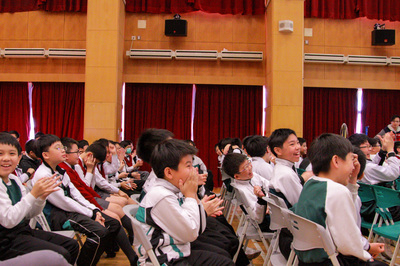 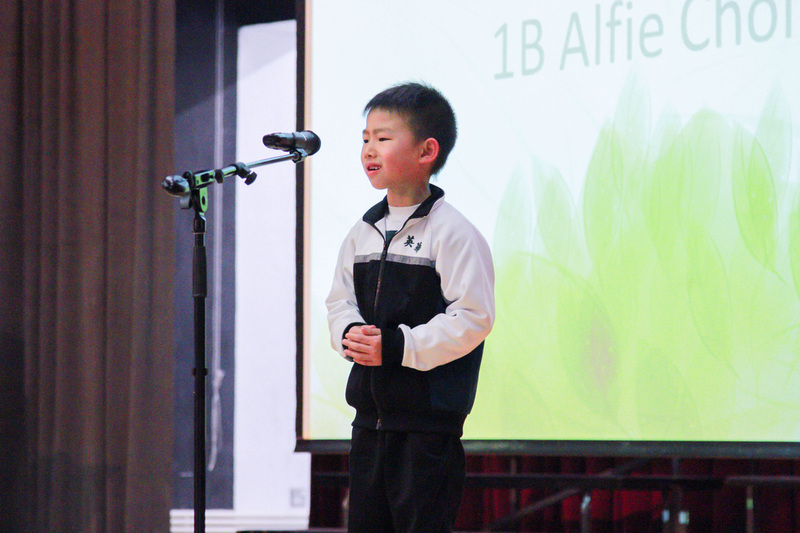 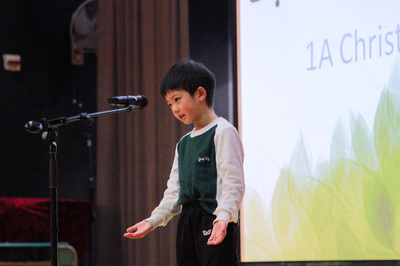 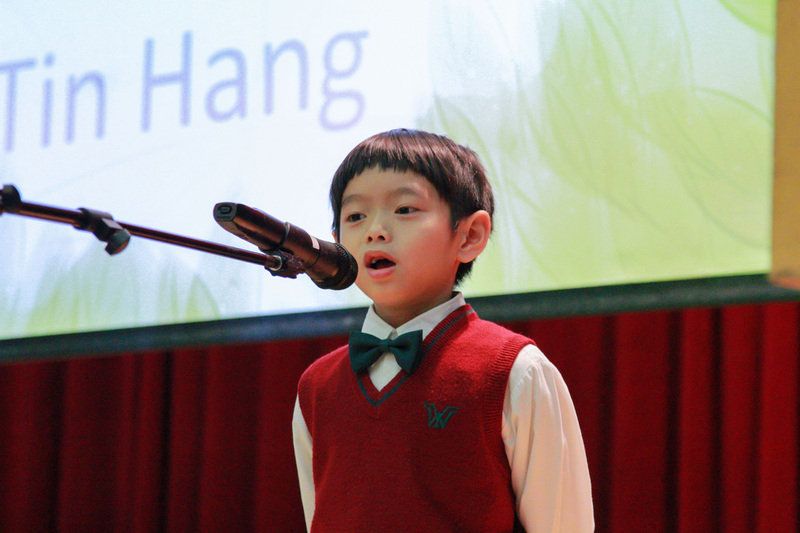 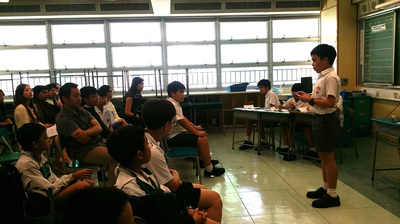 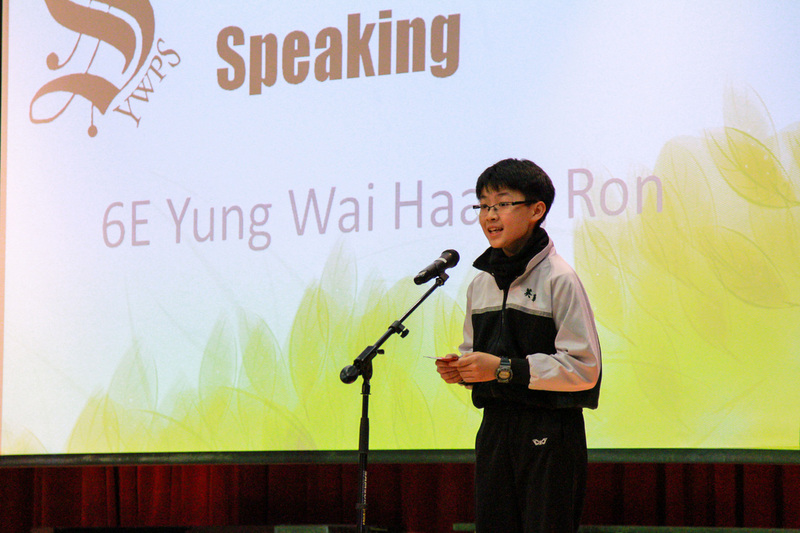 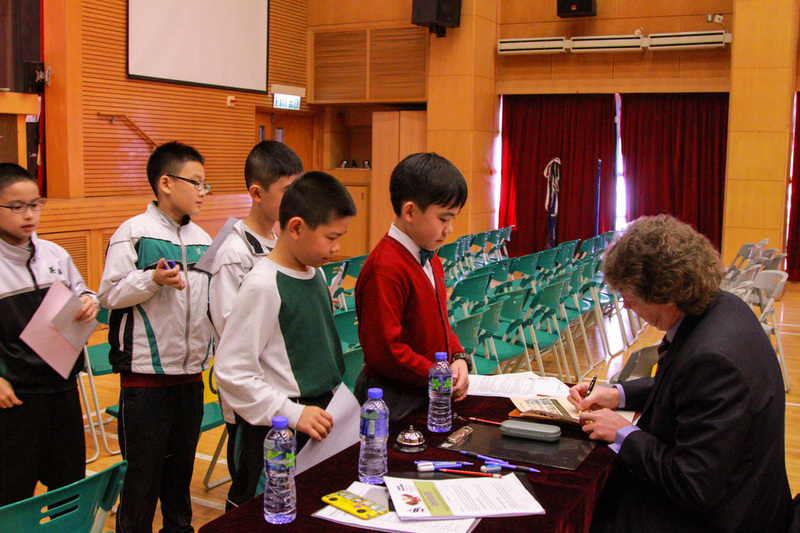 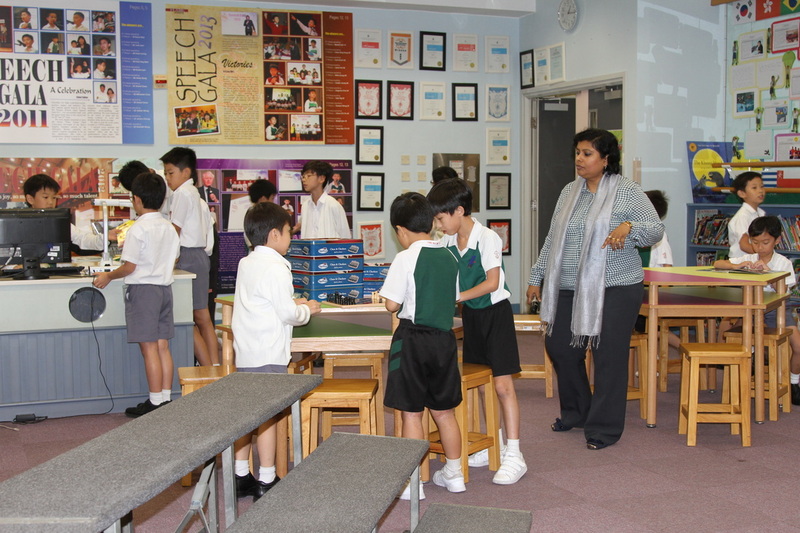 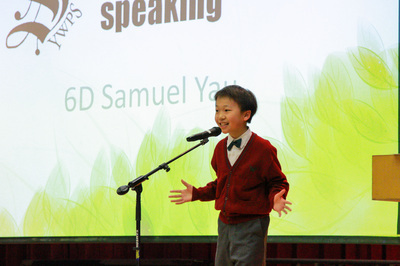 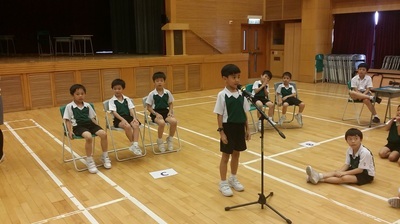 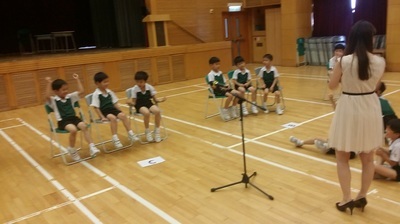 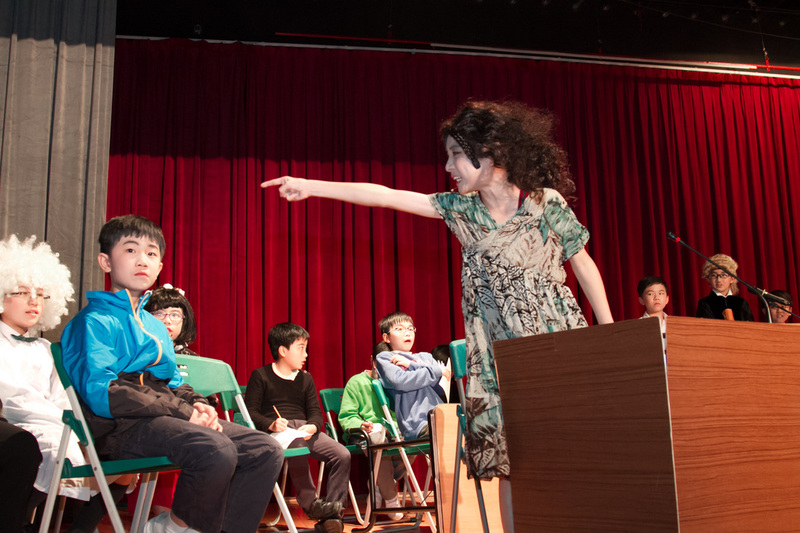 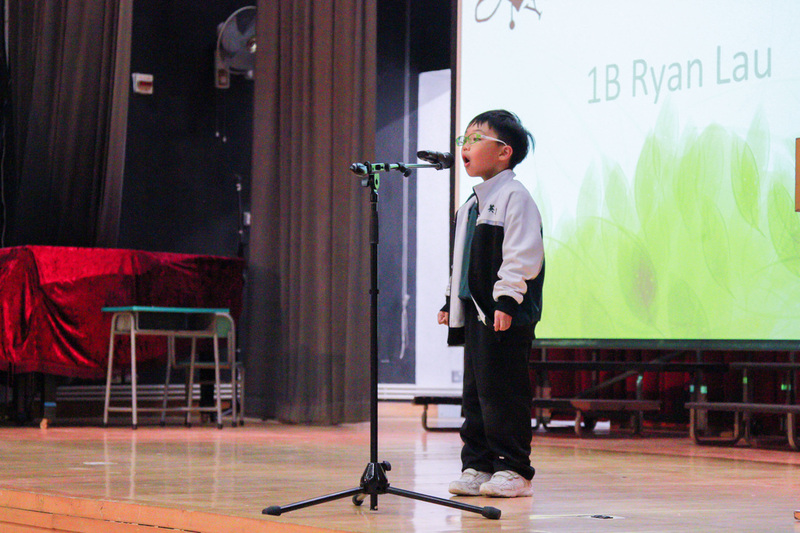 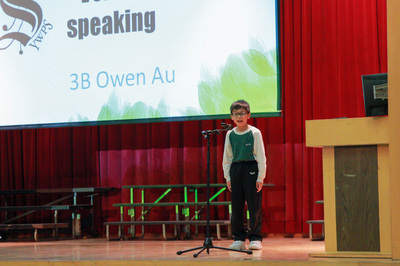 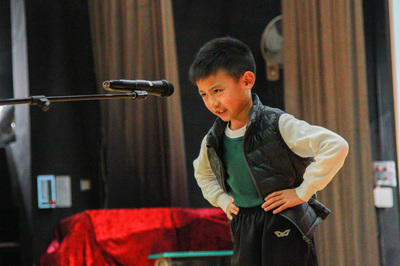 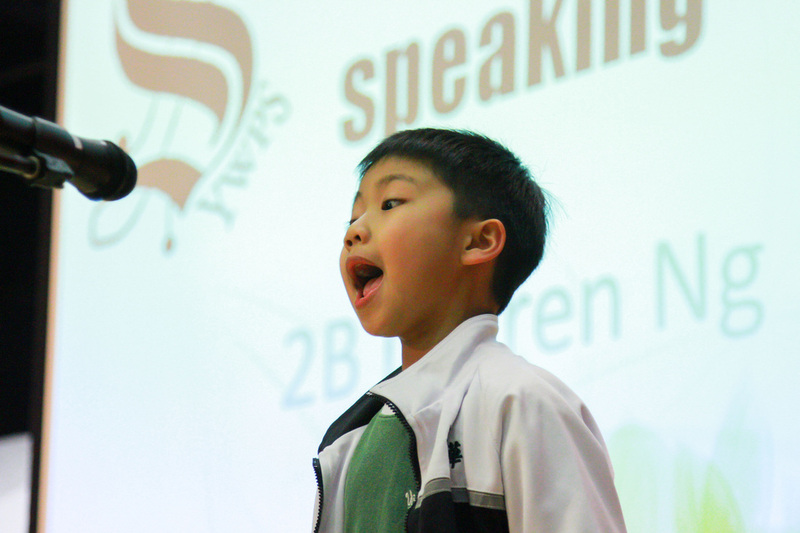 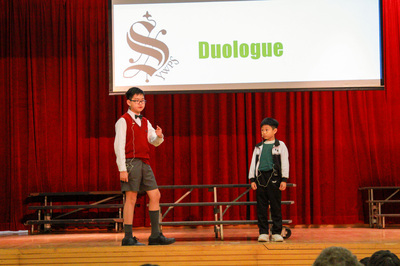 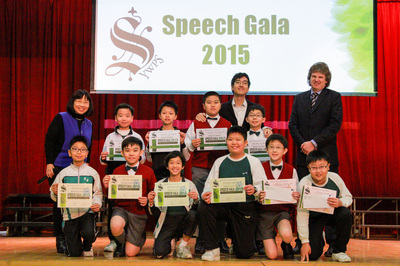 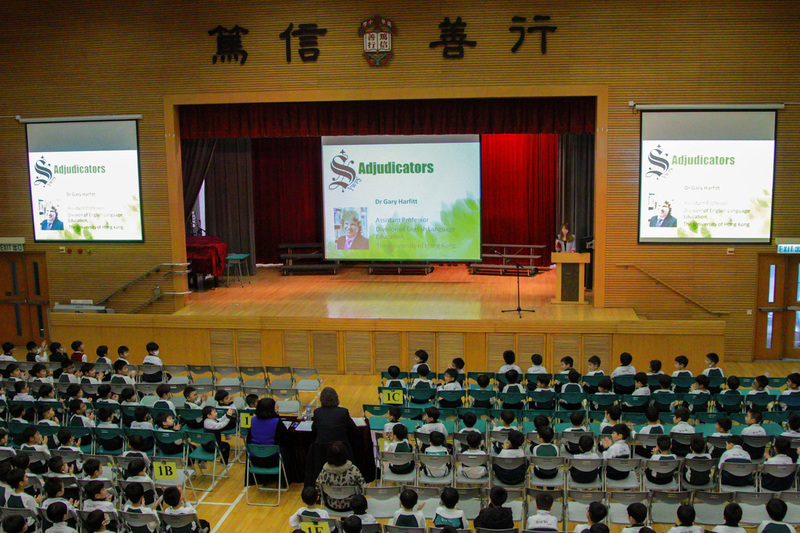 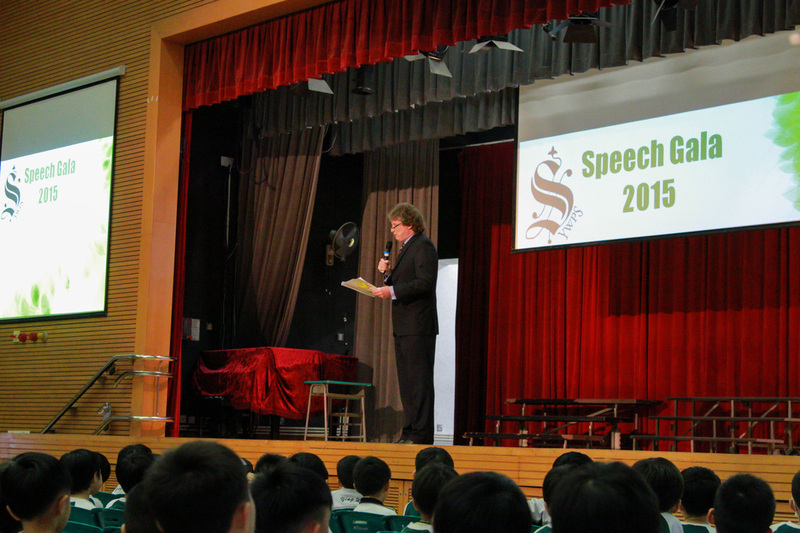 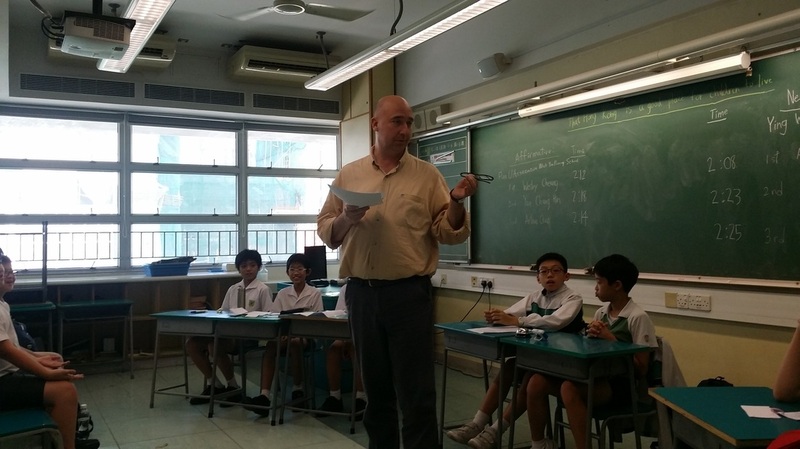 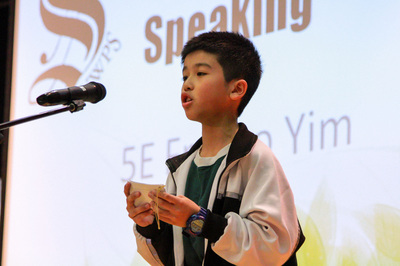 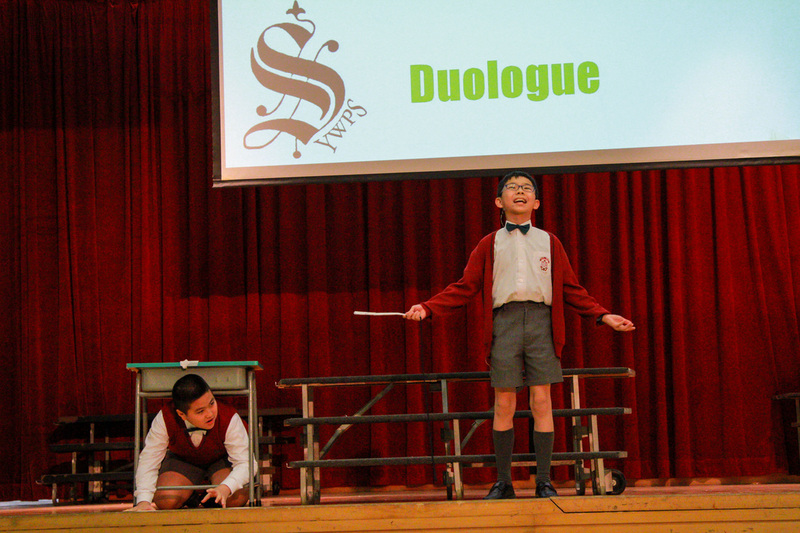 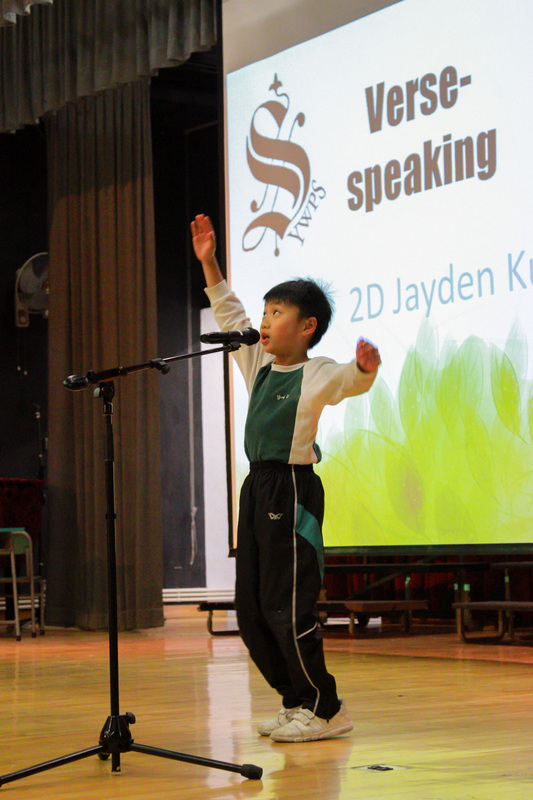 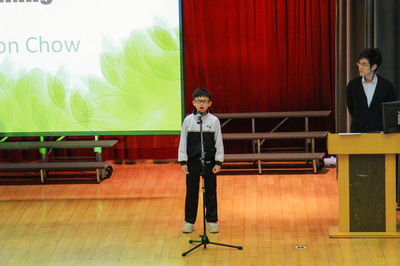 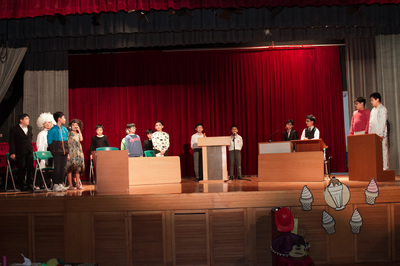 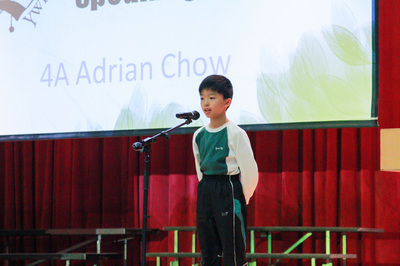 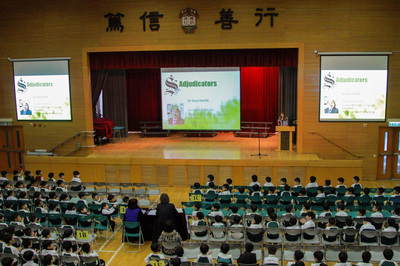 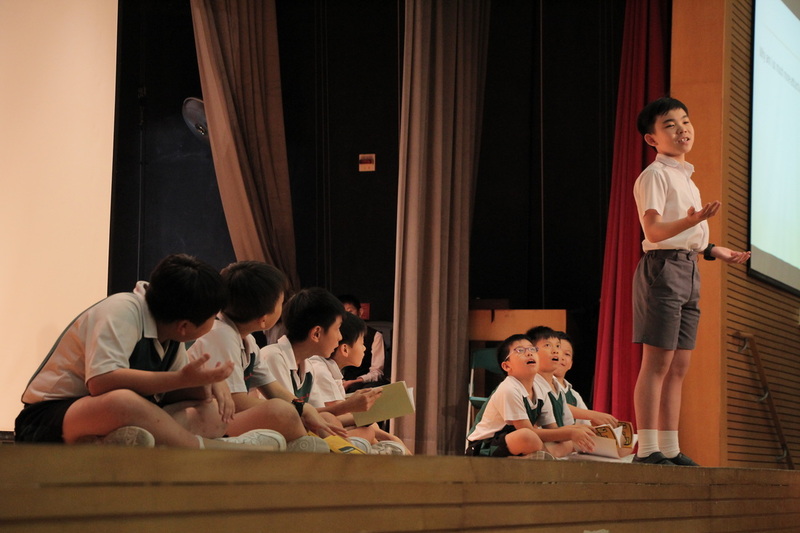 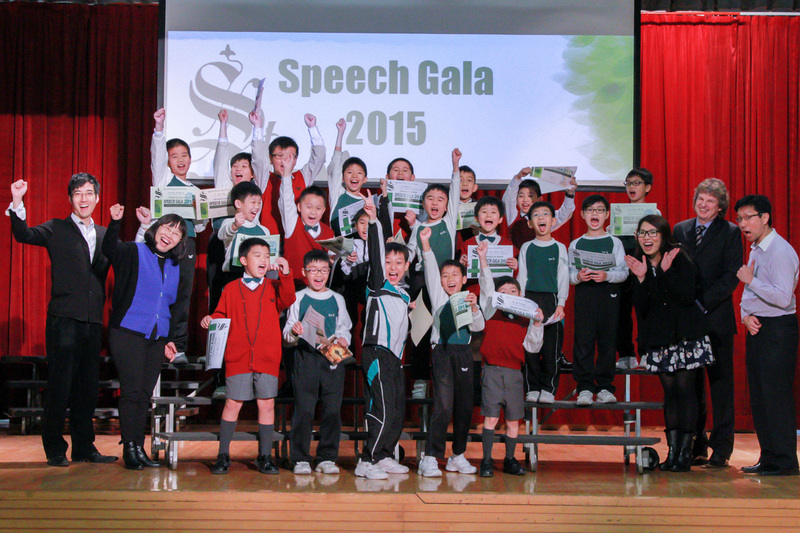 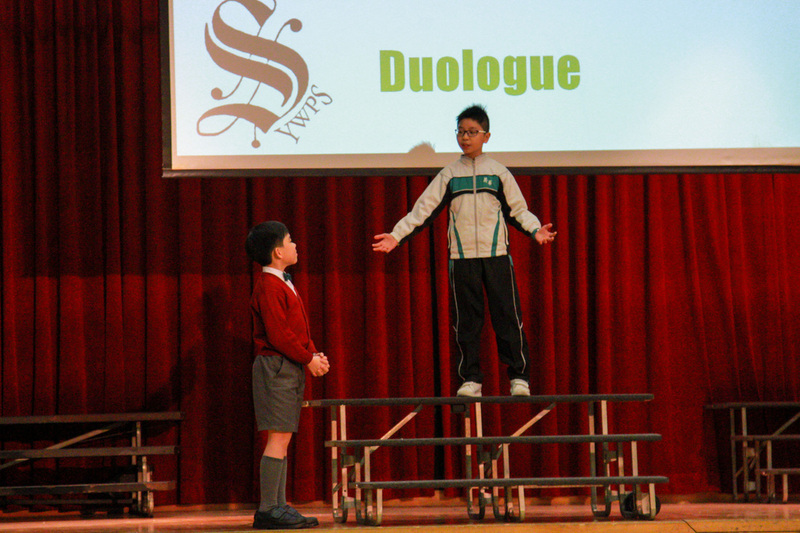 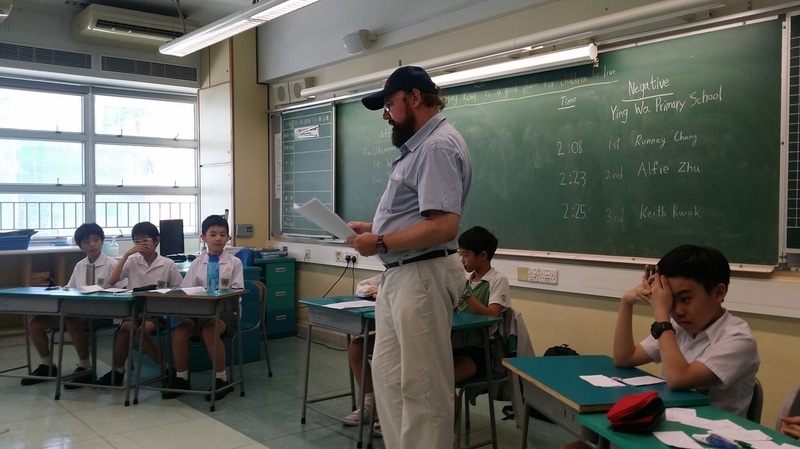 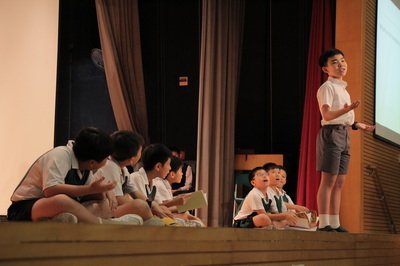 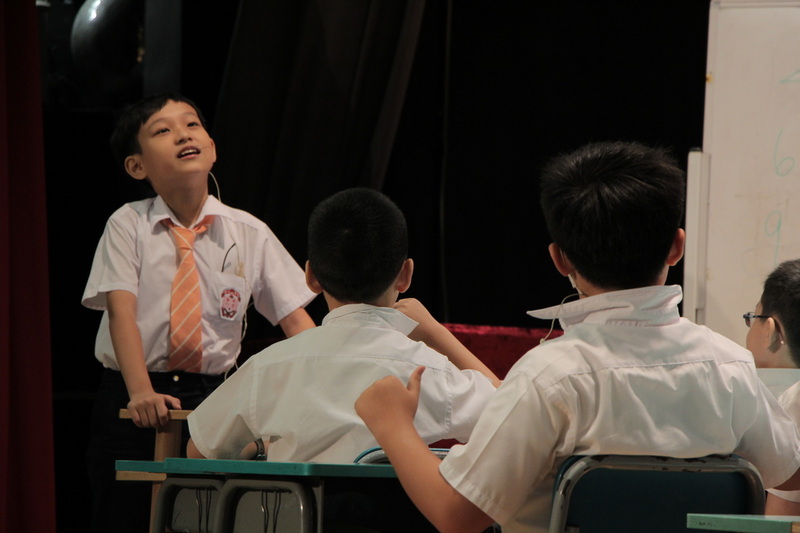 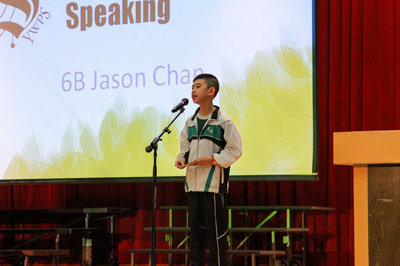 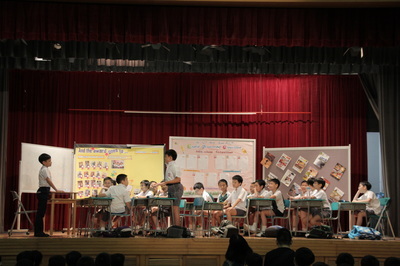 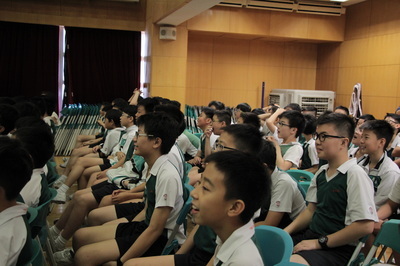 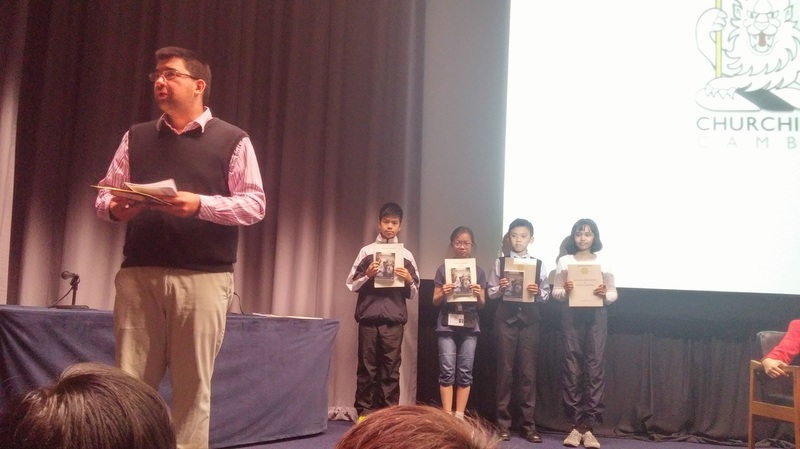 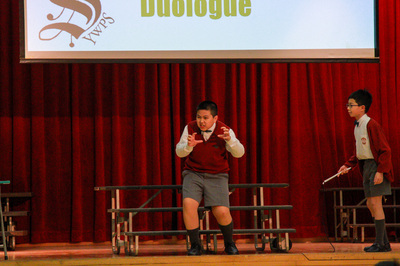 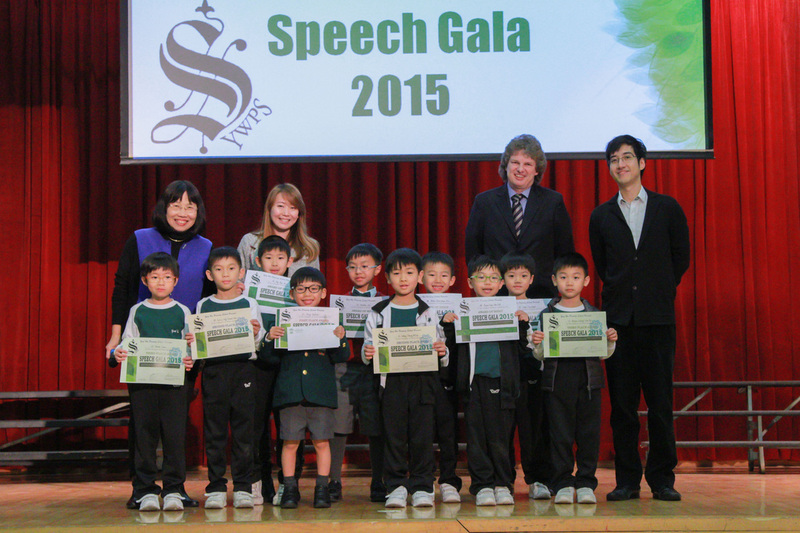 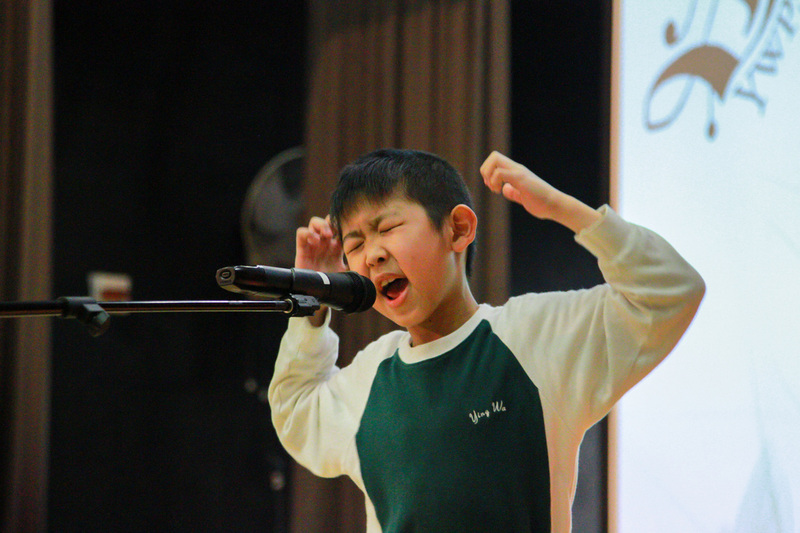 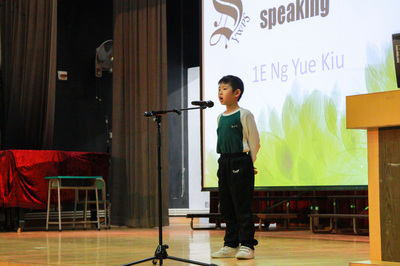 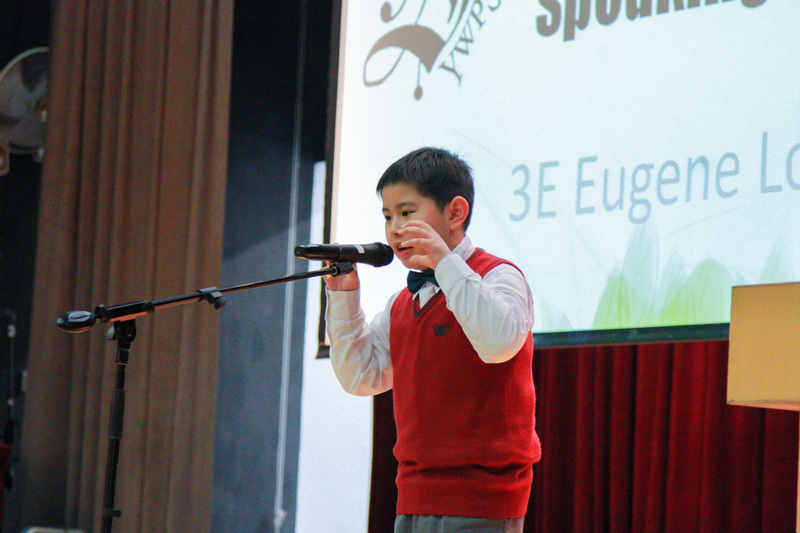 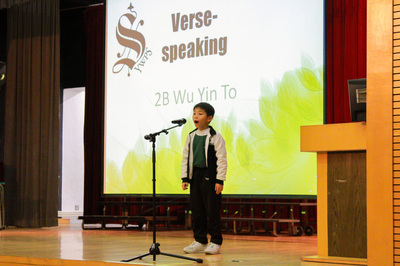 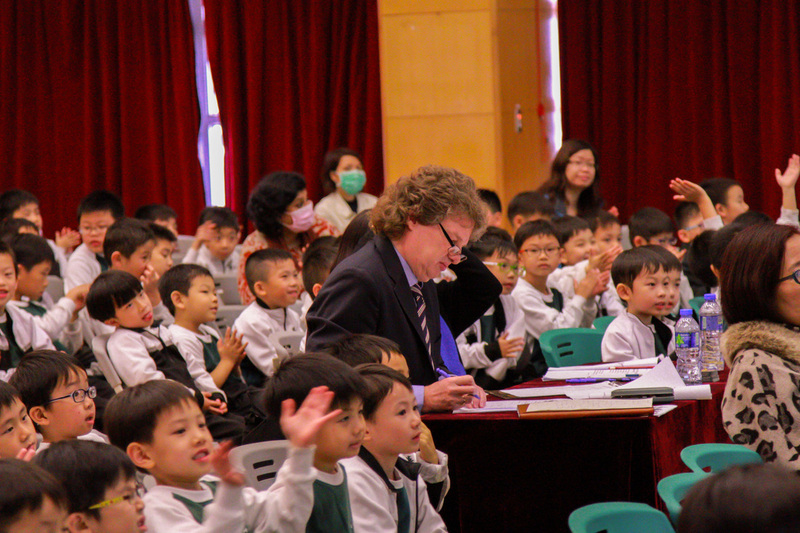 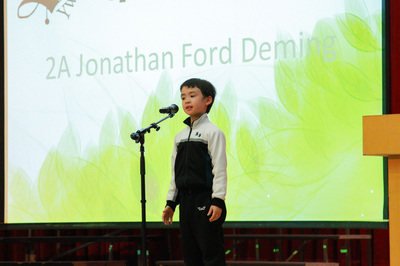 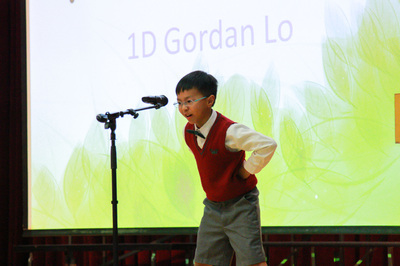 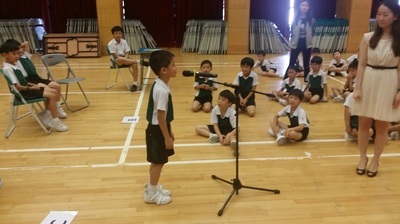 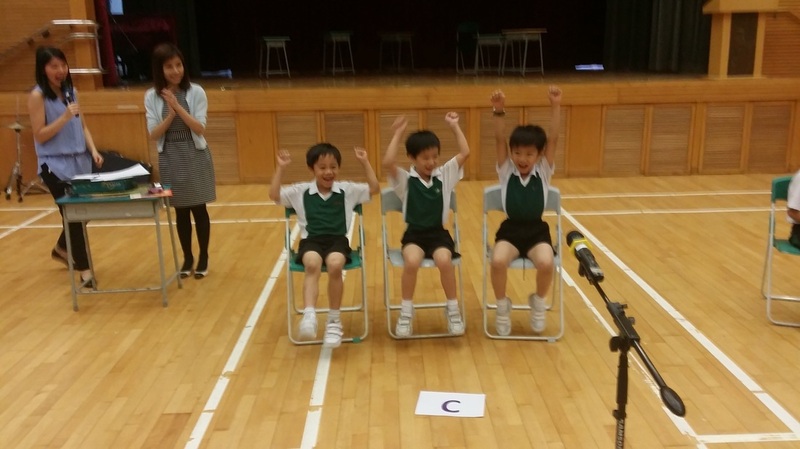 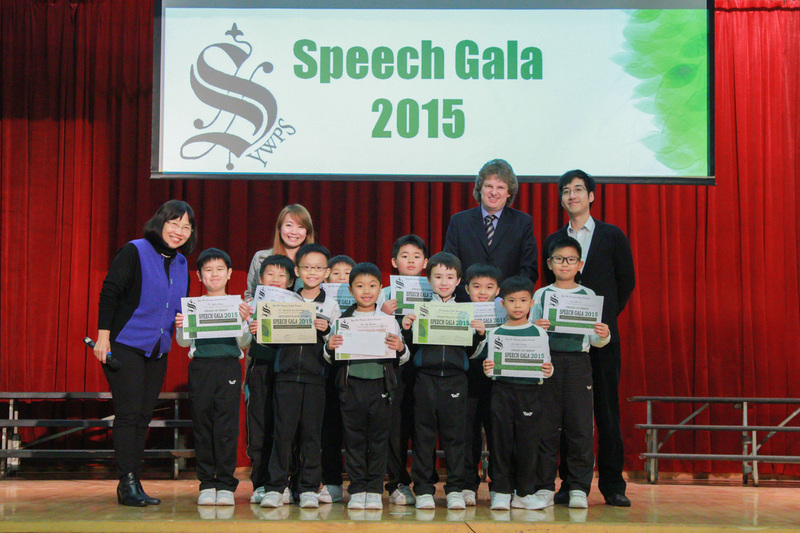 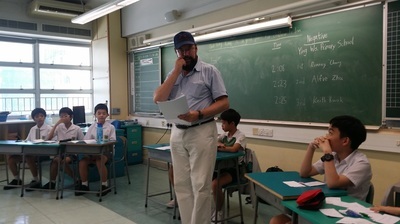 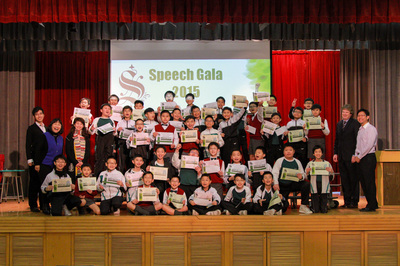 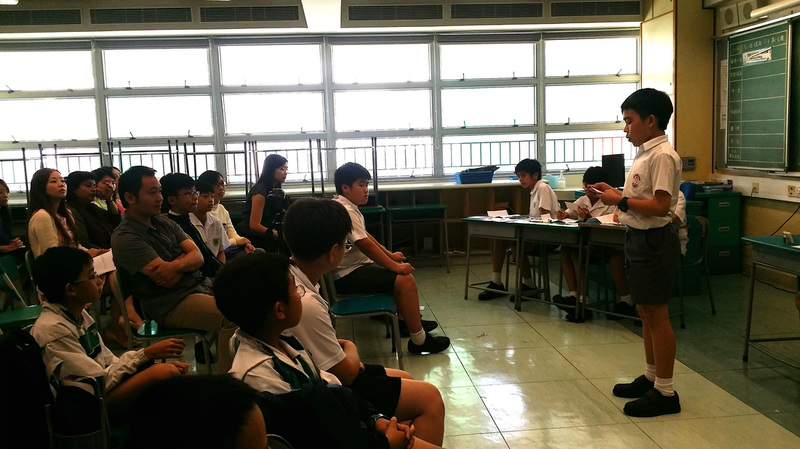 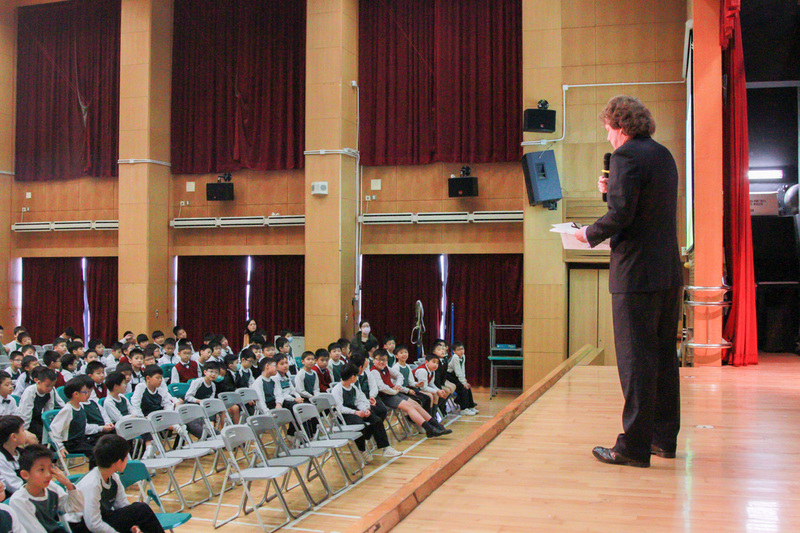 Our first Spelling Bee Competition is successfully held for P.1-3 students in our hall on 5, 8 and 9 June. 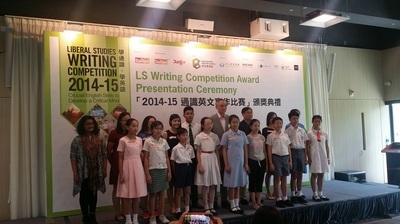 Congratulations to all the winners and participants! How would our boys react to our new issue of FLAME? 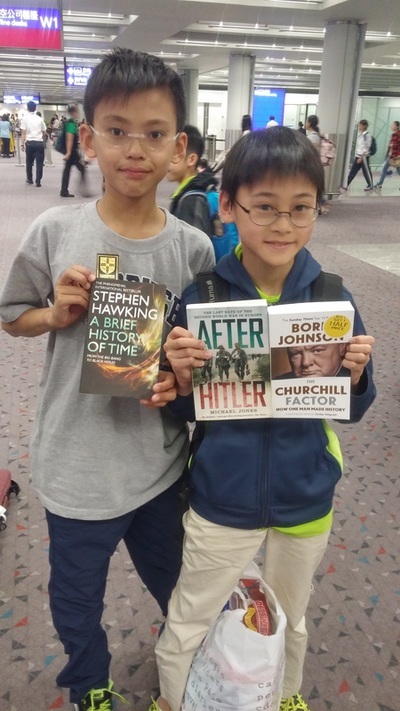 They read it (of course!) 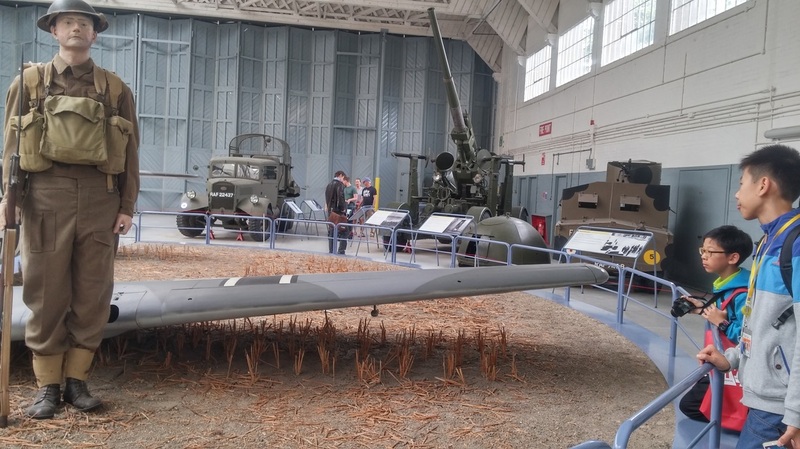 and they celebrated its launch with excitement! 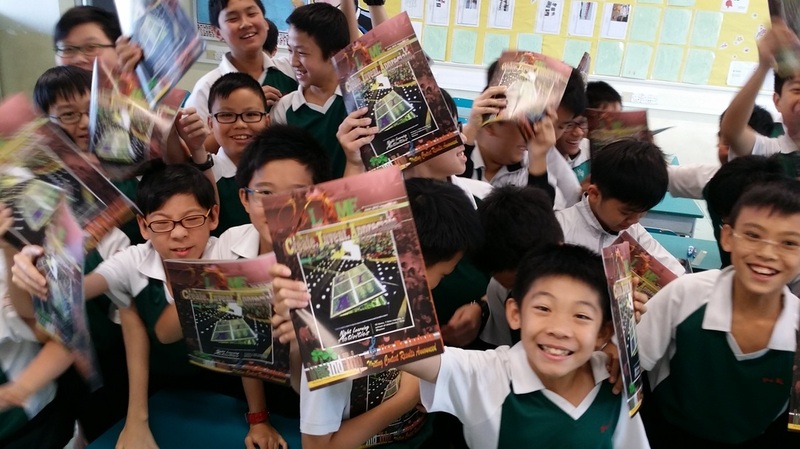 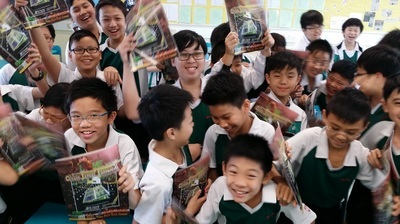 See below some of our boys' happy faces having received this fantastic new issue of our department magazine! 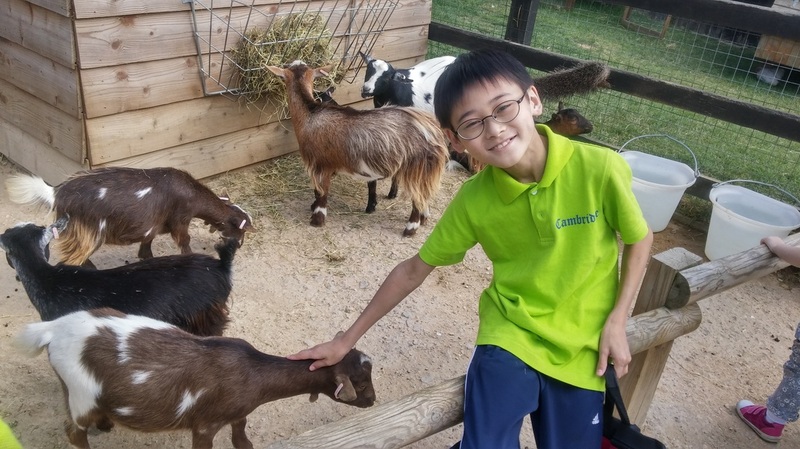 Cyrus Lam (6B) feels good to see his work published. 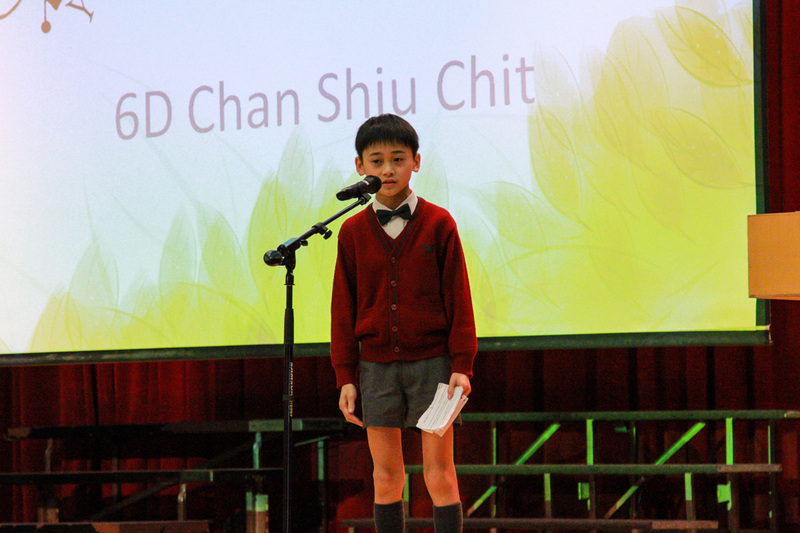 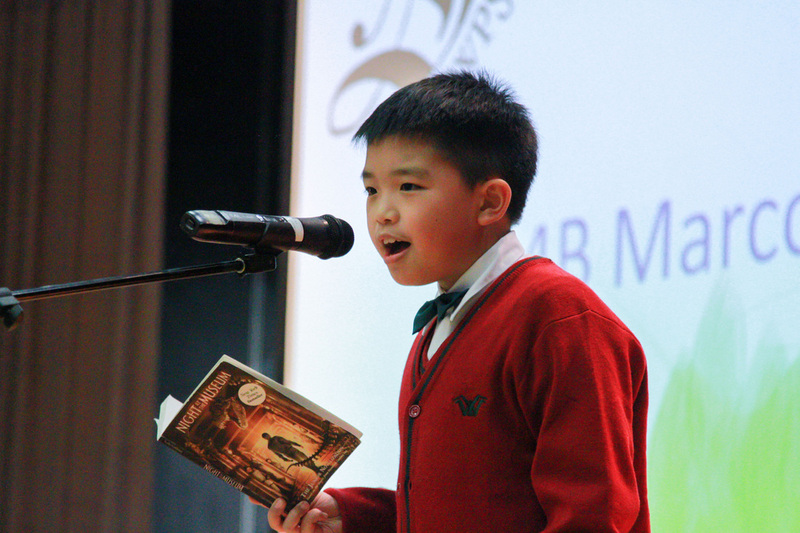 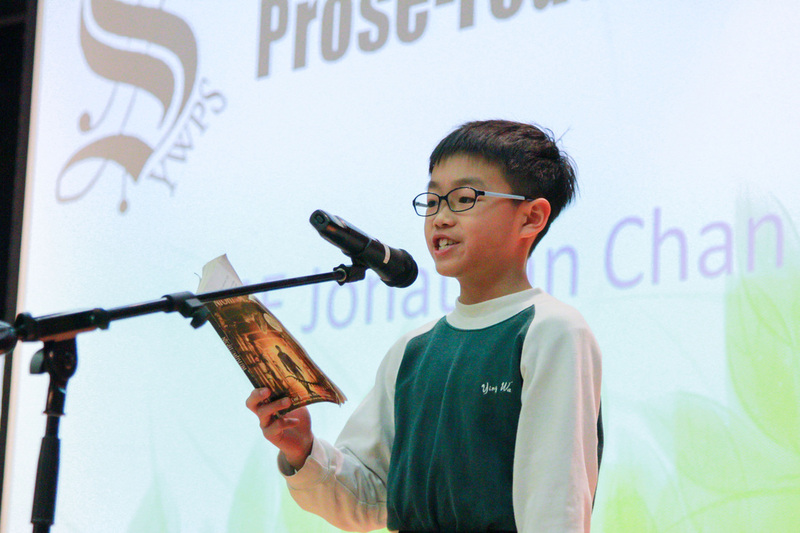 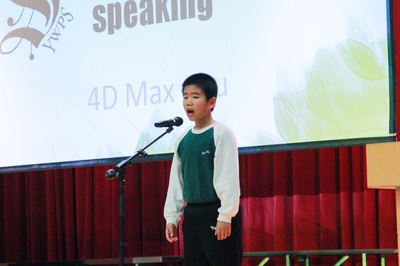 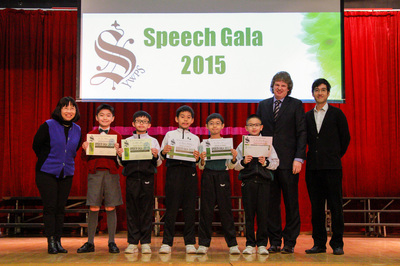 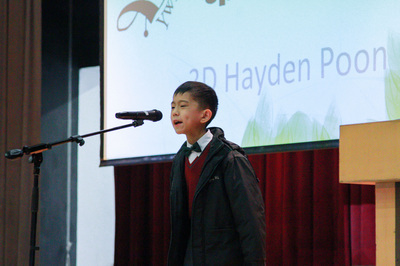 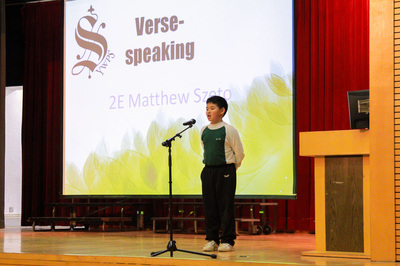 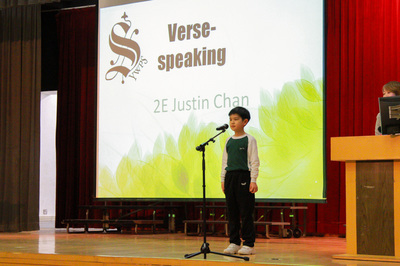 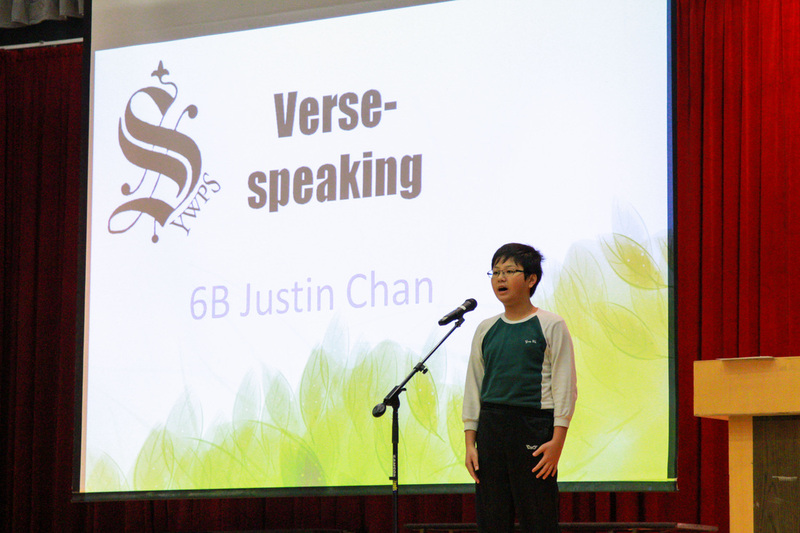 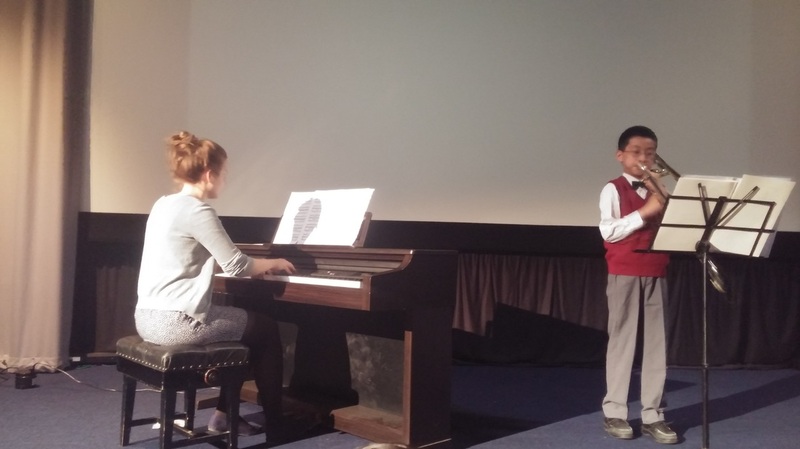 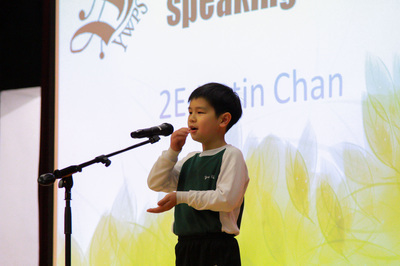 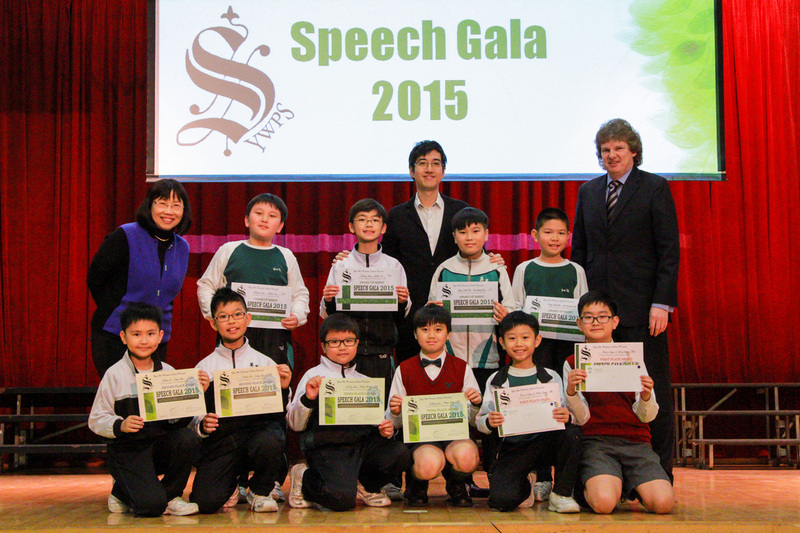 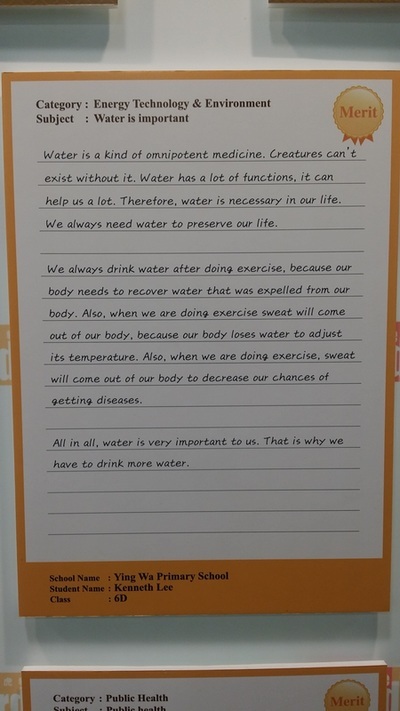 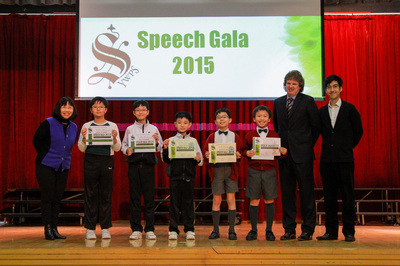 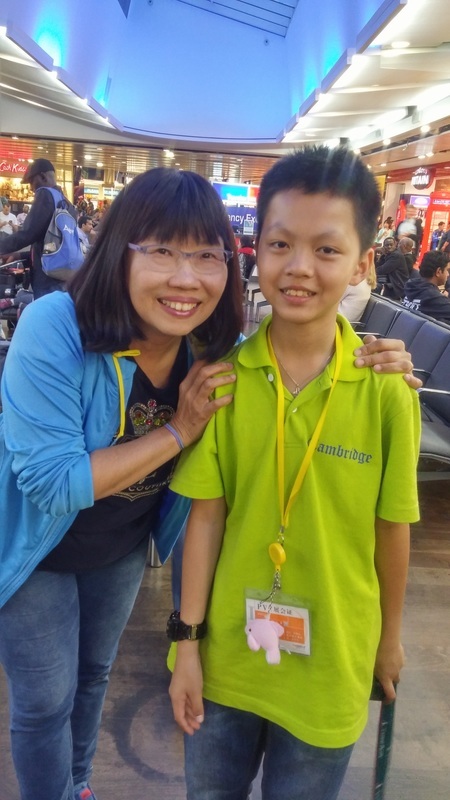 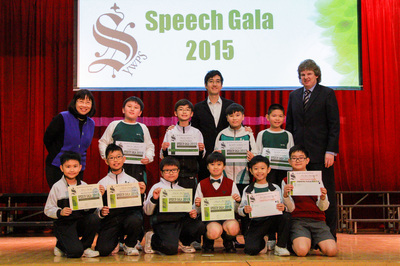 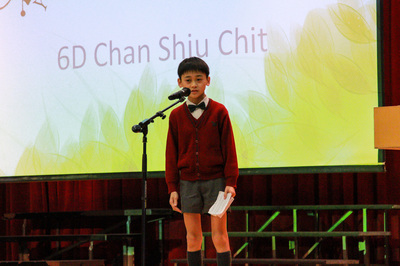 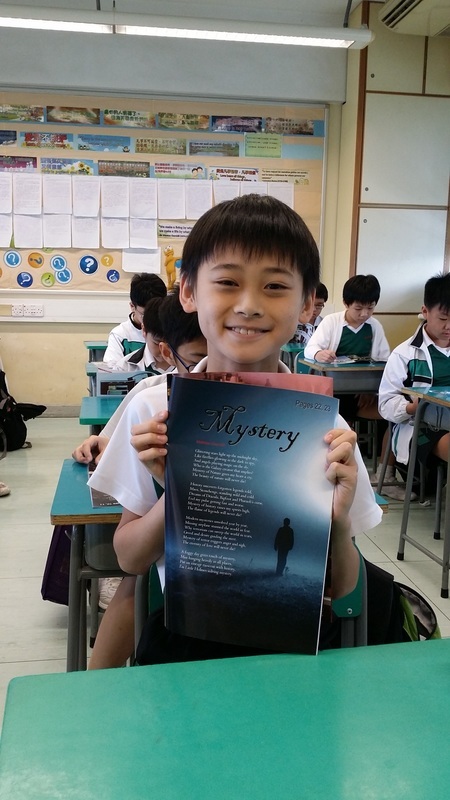 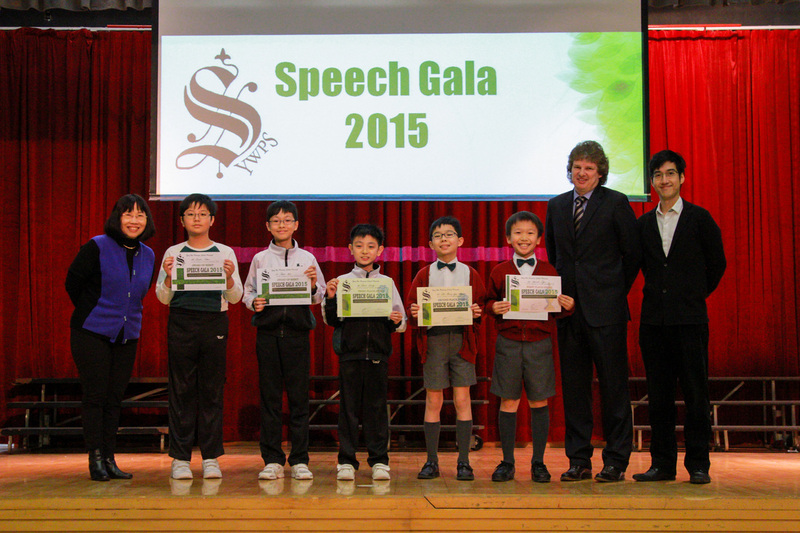 Congratulations to Matthias Chan (6D) who won in the P.6 writing competition with his poem. 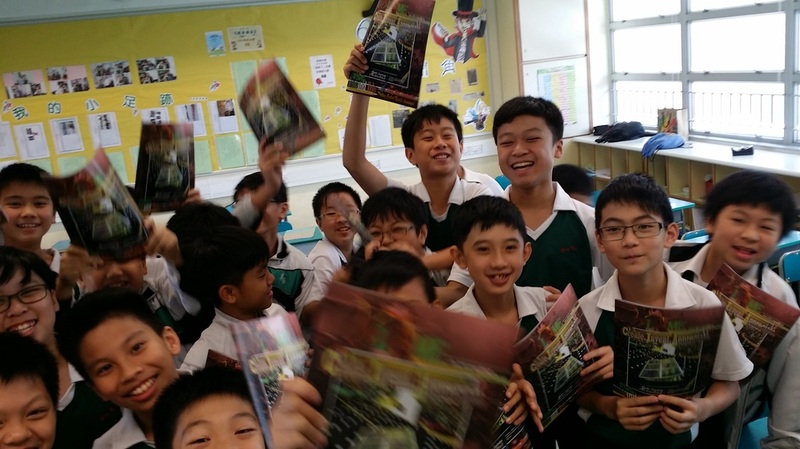 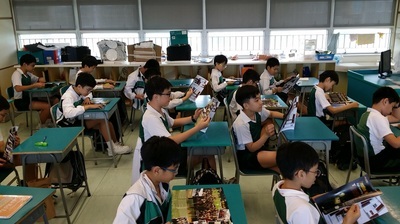 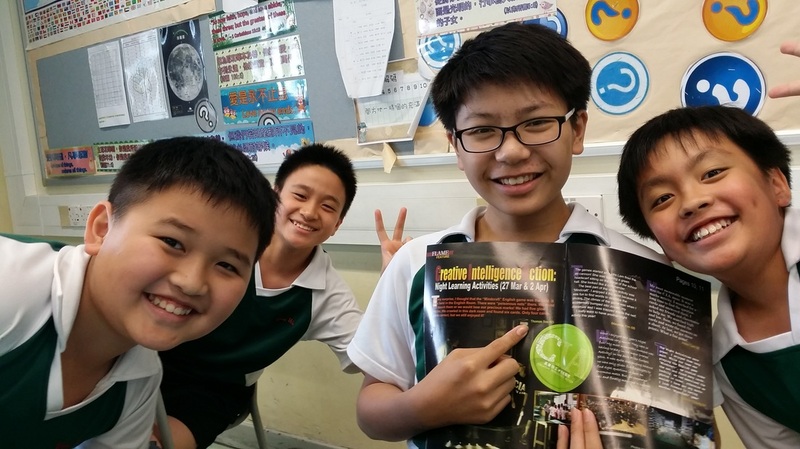 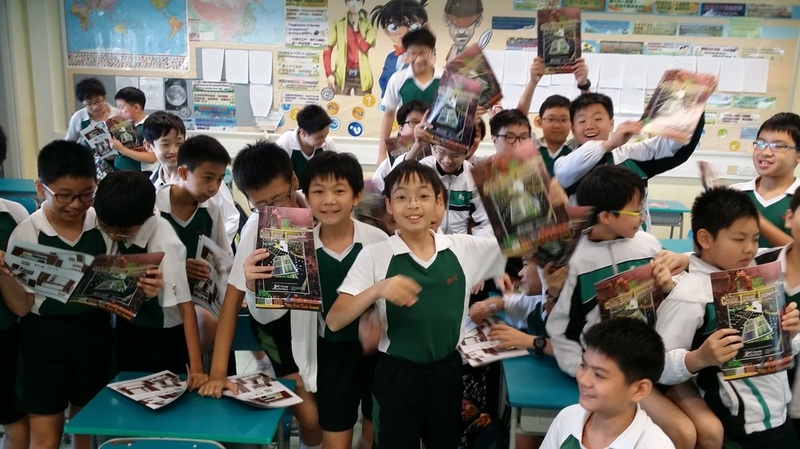 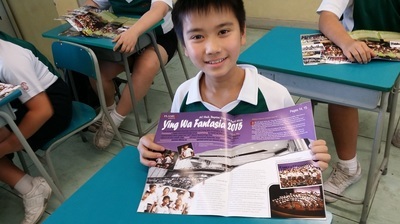 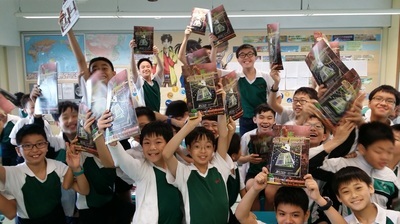 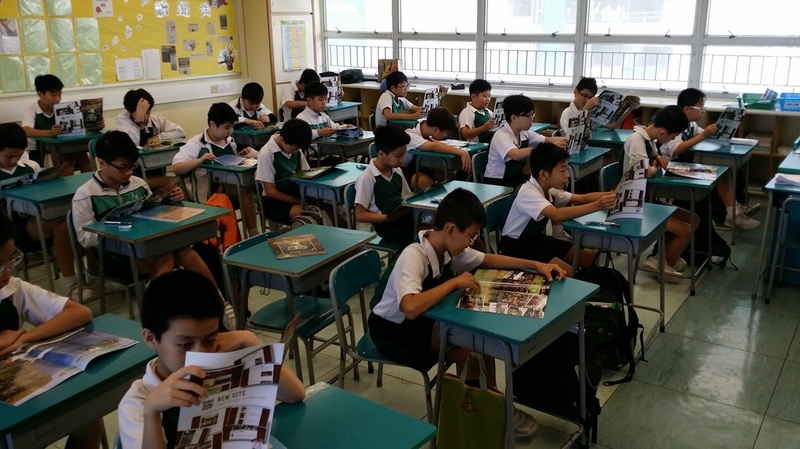 Thomas Soo (6D), pointing at the magazine, is proud of his work in there, supported by his peers! 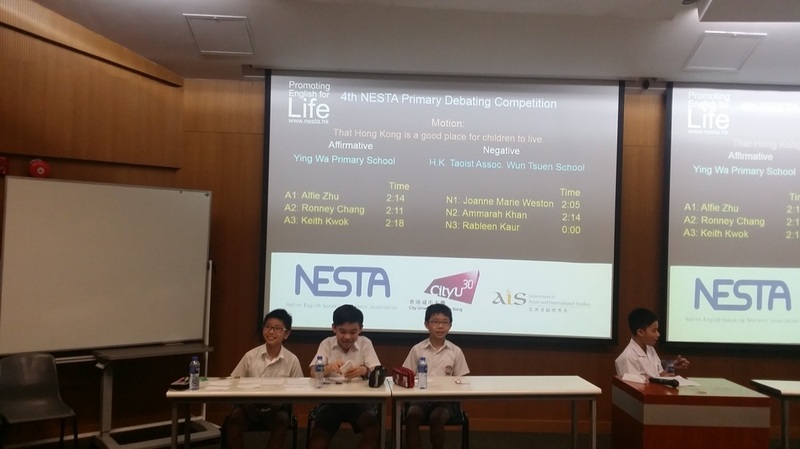 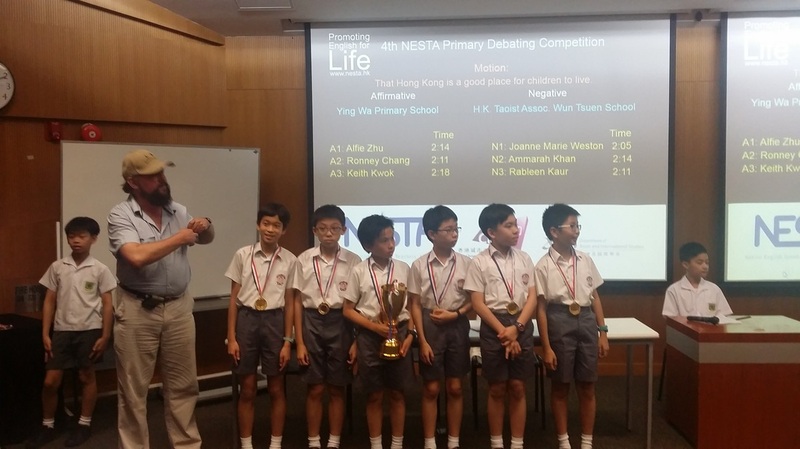 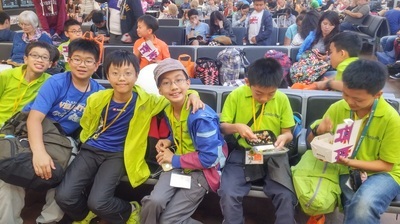 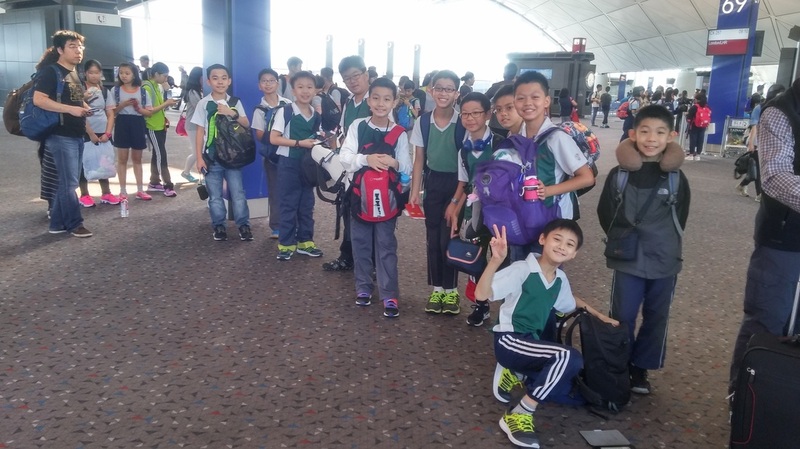 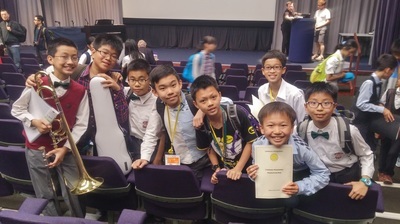 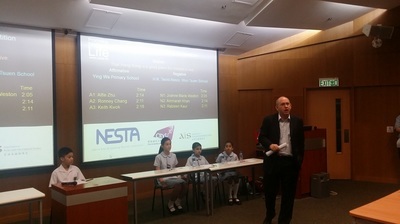 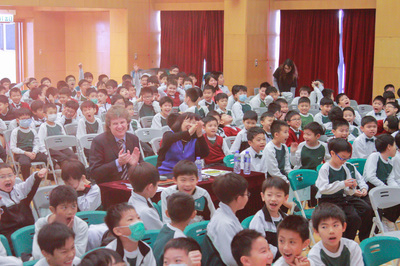 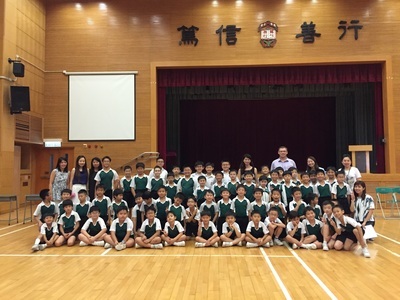 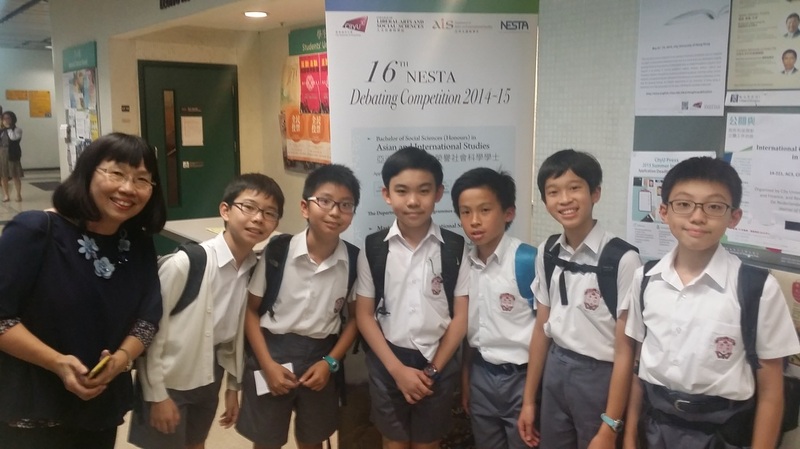 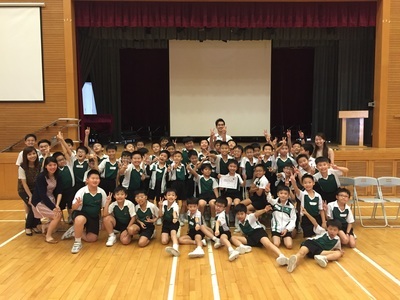 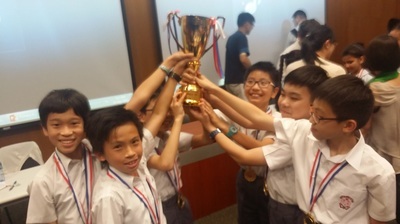 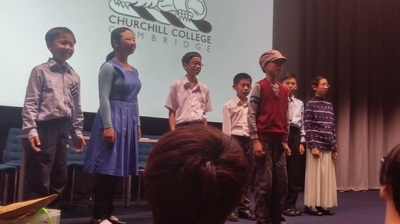 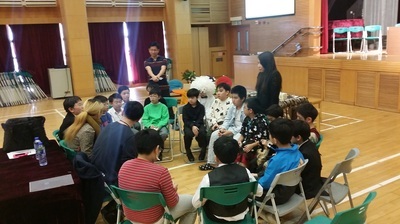 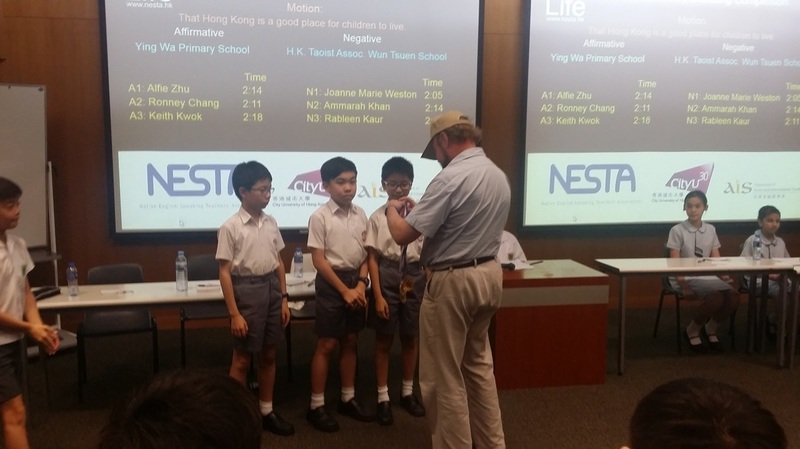 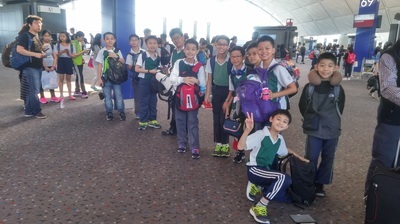 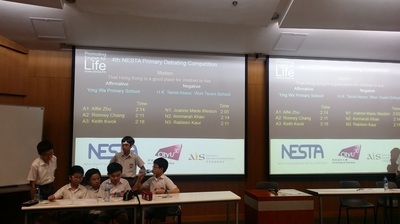 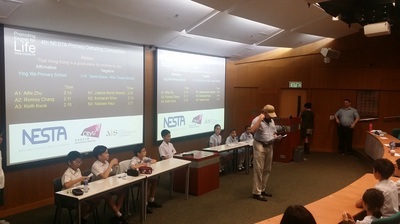 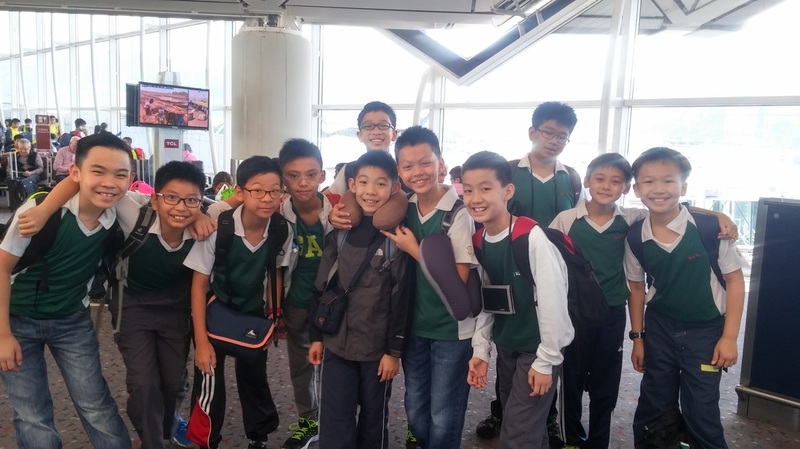 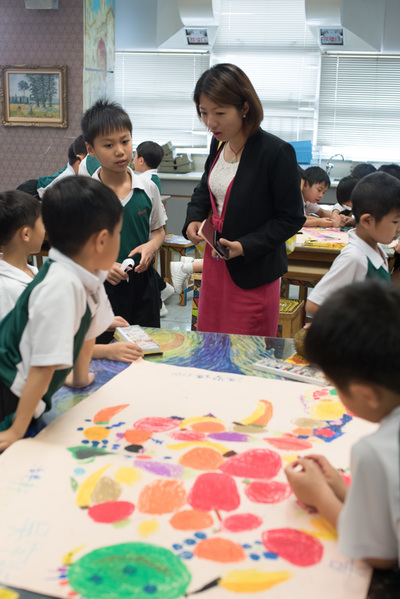 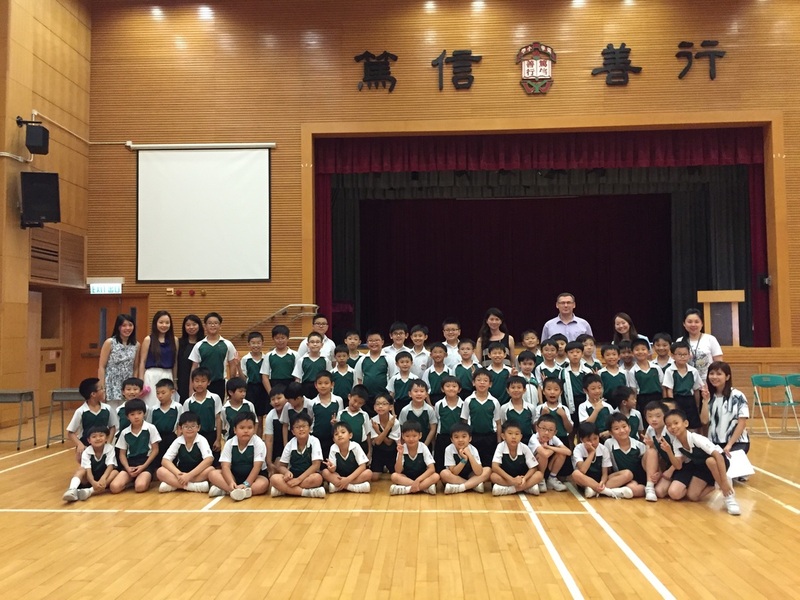 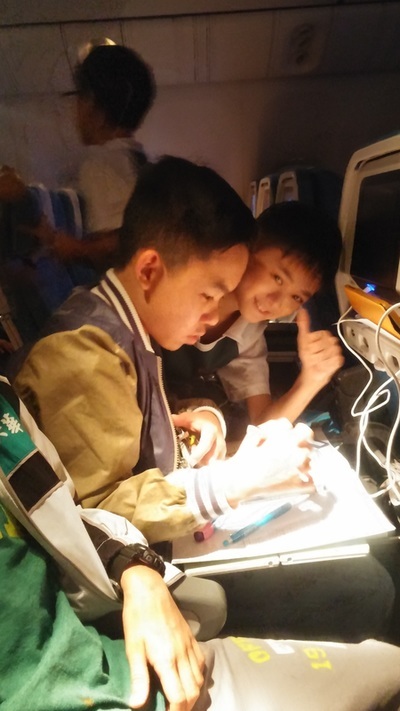 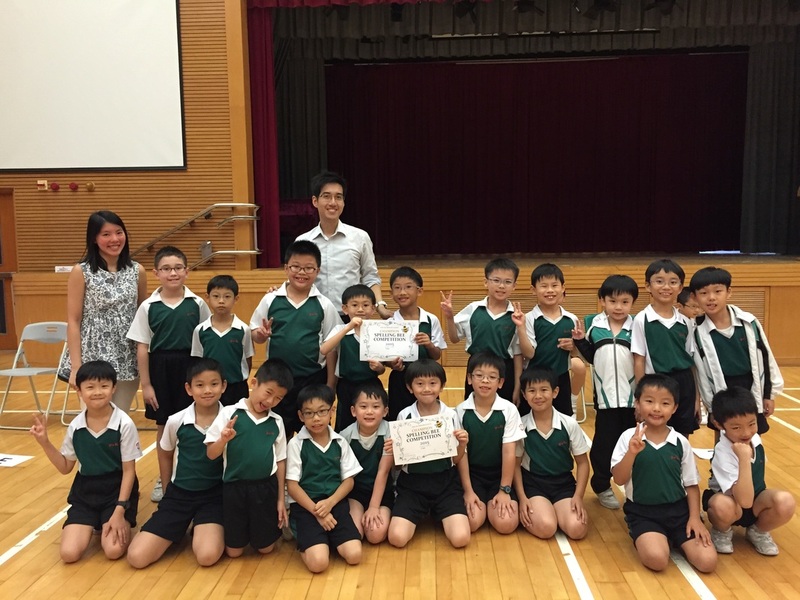 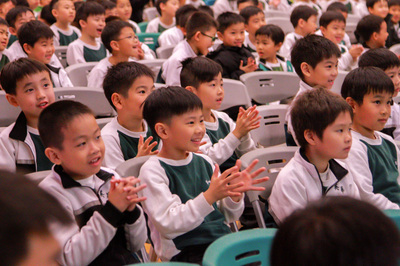 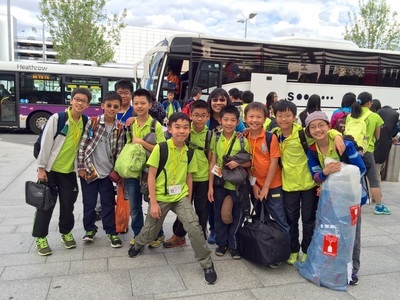 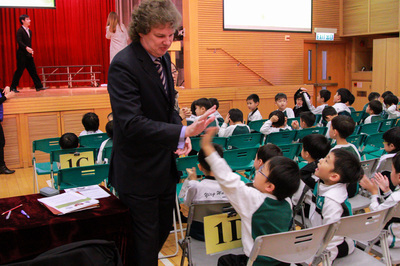 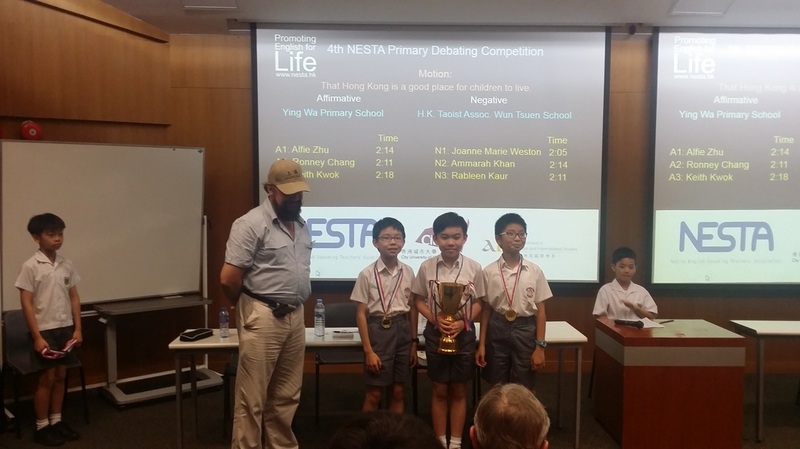 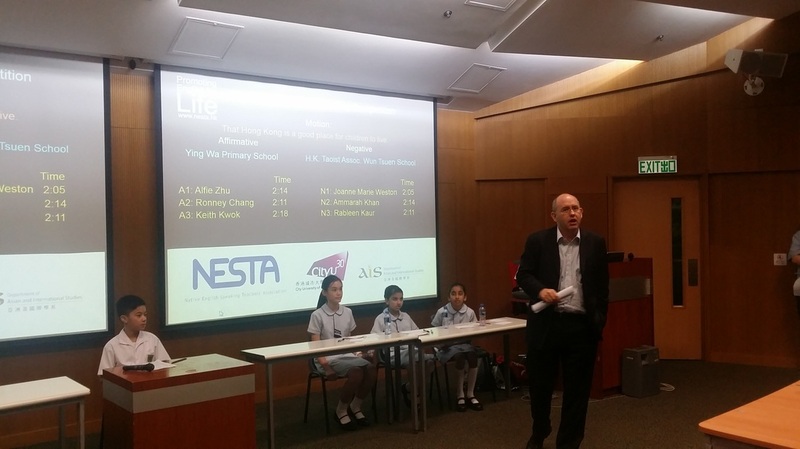 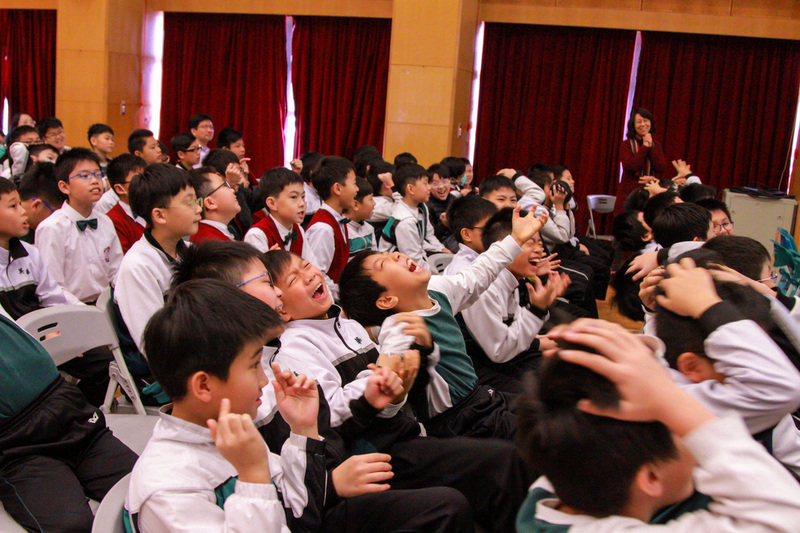 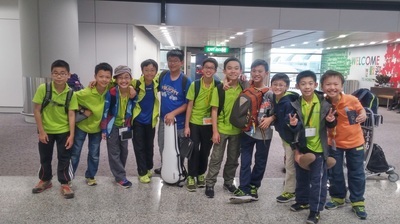 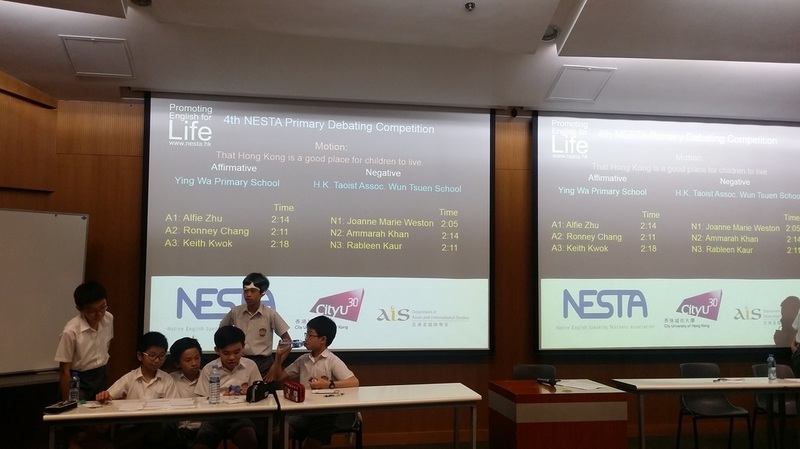 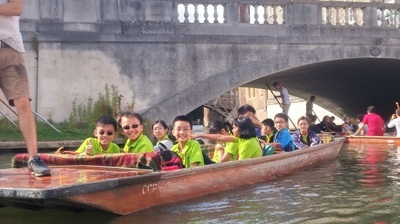 The final match was between Ying Wa Primary School and Hong Kong Taoist Association Wun Tsuen School. 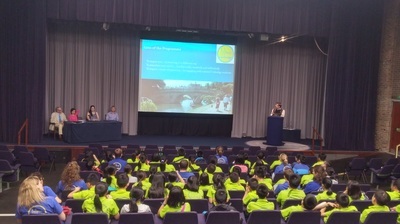 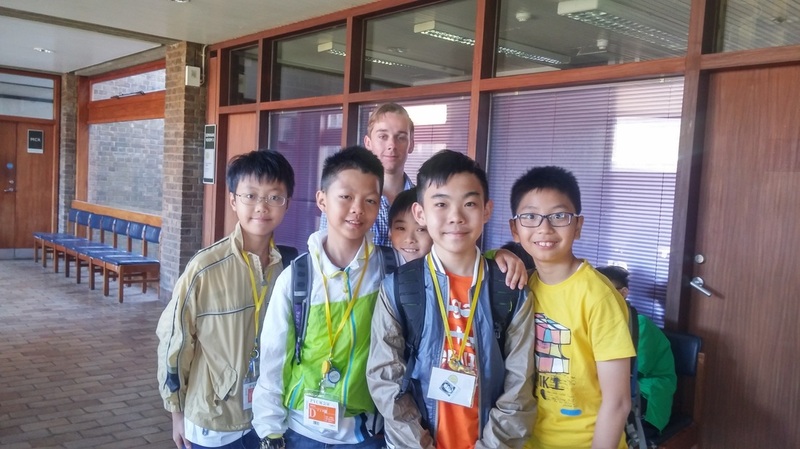 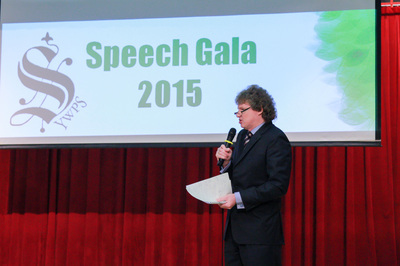 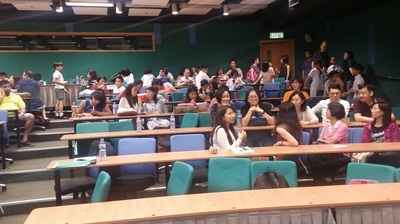 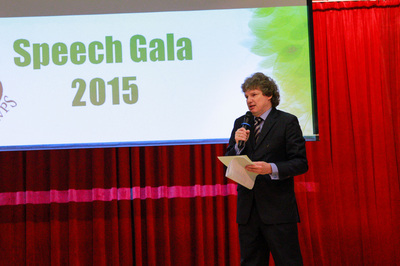 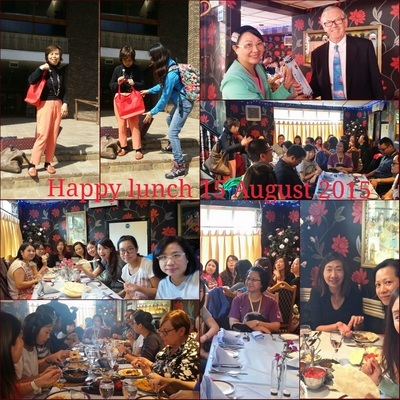 It was held at City University of Hong Kong on 20 May 2015. 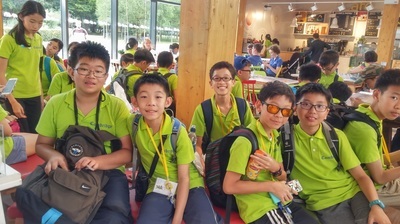 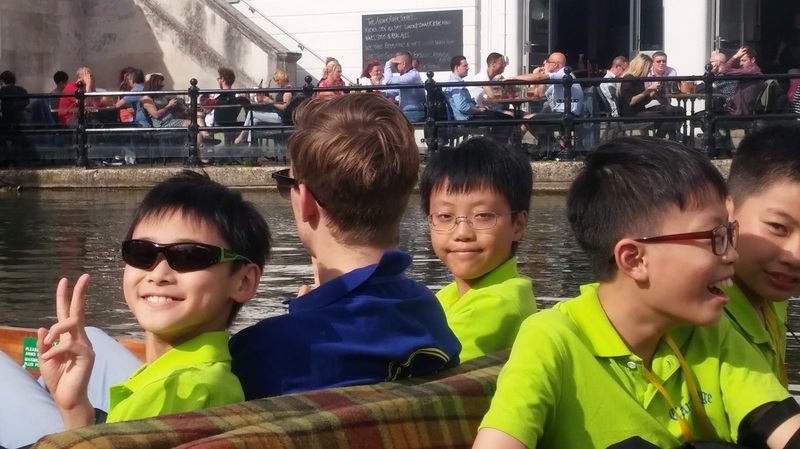 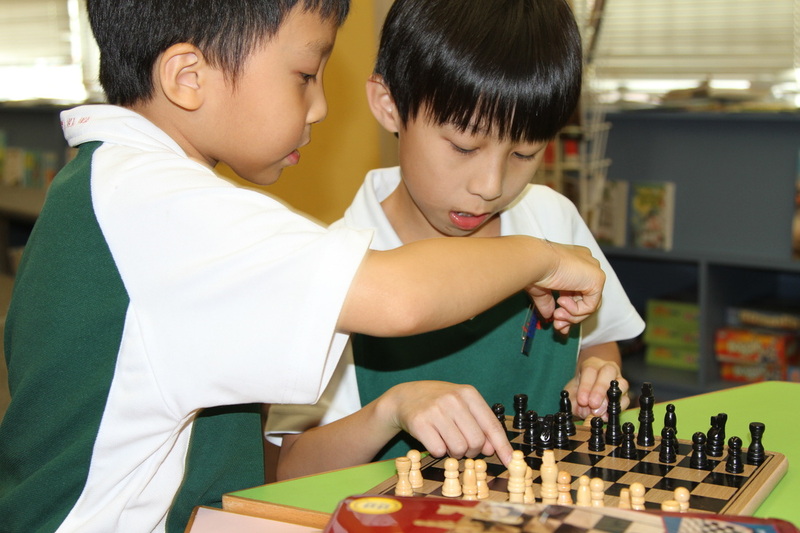 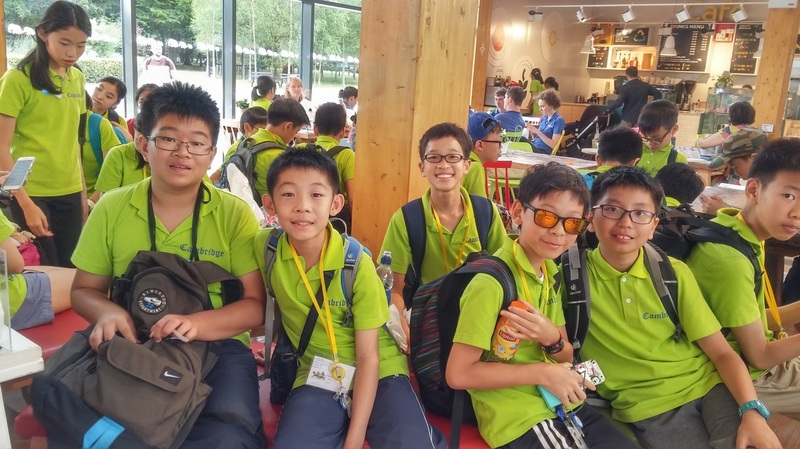 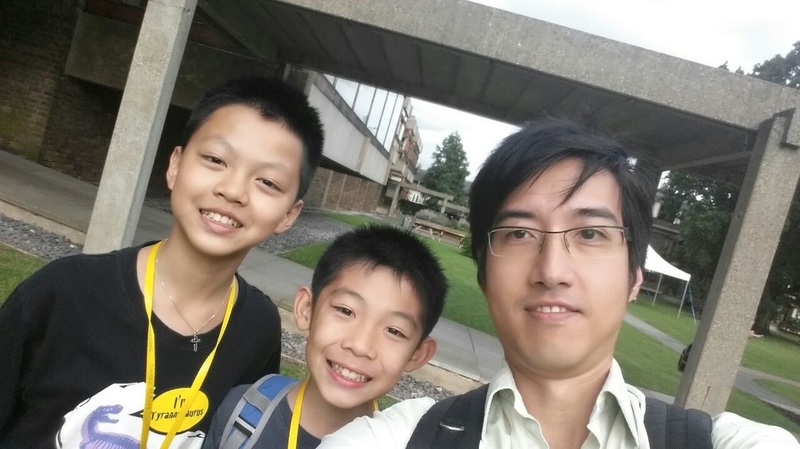 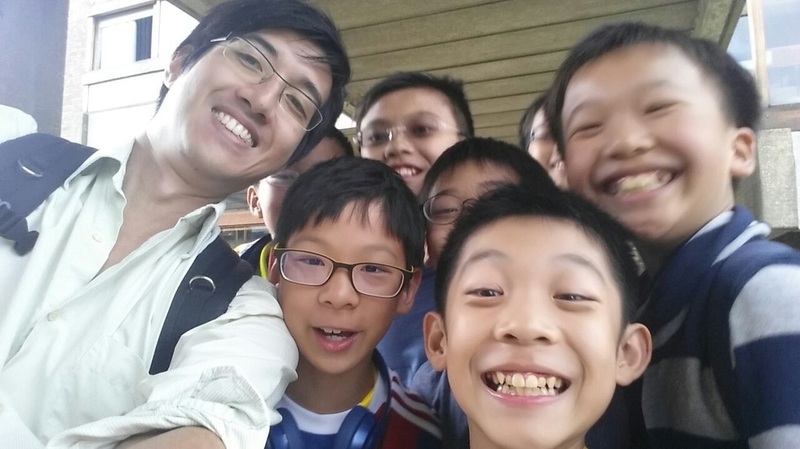 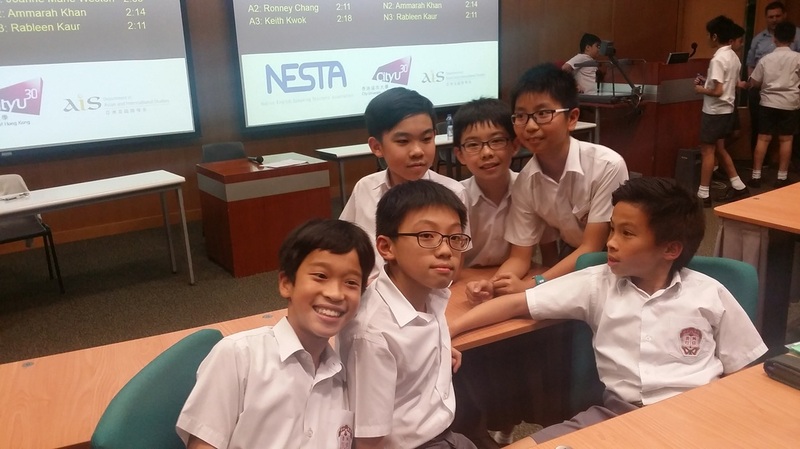 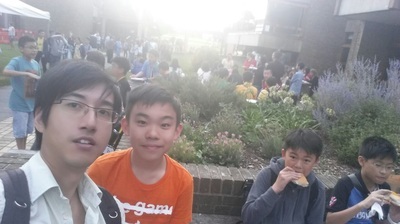 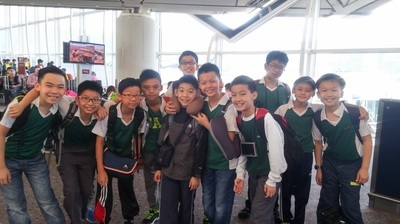 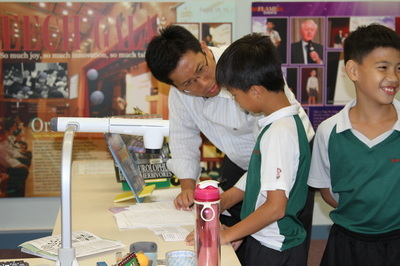 YWPS's team: Ronney Chang (6D), Alfie Zhu (6E) and Keith Kwok (6D). We came second after a high-quality and close game. 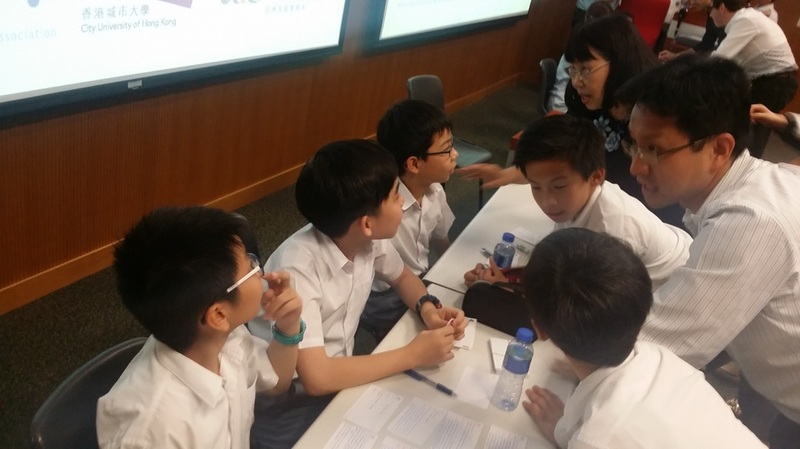 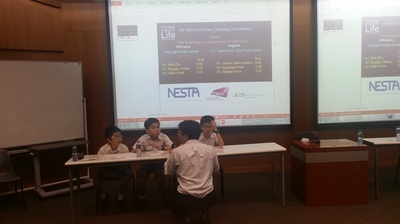 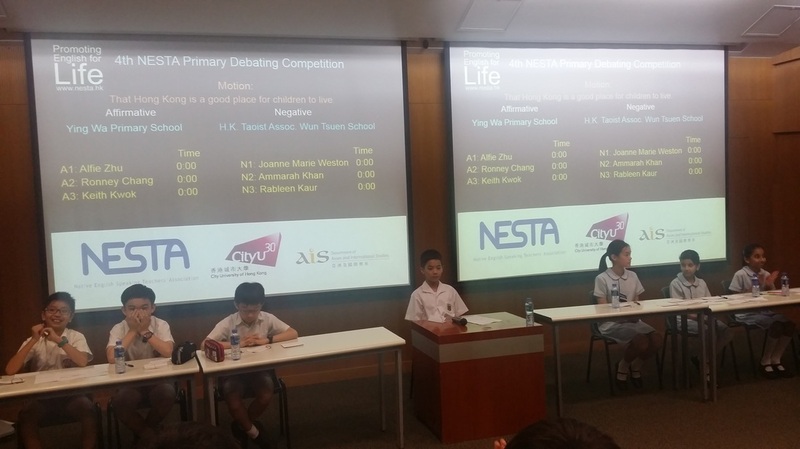 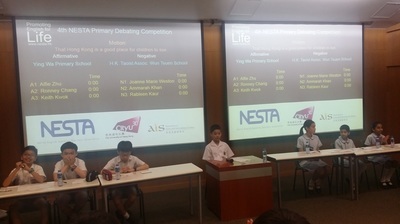 This first Semi-final match was between Pun U Association Wah Yan Primary School and Ying Wa Primary School. 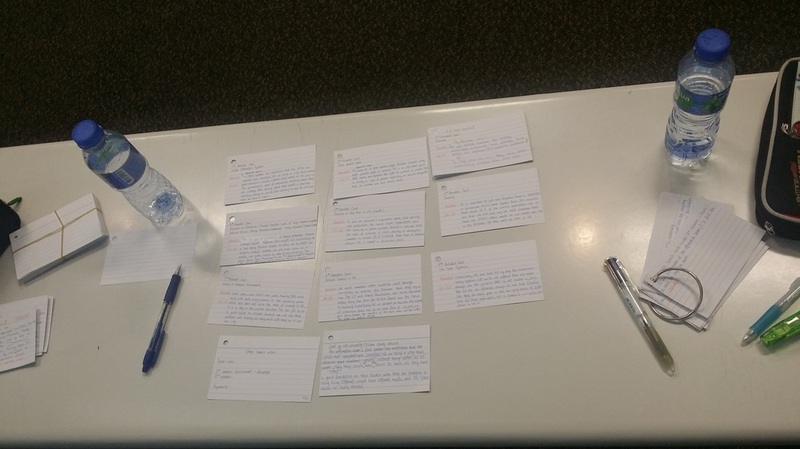 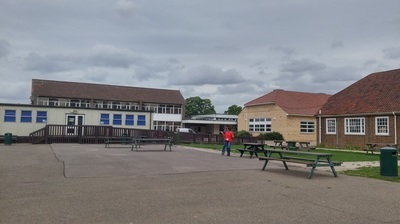 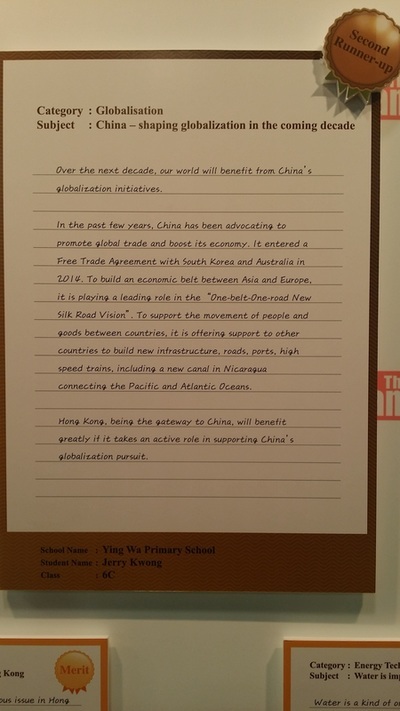 It was hosted by us on 27 April 2015. 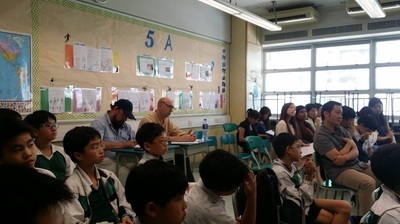 All our English teachers and some enhancement class students observed the match. 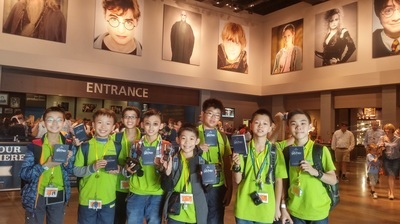 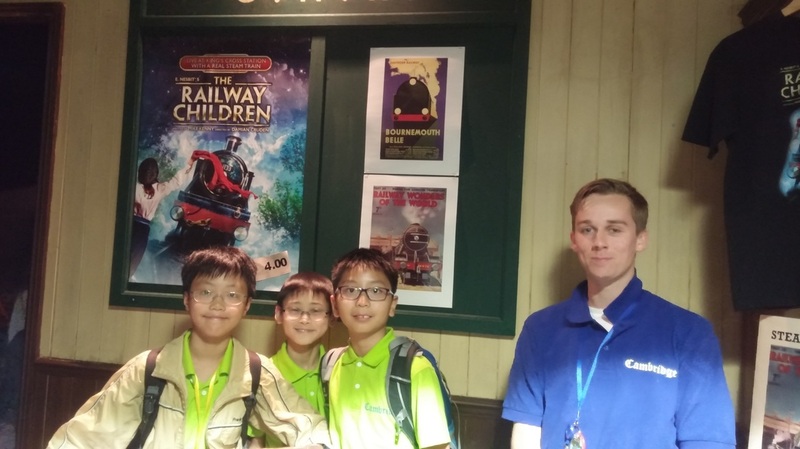 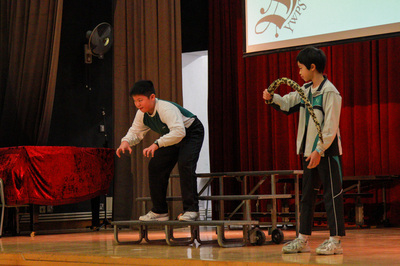 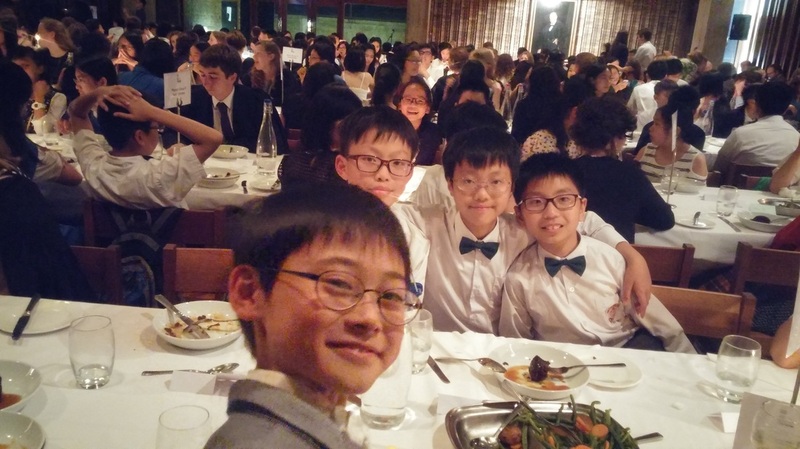 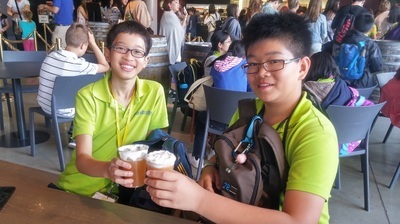 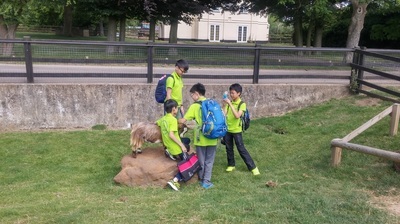 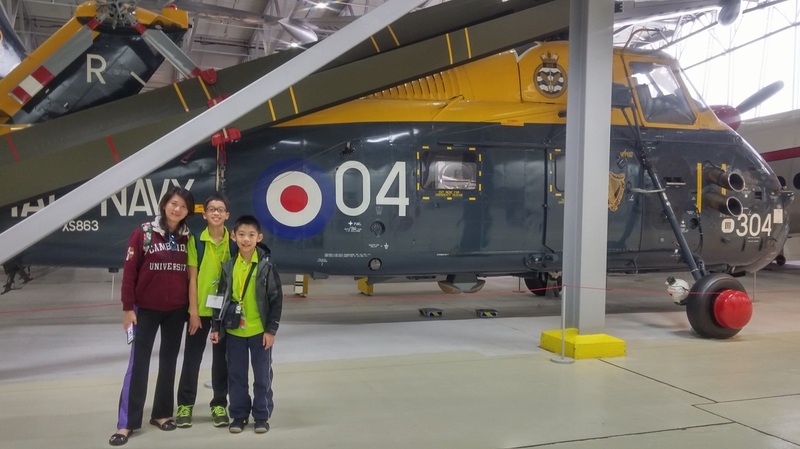 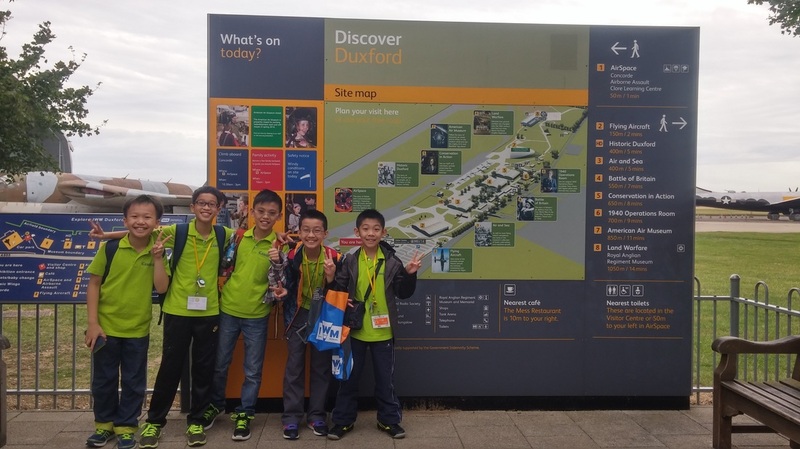 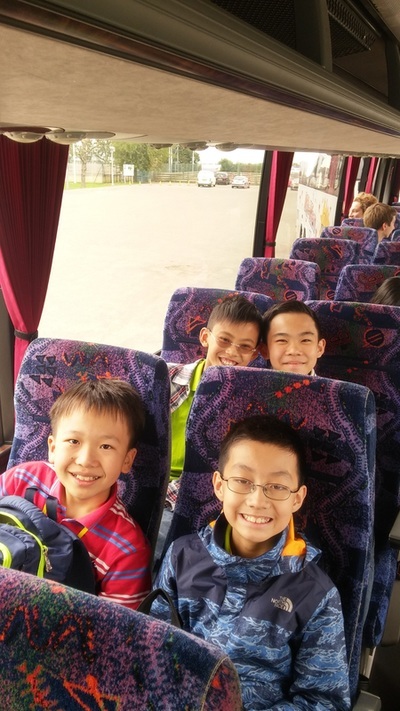 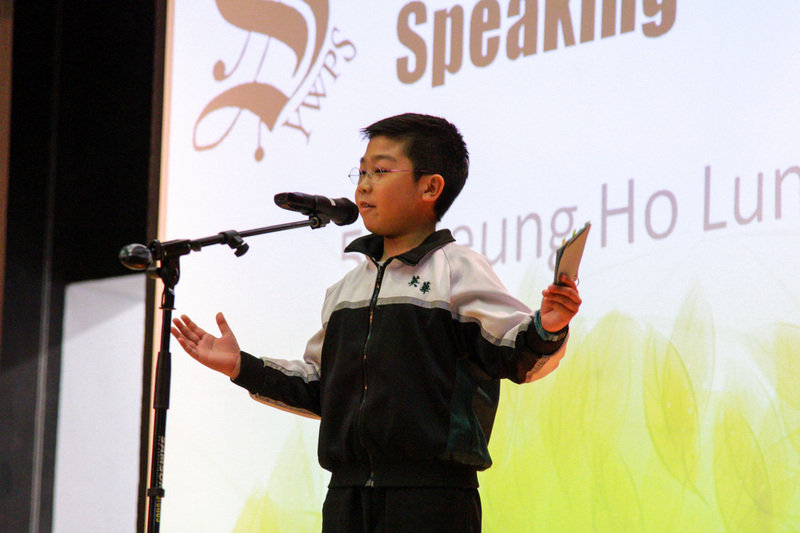 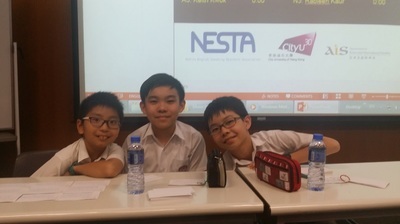 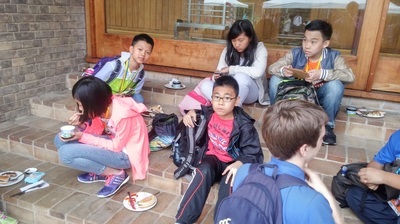 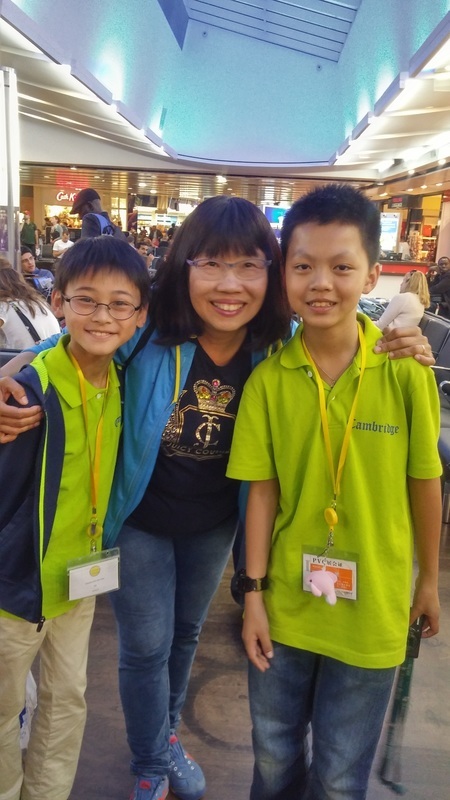 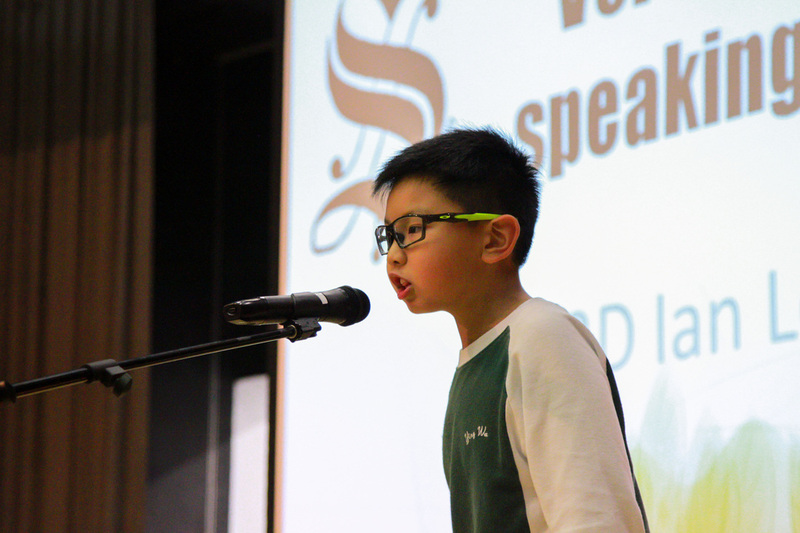 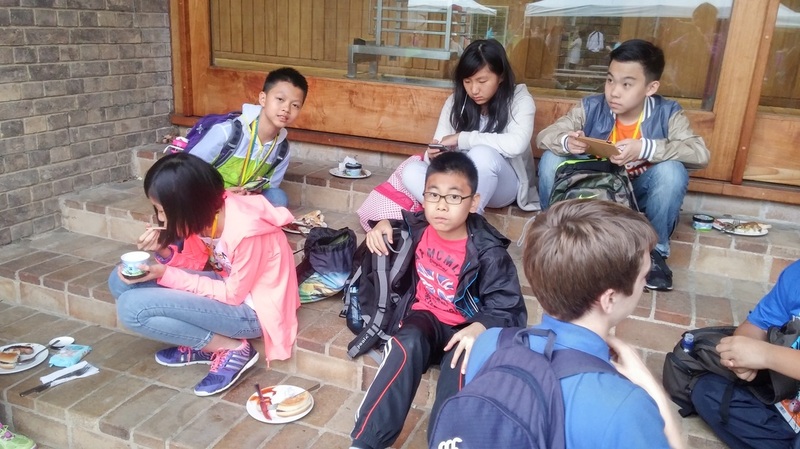 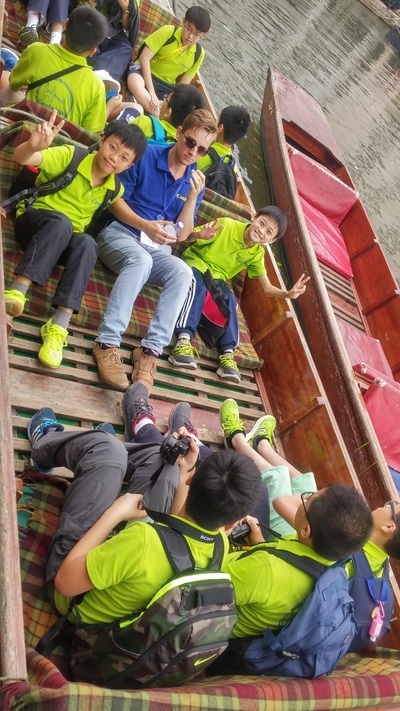 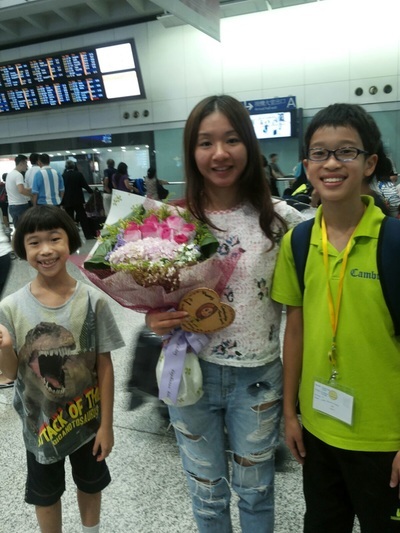 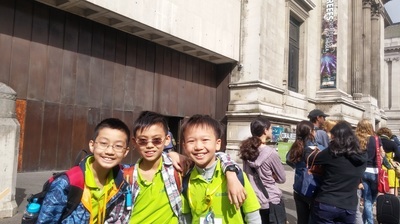 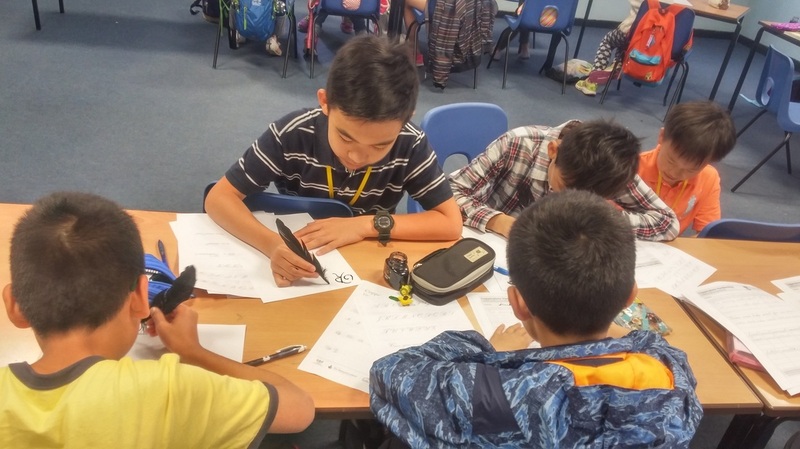 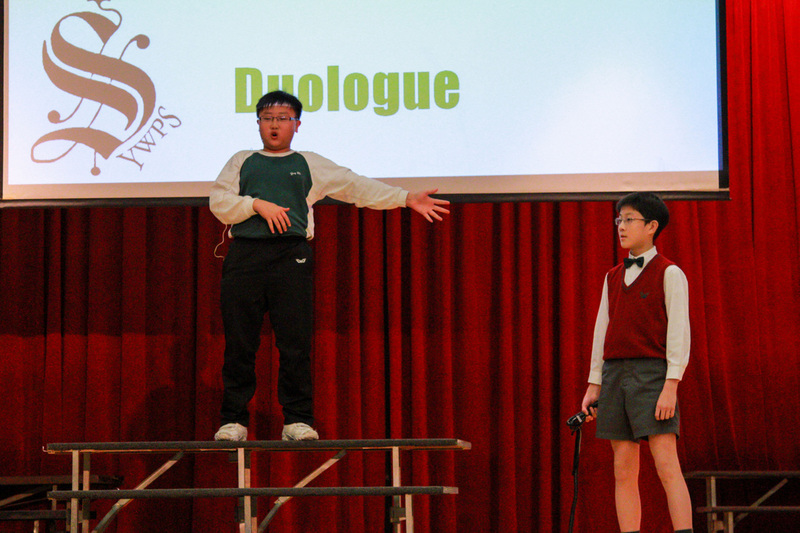 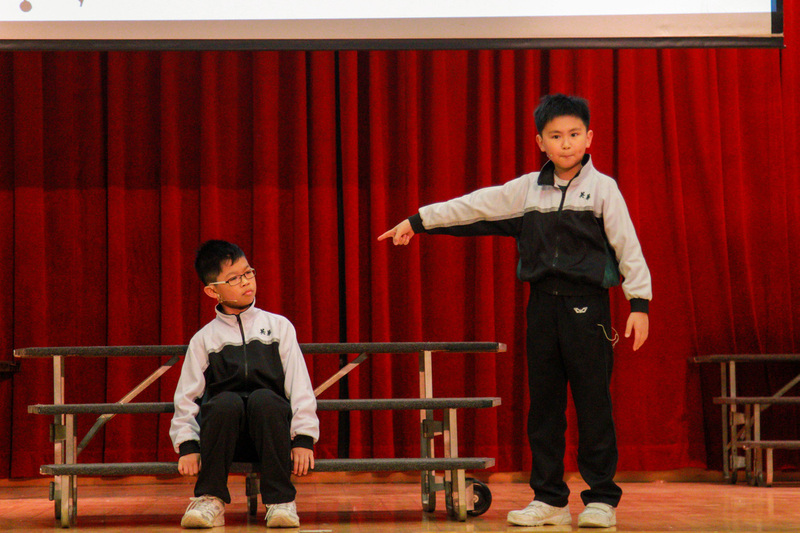 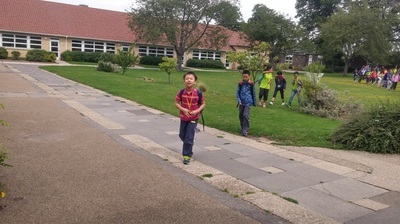 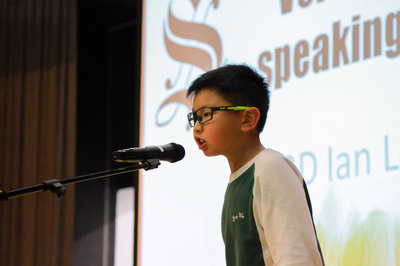 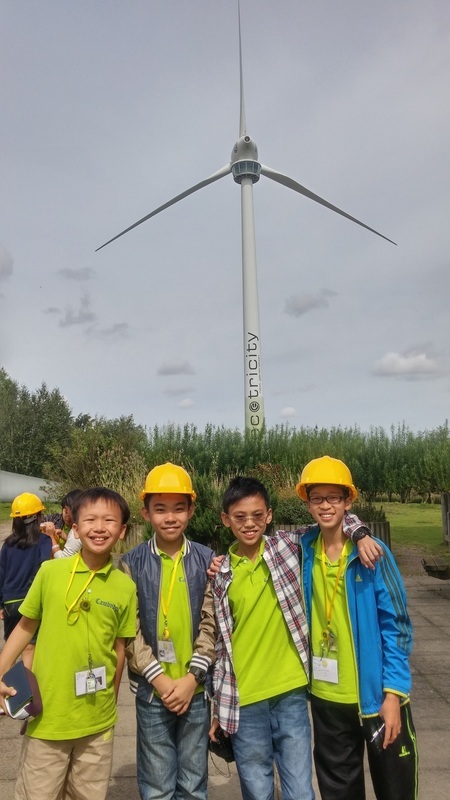 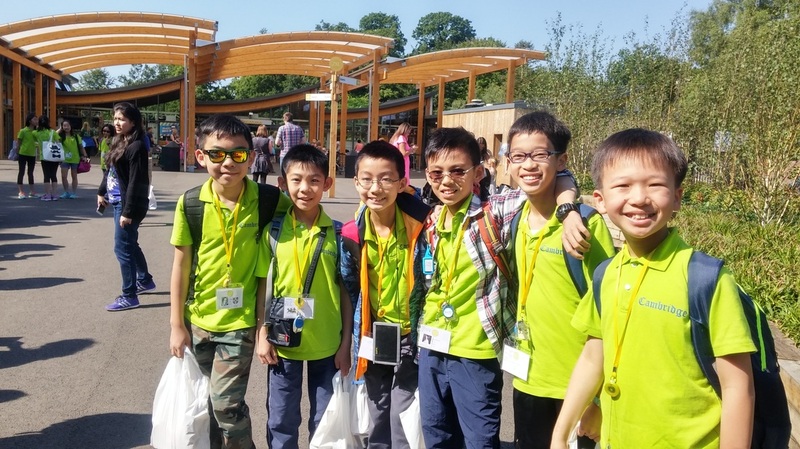 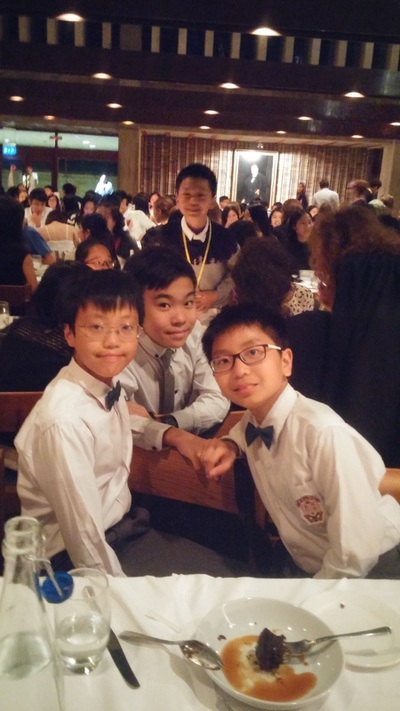 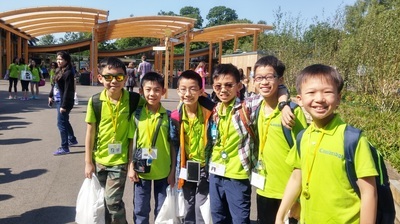 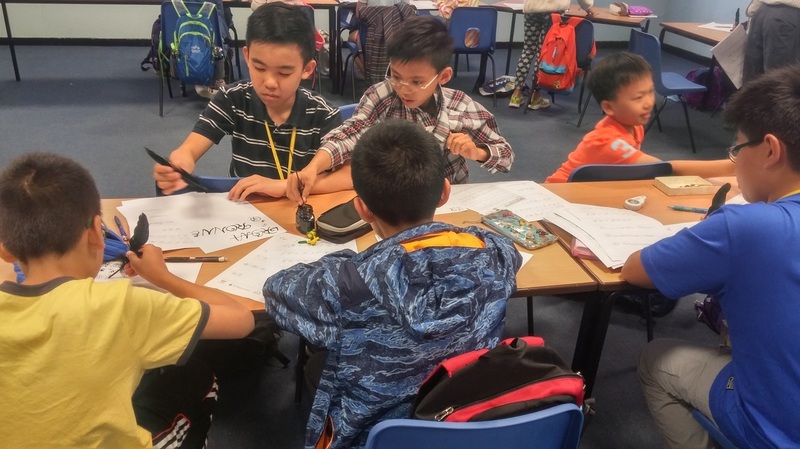 YWPS's team: Ronney Chang, Alfie Zhu and Keith Kwok, all from P.6. 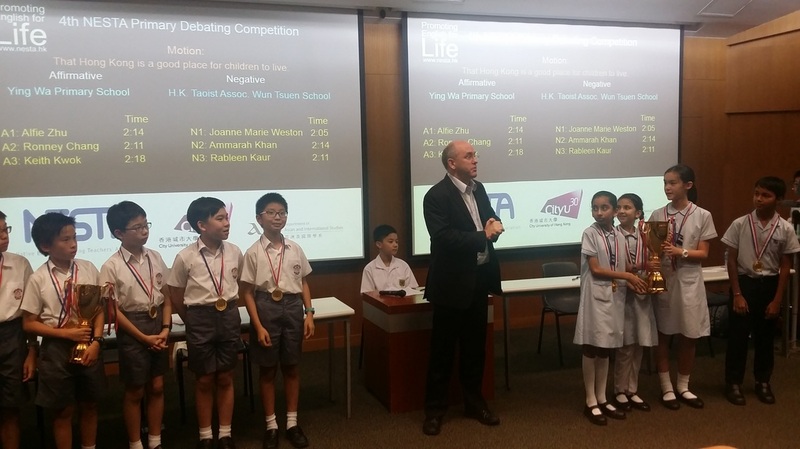 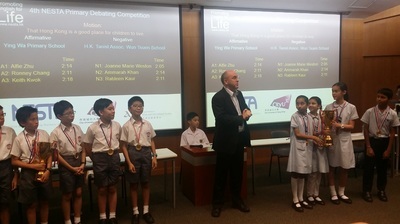 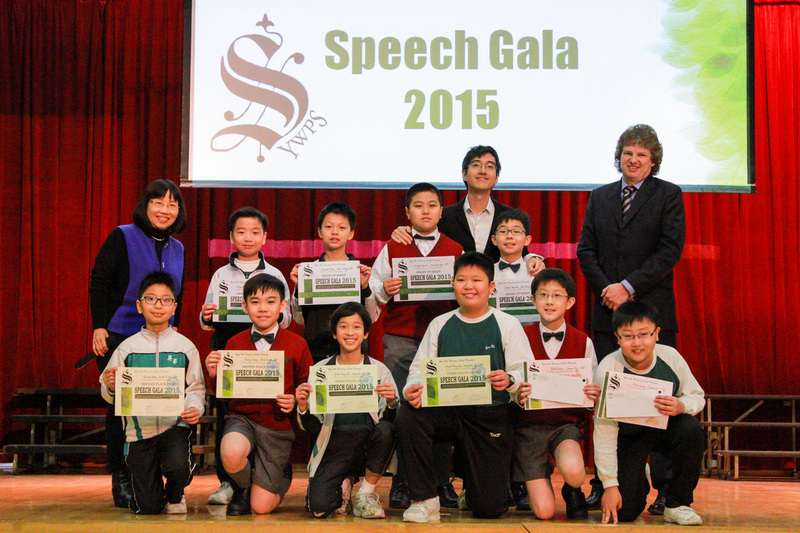 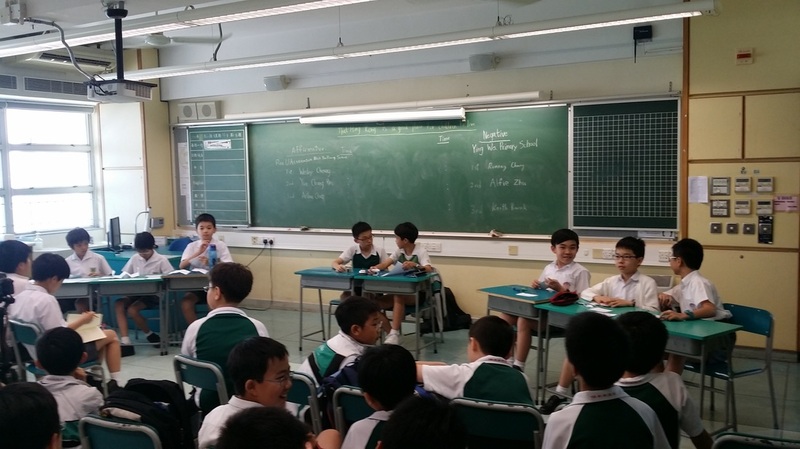 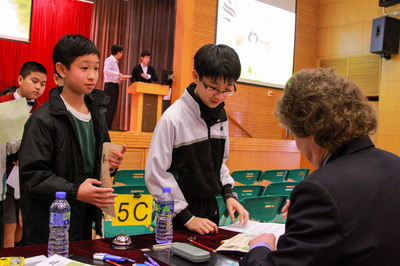 We claimed the winner and Alfie Zhu was named the Best Debater of the match. 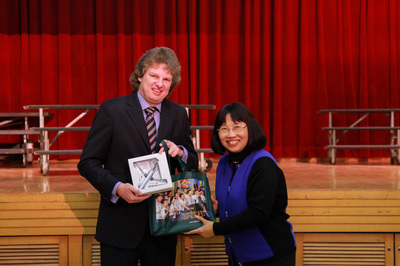 The former principal of the Yuen Yuen Institute MFBM Nei Ming Chan Lui Chung Tak Mem. 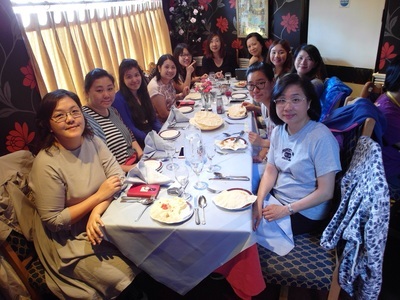 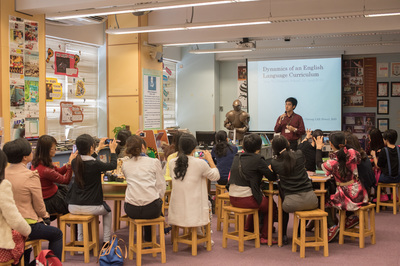 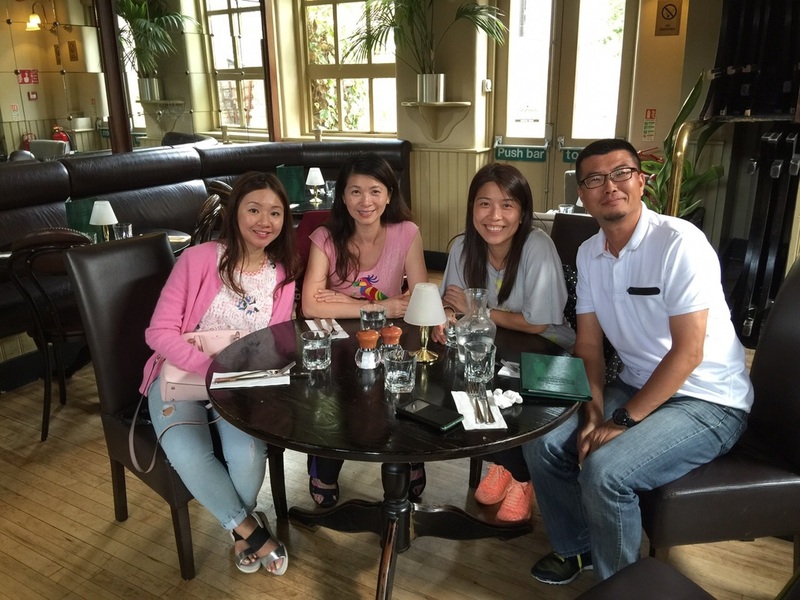 College, Ms Grace Kwok, brought a group of enthusiastic English teachers and school heads from Guangzhou to have professional dialogues with our English Department. 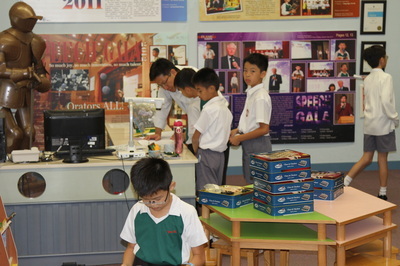 Our ambassadors were excited to serve our guests and the sharing session in the English Room was mutually beneficial. 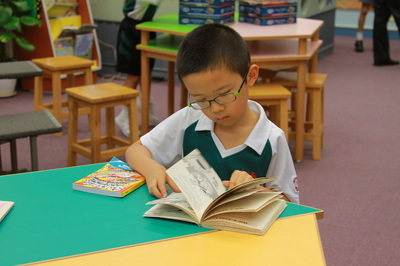 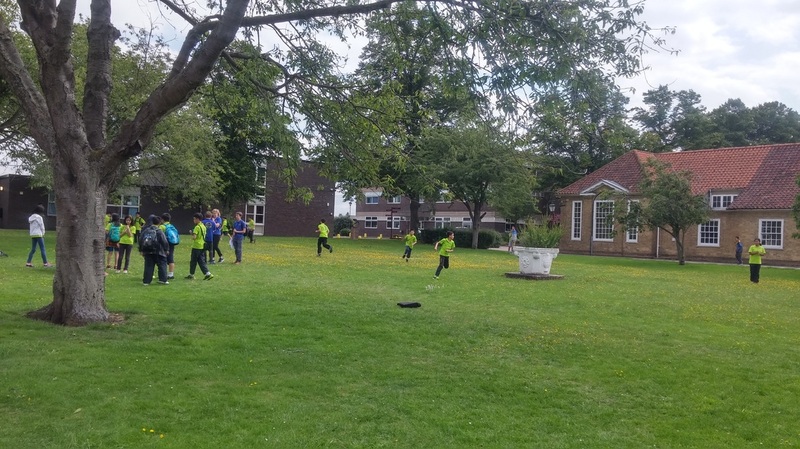 Take a look at our daily English Room activities!